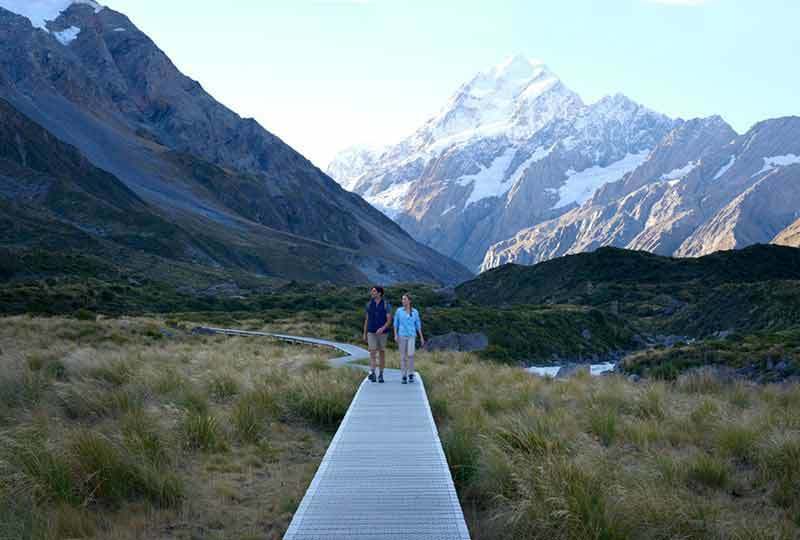 Auckland ◦ Walking tour Auckland’s coastal trails ◦ Waitomo Caves ◦ Tongariro National Park and Tongariro Crossing ◦ Wellington ◦ Queenstown ◦ Milford Sound Cruise ◦ Aoraki Mt Cook ◦ Christchurch. 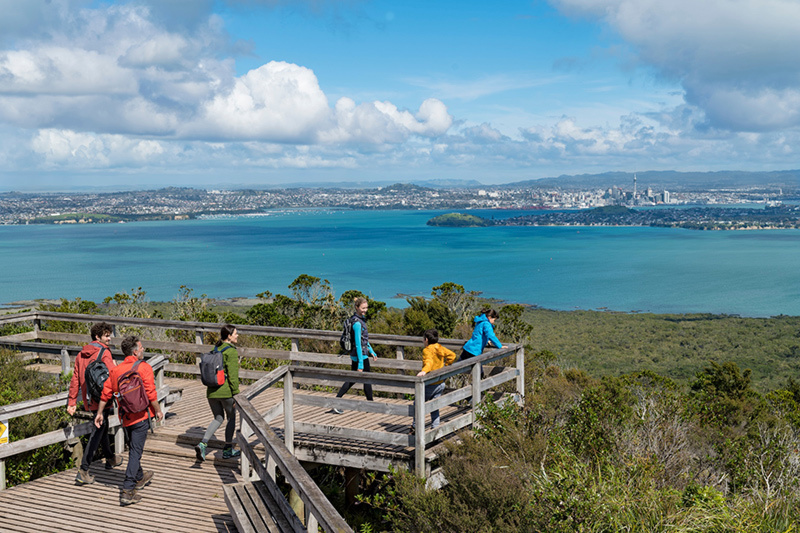 Auckland is not only the biggest city in New Zealand, it's also the gateway to some amazing local scenery and experiences. 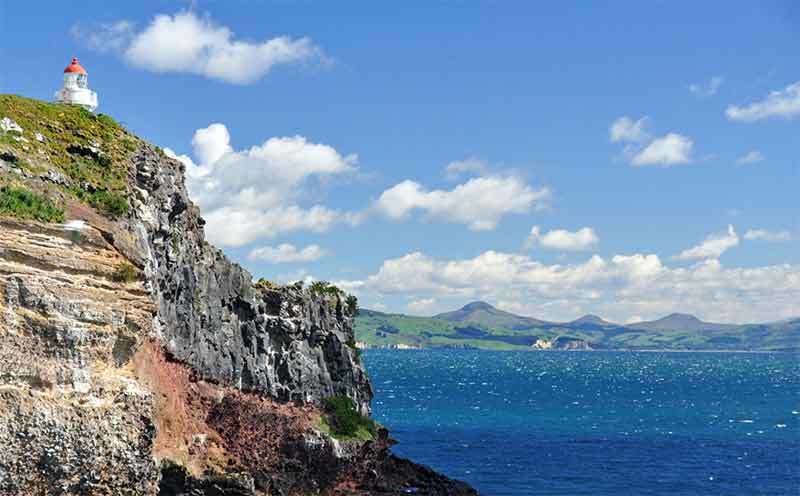 From its location on Auckland Harbor it's easy to visit most of the 50 islands in the adjacent Hauraki Gulf Maritime Park. 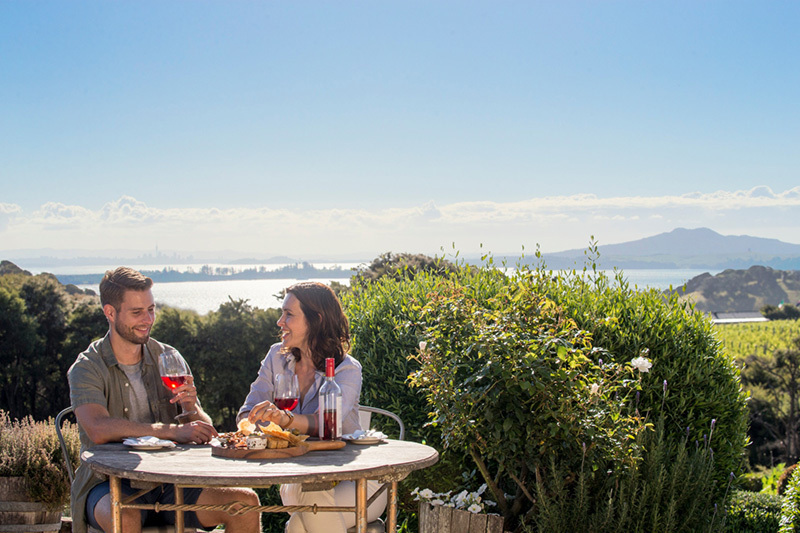 Auckland is an ideal starting point for any New Zealand trip, be it to enjoy great scenery, fascinating local culture, or fine food and wines. If you have the time, you can select activities from the options below to create your own Wish List. 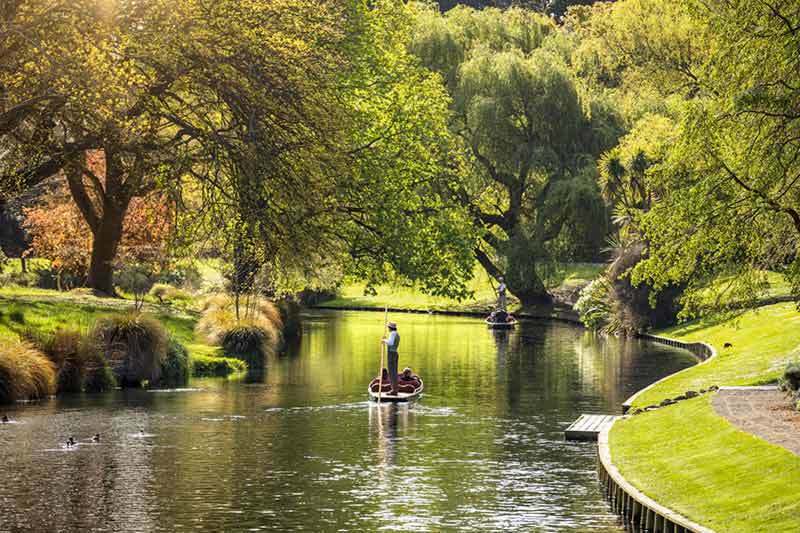 After leaving Auckland you will soon be enjoying the rural landscapes that lie at the heart of New Zealand’s economy, the farming region called The Waikato. It's an easy drive, passing small towns and dairy farms along the way. 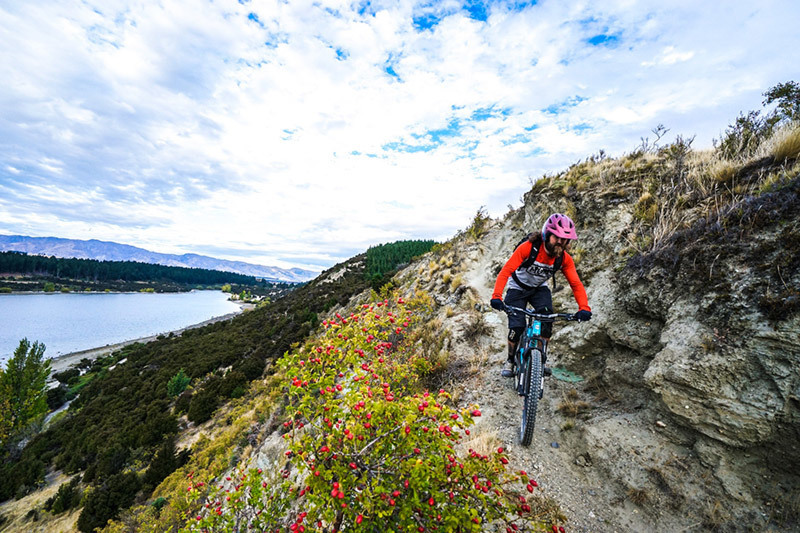 There are some interesting activities that you can choose to enjoy as you make your way to Rotorua of which Hobbiton and The Waitomo Caves are the most famous. 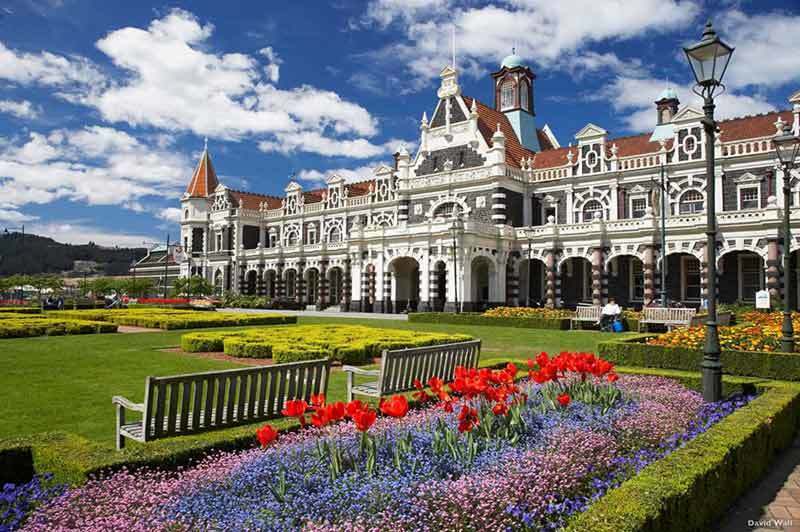 Rotorua is one of the most important cultural centers for the Māori people of New Zealand. 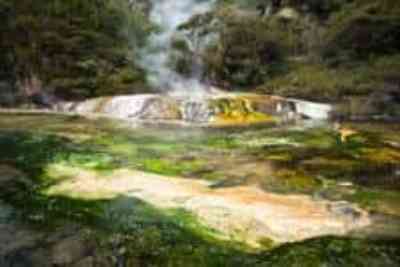 It's also internationally known for its bubbling mud pools, shooting geysers and natural hot spring spas. A relaxing drive through large tracts of plantation pine forest with some interesting stop-off options to enjoy along the way. 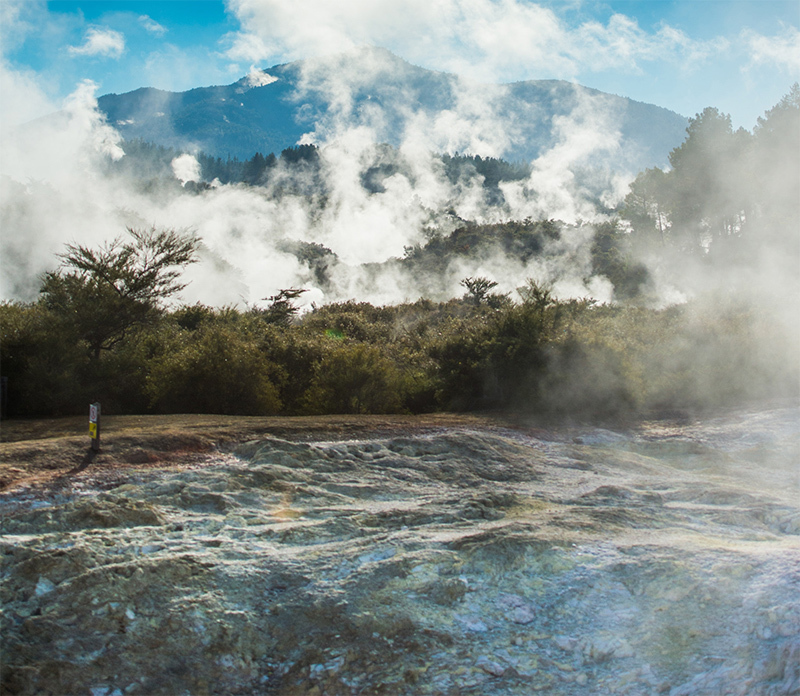 If you never had the chance to visit the Volcanic Valley at Waimangu in Rotorua or the thermal wonderland at Wai-O-Tapu, both are located on today's route. 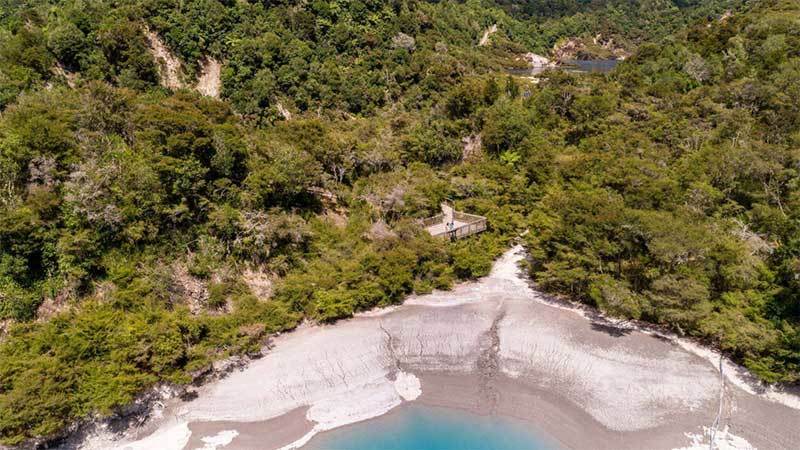 We also have a third and fascinating option on today's drive,The Hidden Valley at Orakei Korako, but it will take a sense of adventure to get there. Then a stop at Lake Taupo before finishing your day in the Tongariro National Park. 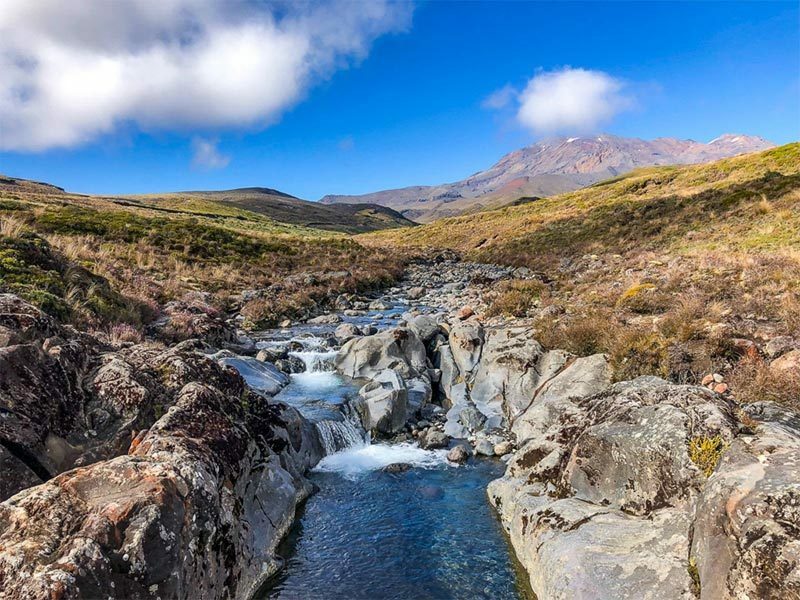 This massive high country plateau, a World Heritage Park, is an incredibly diverse region of tussock grassland, wild rivers, forests and birdlife with the three volcanoes of Tongariro, Ngauruhoe and Ruapehu dominating the landscape. 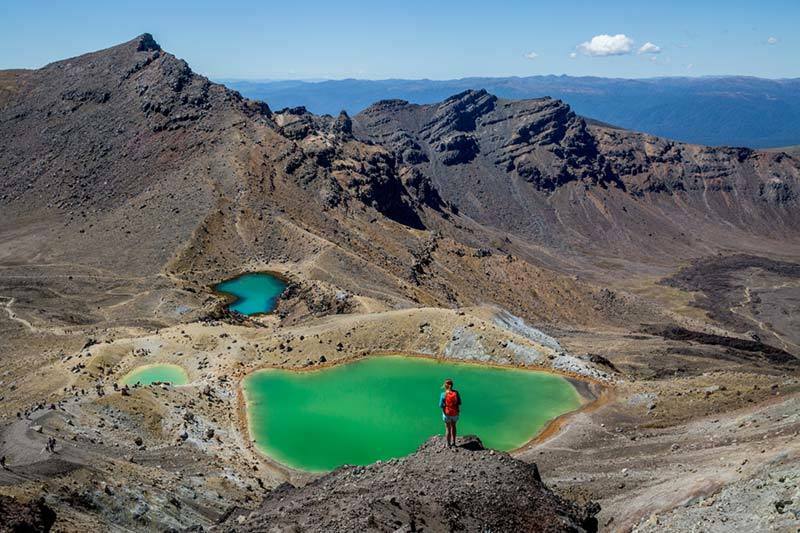 There are great walking and biking trails, white water rafting, some of the best trout fishing in the world and the highlight of any visit, the Tongariro Crossing. 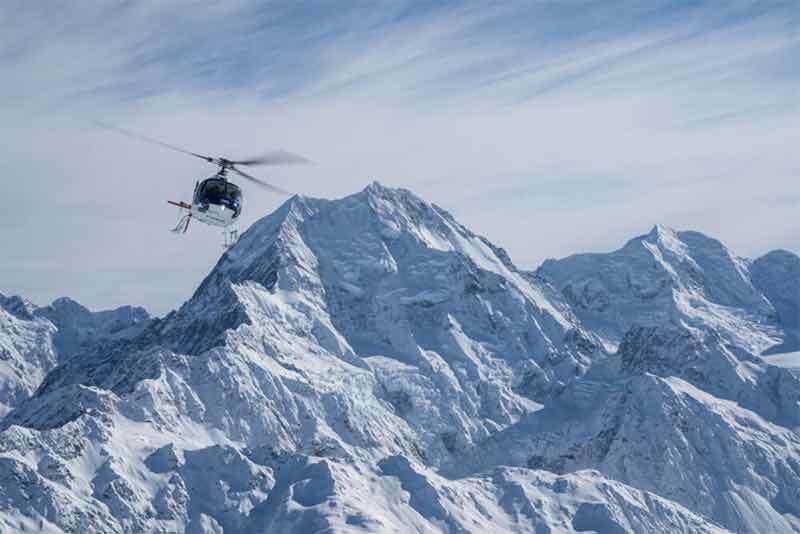 The ultimate destination for any adventurer. 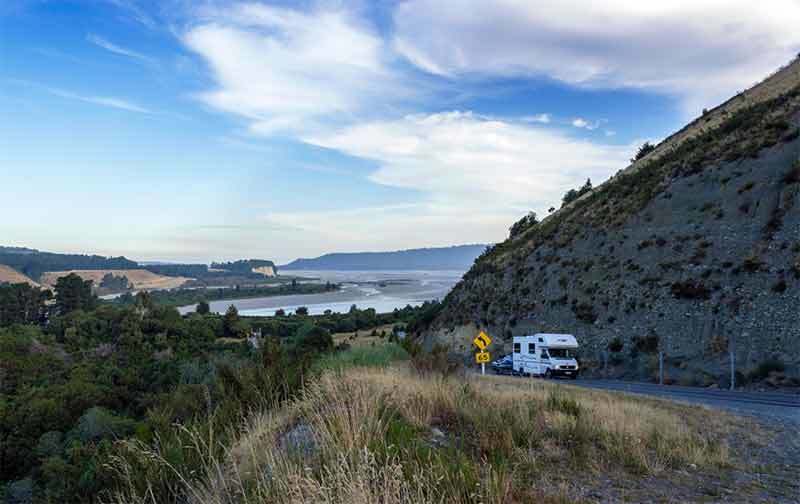 Instead of taking the the main road south, follow the beautiful Whanganui River Road for 80 miles, passing rural landscapes and enjoying forest and river views until you reach the town of Wanganui. 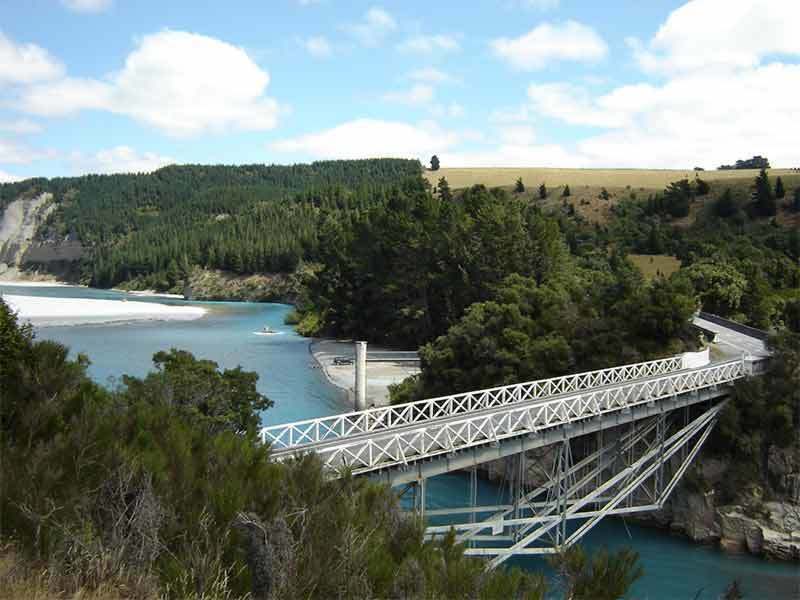 From Wanganui, rejoin the main road south for an easy drive, following the coastline and reaching the capital city of Wellington two hours later. 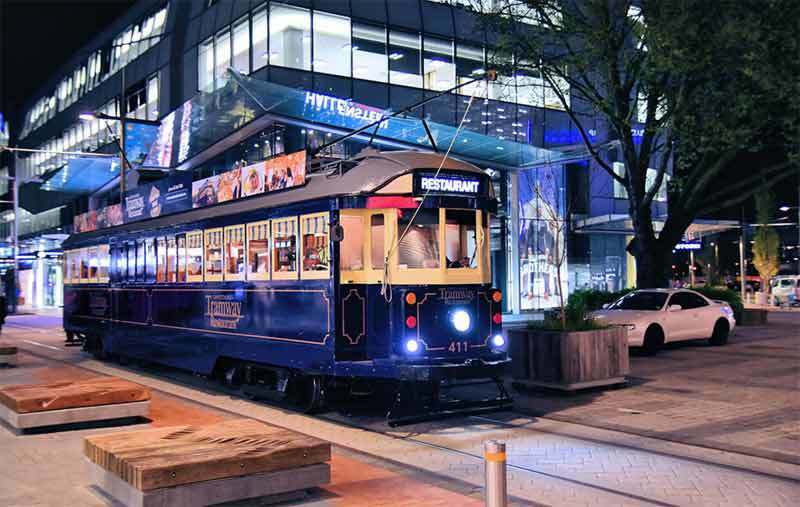 Wellington is the capital of New Zealand and the country's most cosmopolitan city. 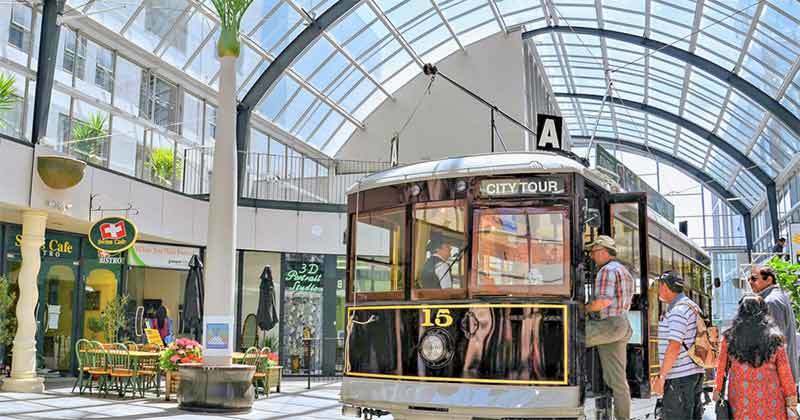 Since the opening of the new National Museum "Te Papa" it has become an increasingly popular destination for international visitors and food lovers will appreciate the large number of excellent boutique cafes and ethnic restaurants that are a feature of the city. 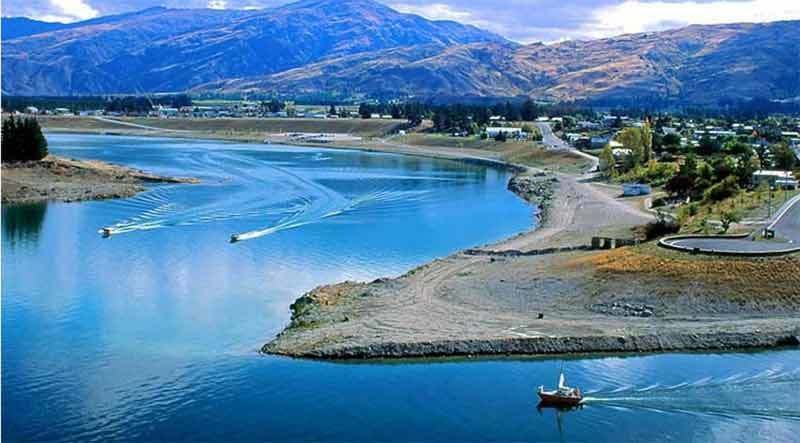 For the most part, this is an easy days drive, traveling through the Kawarau Gorge and the restored town of Cromwell before crossing the Lindis Pass. 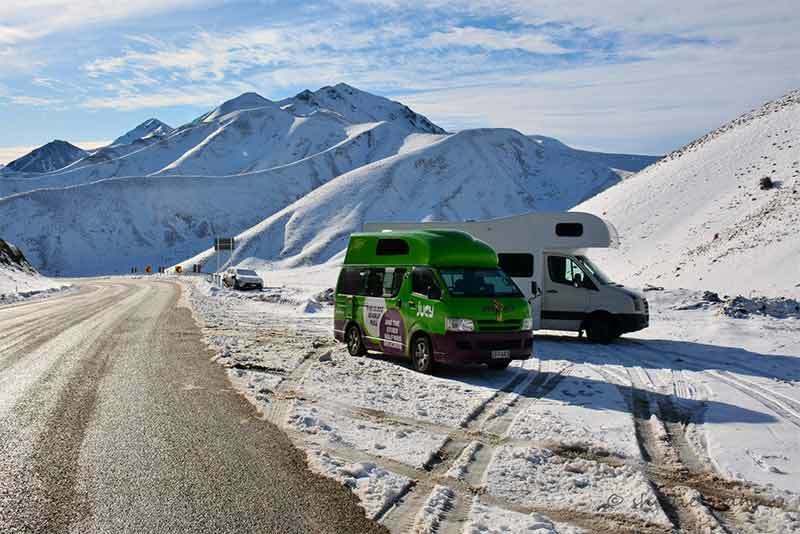 From here, as you follow the eastern flanks of the majestic Southern Alps, you can enjoy the most open roads in New Zealand, long, flat and easy. 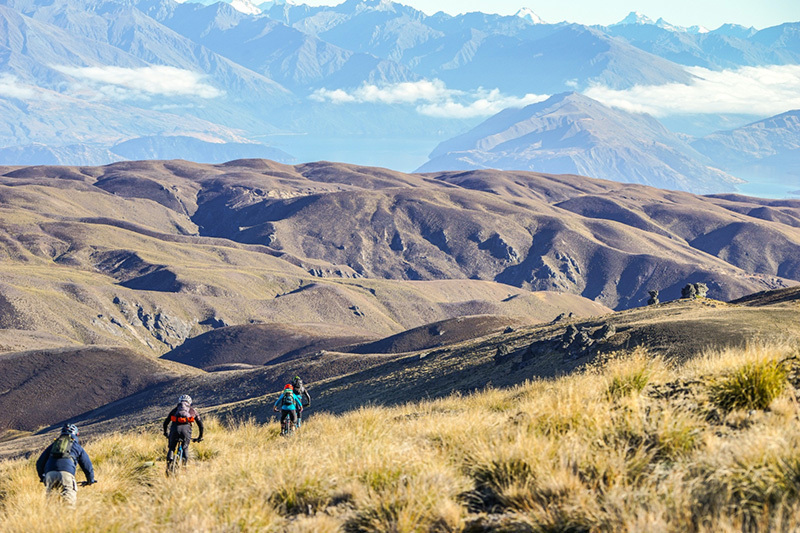 Twizel is the adventure capital of the South Island, offering access to some of New Zealand's finest mountain climbing, kayaking, mountain biking, alpine walking trails, cycling, skiing, horse trekking and trout fishing. 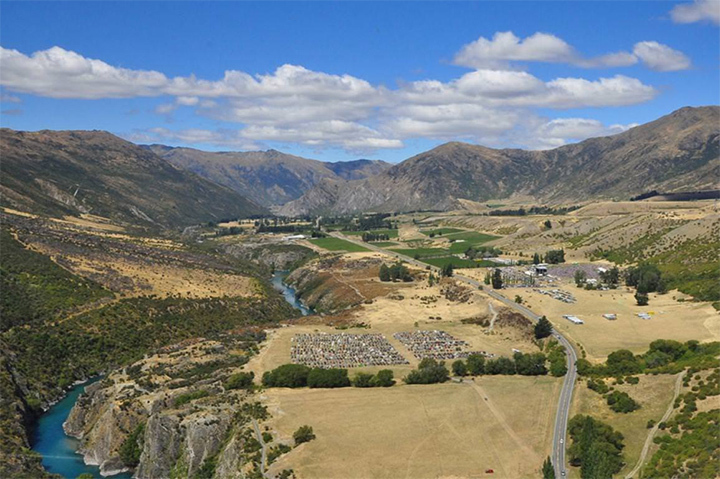 The area around Twizel and Tekapo played host to the filming of the epic battle at Pelennor Field, as well as the scenes in An Unexpected Journey where Bilbo and the dwarves escape orcs and warns. 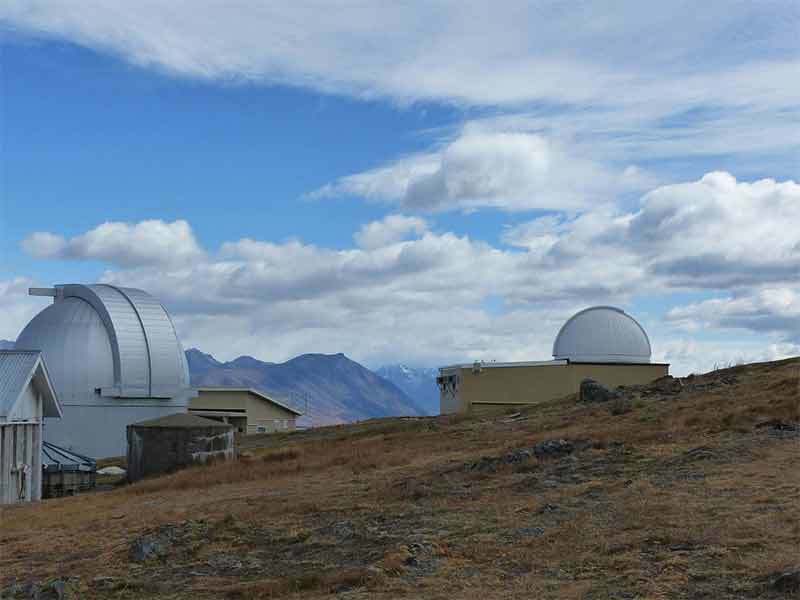 For those who noticed the June 2016 headline "The night sky is vanishing: 80 percent of Americans can no longer see the Milky Way" this is the region where you still see the stars in all of their stunning beauty, making a visit to the Mt John Observatory tonight, a special opportunity, never to be forgotten. 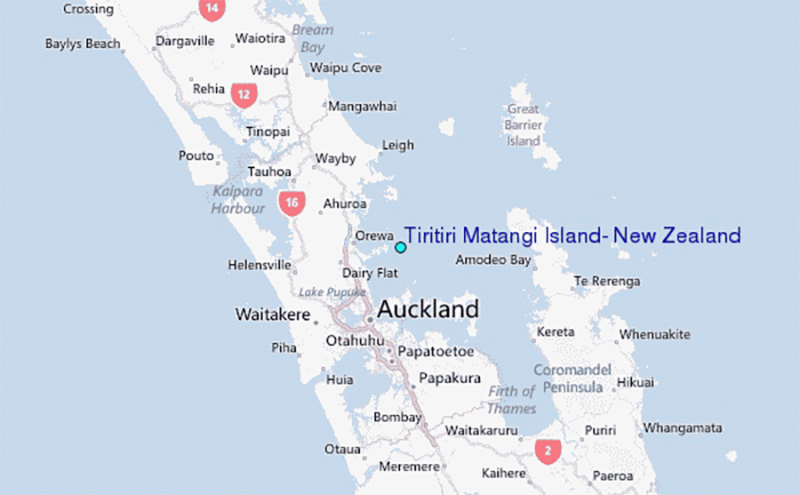 Rangitoto is a large uninhabited extinct island volcano just a 25 minute ferry ride from the city. On arrival make your way to the summit, an easy walk of about one hour from where you will enjoy spectacular views of nearby islands, the harbor and city. On the way pass through black volcanic lava fields covered by fern glens and the largest forest of native pōhutukawa trees in the world. Because it flowers between December and January, the pōhutukawa is now widely regarded as New Zealand's Christmas tree and the brilliant crimson flowers that envelop the tree over these months make for a beautiful sight. 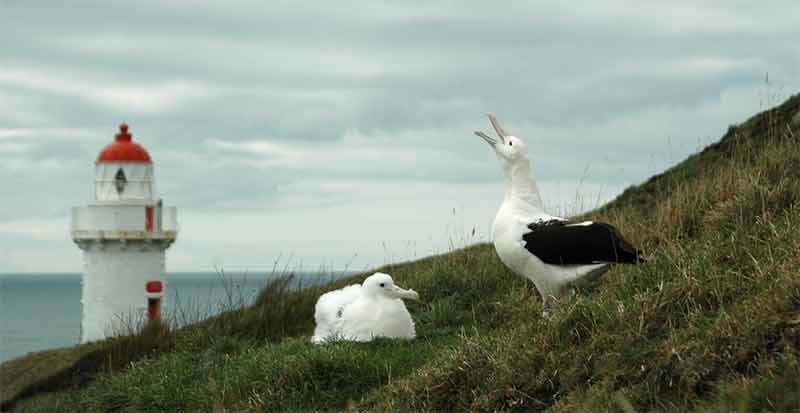 In 2011, after years of intensive eradication programs, the island was declared predator-free. 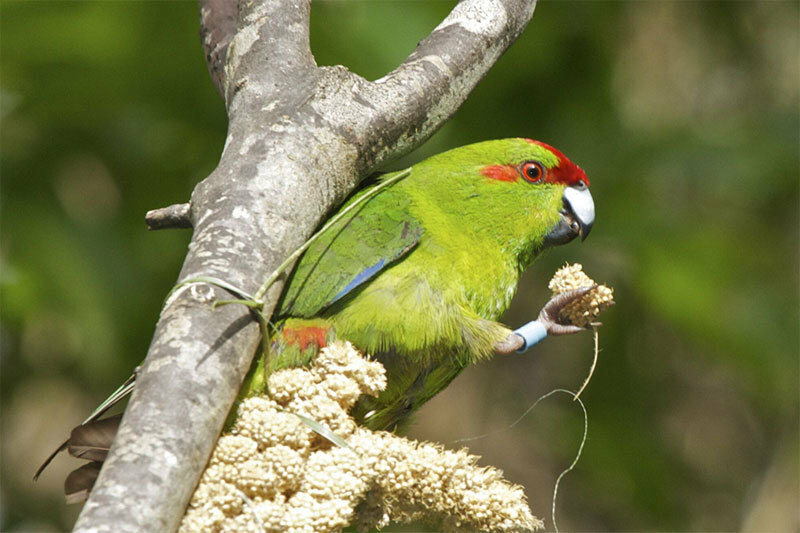 This has seen New Zealand native birds return to the island in large numbers, including Kākāriki and Bellbird as well as the cheeky Kākā. 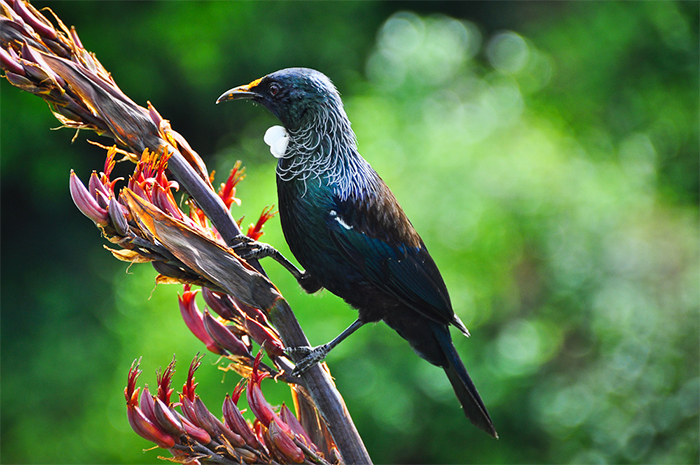 Tui numbers have also soared as have Fantail, Grey Warbler, Silvereye, Saddleback, Whitehead and Morepork (New Zealand’s only surviving native owl). A tip for visitors. 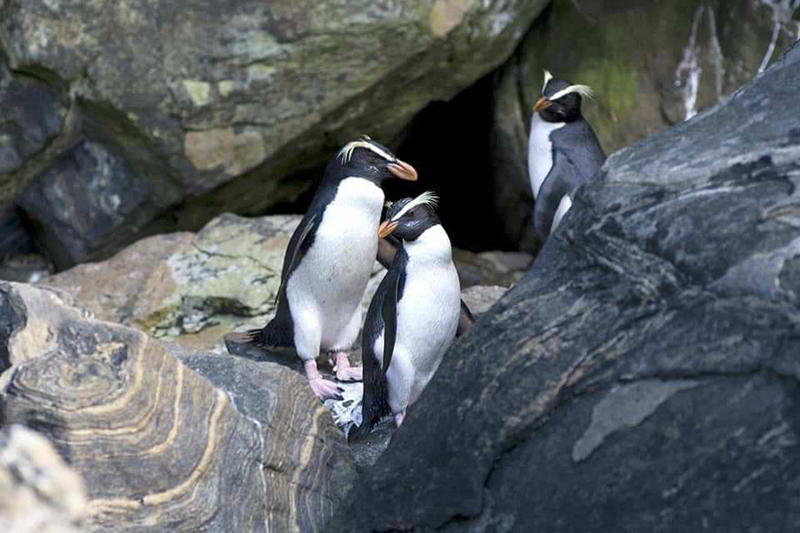 Birds are very shy, so you'll not see many as you walk the main trail to the summit. 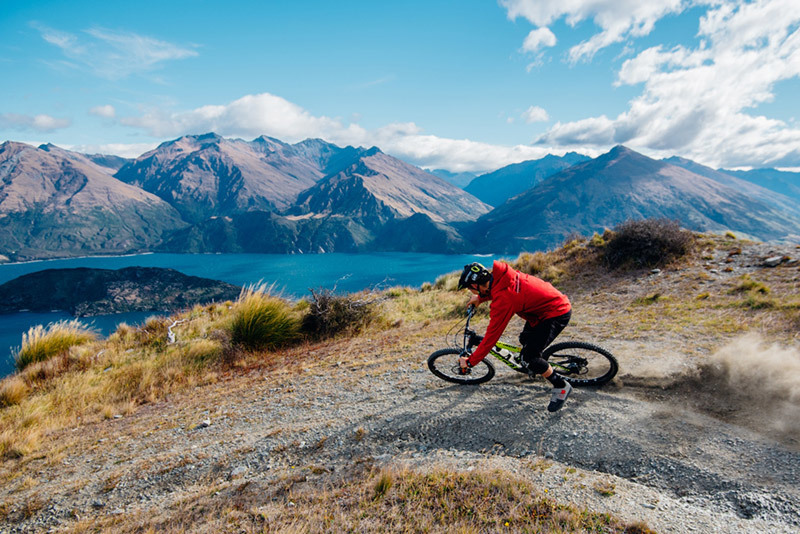 Take a side track on the trail, find a quiet spot and wait for 5-minutes. You'll be amazed at what you'll see if you remain patient. On no account should you try and feed the birds. 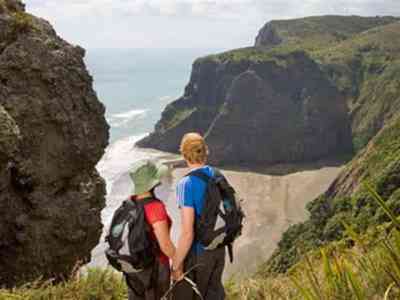 We often suggest that our customers enjoy this hike on the morning of their arrival in Auckland. After a long flight from the US, it's a great start to shaking off any feelings of jetlag. Views of Auckland city from the volcanic rock island. 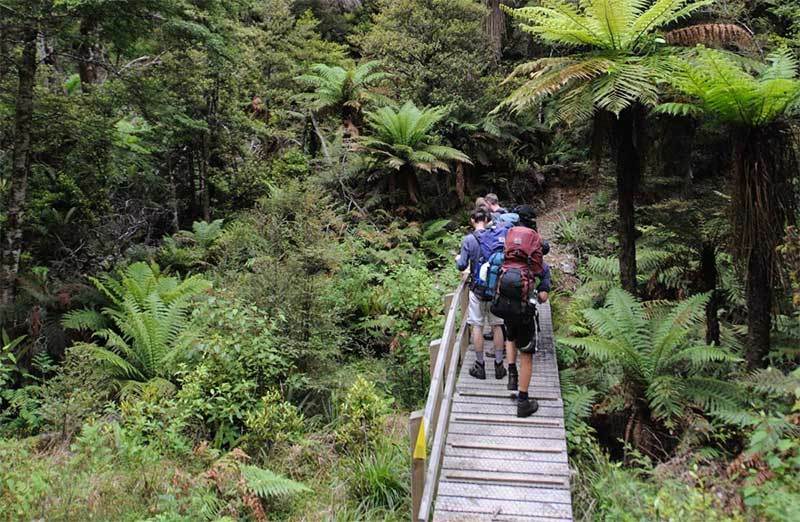 The walk to the summit through the magnificent forest of native trees and ferns. 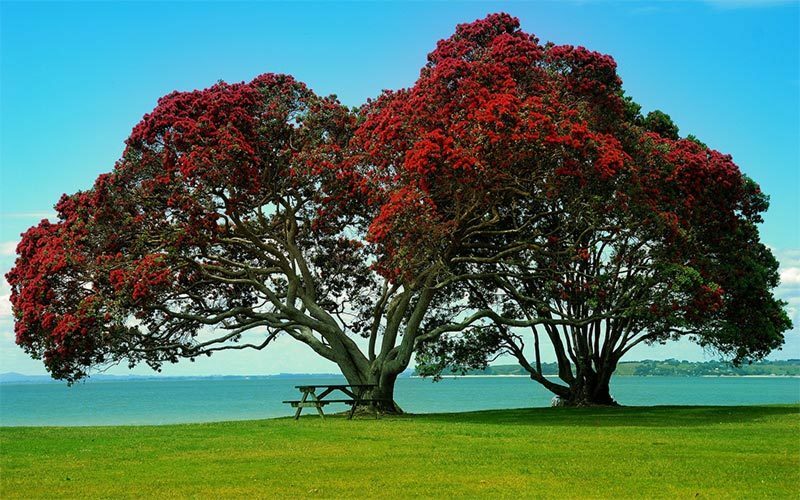 A pair of beautiful pōhutukawa trees on a beach north of Auckland. 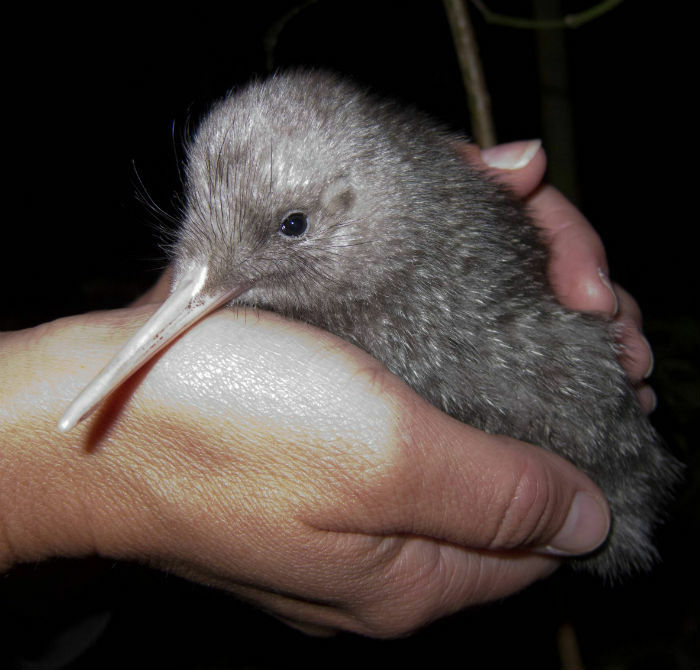 Quite by chance, on the day we wrote about the pōhutukawa trees on Rangitoto Island, we came across this story about a New Zealand couple who had just built themselves a home they've called a pōhutukawa house. Here's how you say the word pōhutukawa. 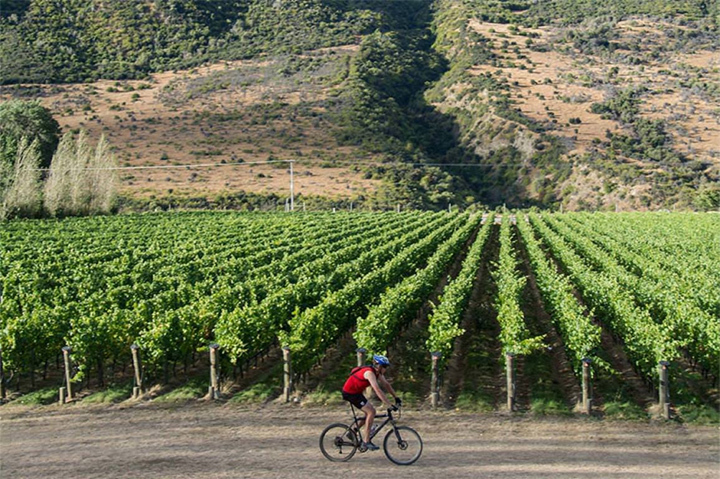 Beautiful white sand beaches, vineyards and outstanding scenery are just some of the attractions of Waiheke Island. 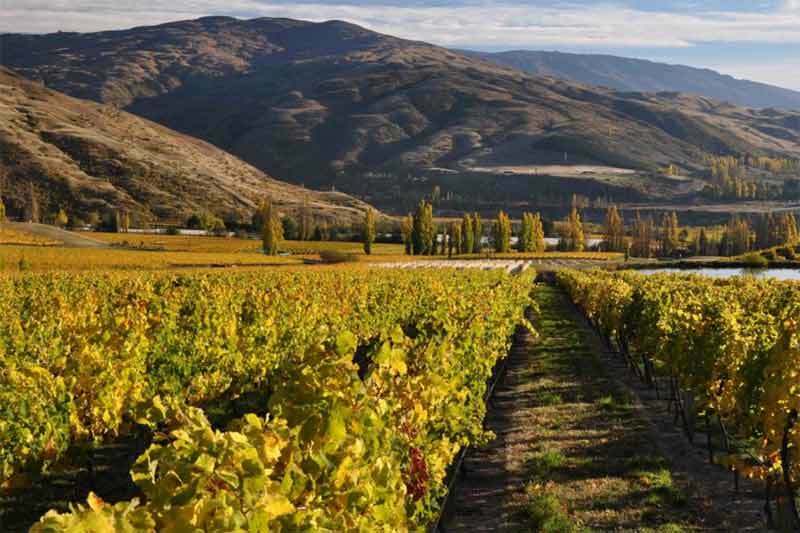 After a 45 ferry ride from downtown Auckland, you'll be greeted by your local guide, followed by a scenic tour of the island and tastings at three local boutique vineyards. 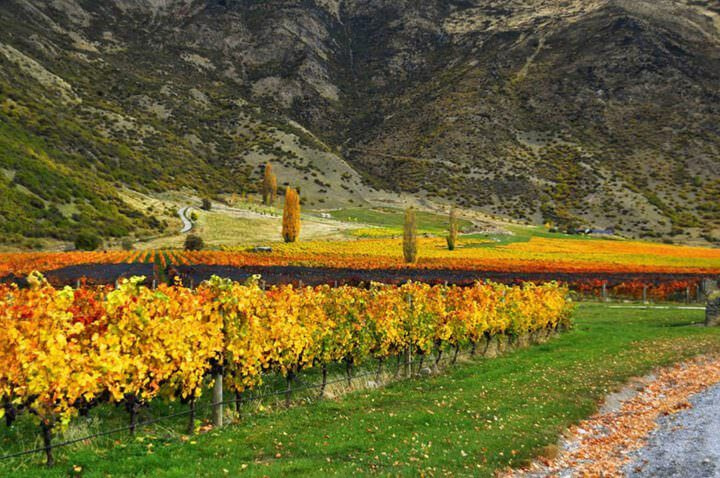 A two-hour lunch stop at a village café or one of the vineyard restaurants completes an interesting and relaxing day. Relaxing on Waiheke Island, with Auckland visible in the distance. 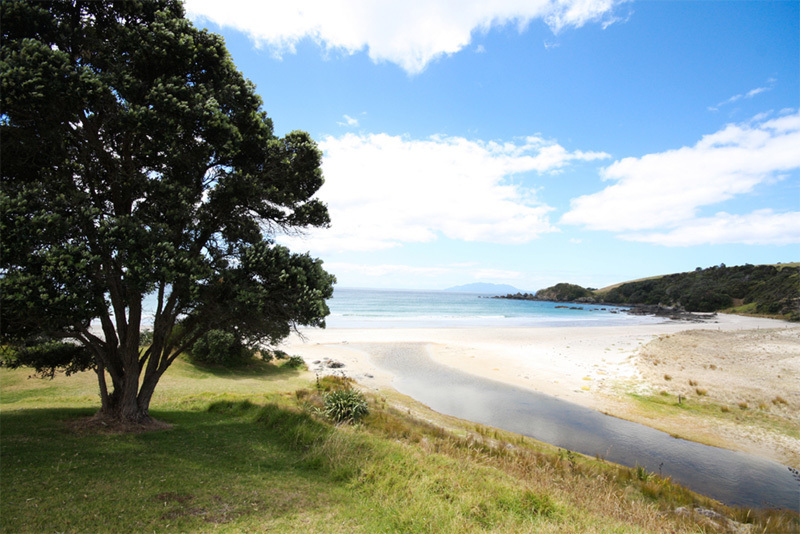 Matakana is a great place to visit on any day of the week. 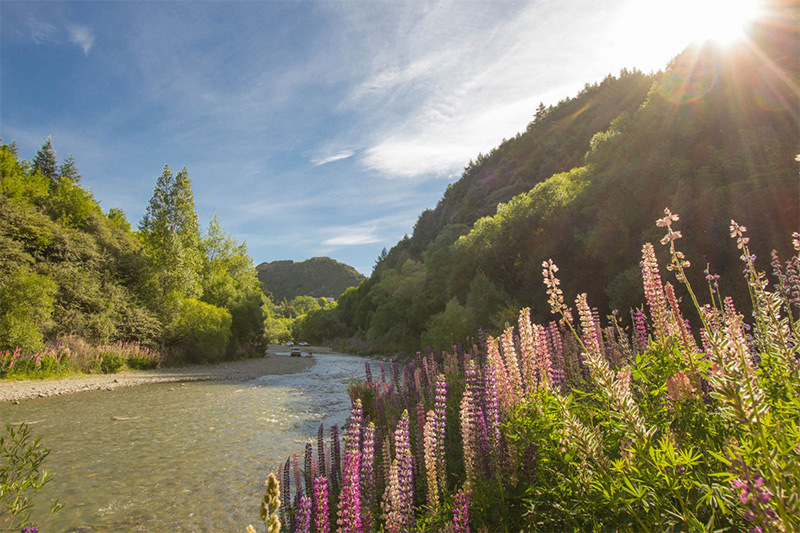 Nestled on the banks of the picturesque Matakana River, it's just a 40 minute drive from Auckland. 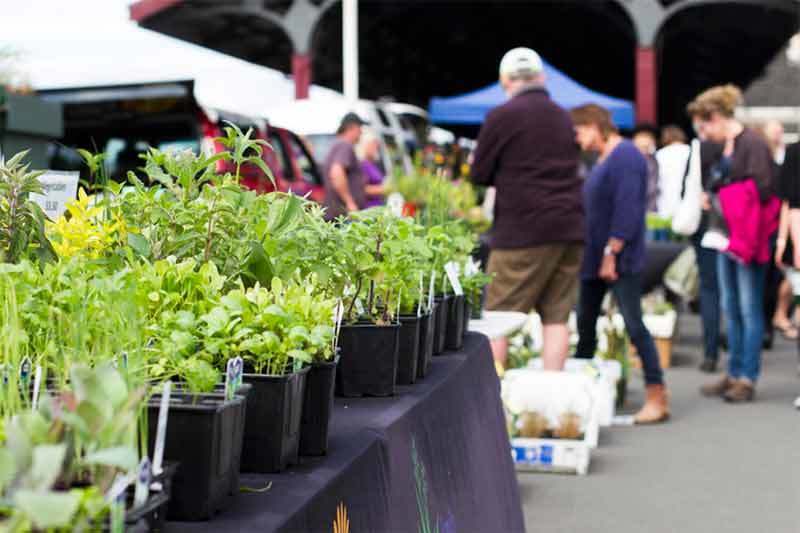 The Saturday morning Matakana Farmers' Market is a showcase for local artisans, growers and farmers. 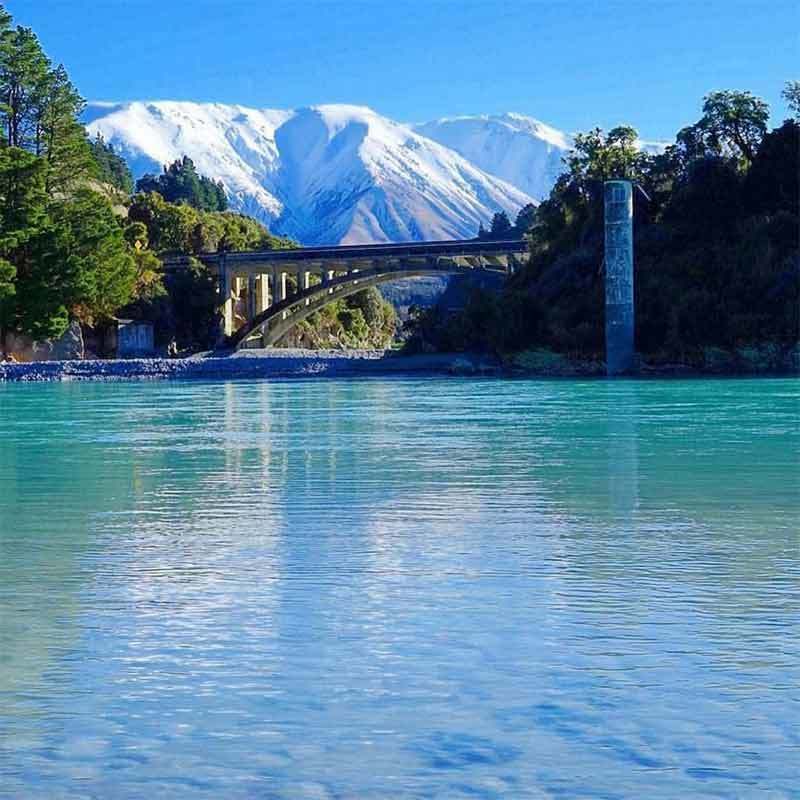 What better start to your New Zealand vacation than a delicious breakfast with freshly brewed coffee and homemade baking before browsing through the offerings at the farmers market across the road! After a stop at the village you can also visit one of the artist studios found in this peaceful corner of the world or drive to one of our favorite nearby beaches, located within a nature reserve and offering some nice walking trails and beach walks. 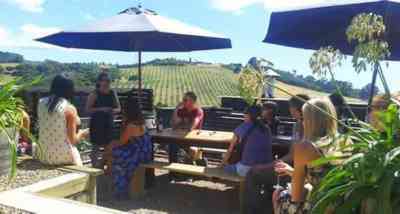 Visit a local vineyard for lunch before returning to the city. This picturesque beach is the perfect spot for a walk after breakfast. 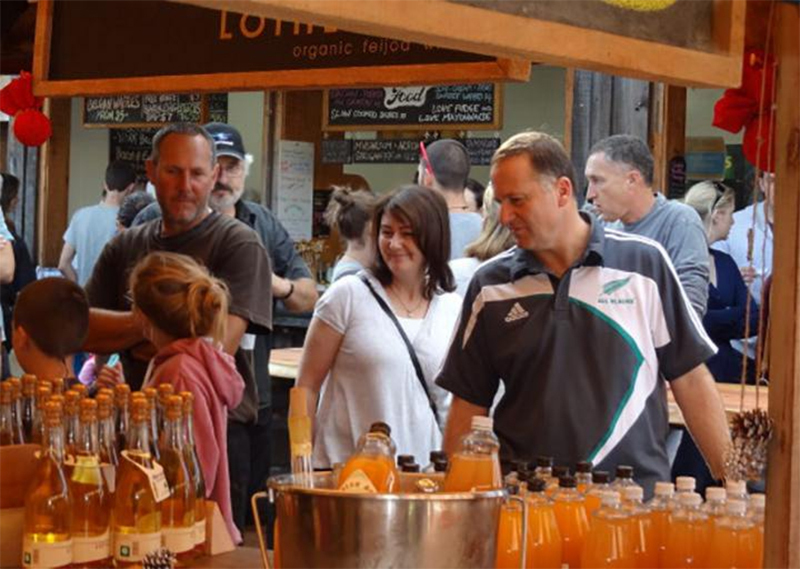 Recently retired New Zealand Prime Minister John Key enjoying a morning shop at Matakana Markets. 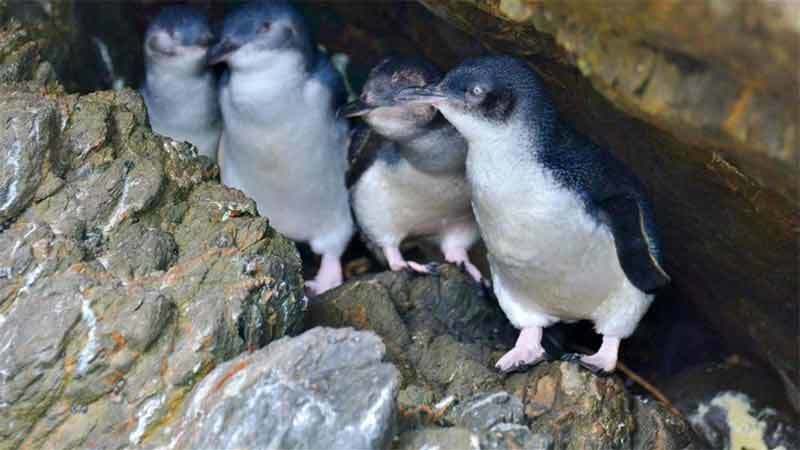 Tiritiri Matangi Island in the Hauraki Gulf is one of New Zealand's most important bird conservation projects, a place where you can walk among rare native birds and animals in their natural habitat. 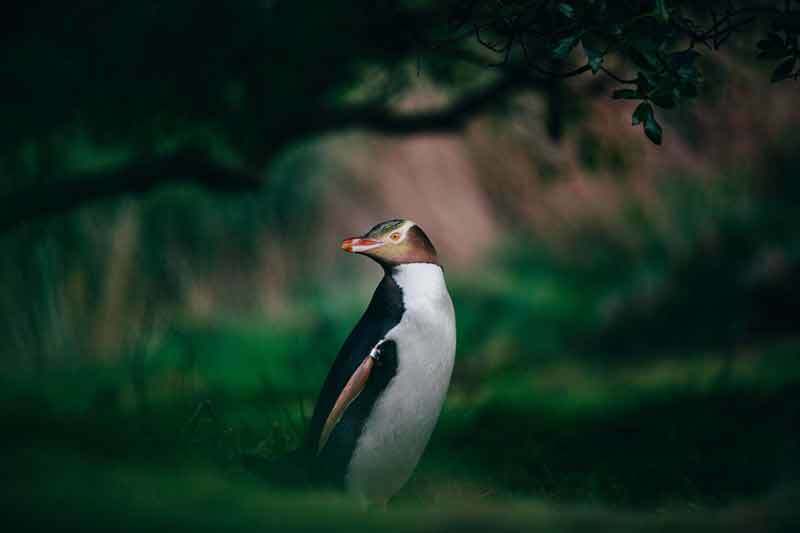 Over the years more than 300,000 native trees have been planted on the predator free island by volunteers and a number of threatened bird species and small animals reintroduced. 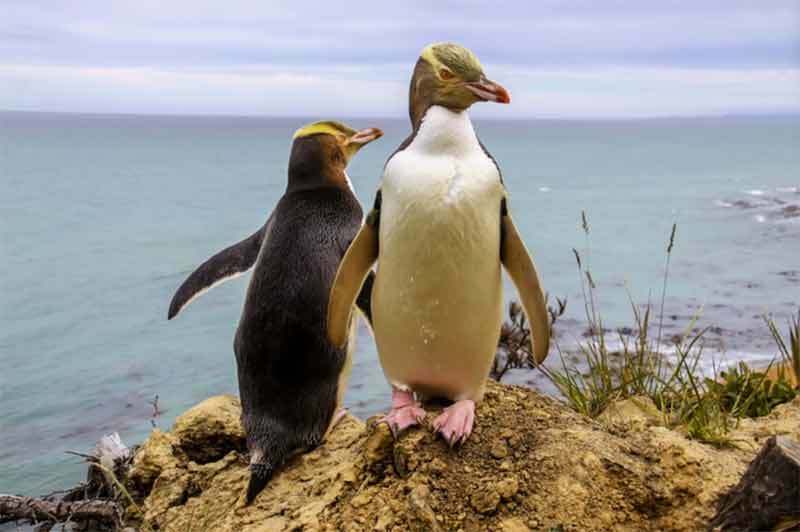 These include the flightless takahe, one of the world’s rarest species, and the fascinating and ancient lizard-like tuatara that pre-dates the dinosaurs. 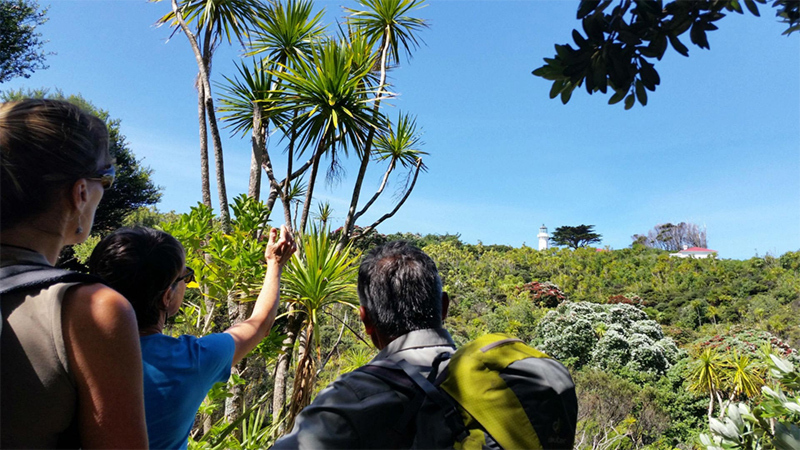 A volunteer guide welcomes arrivals and explains the island's history and forest restoration. 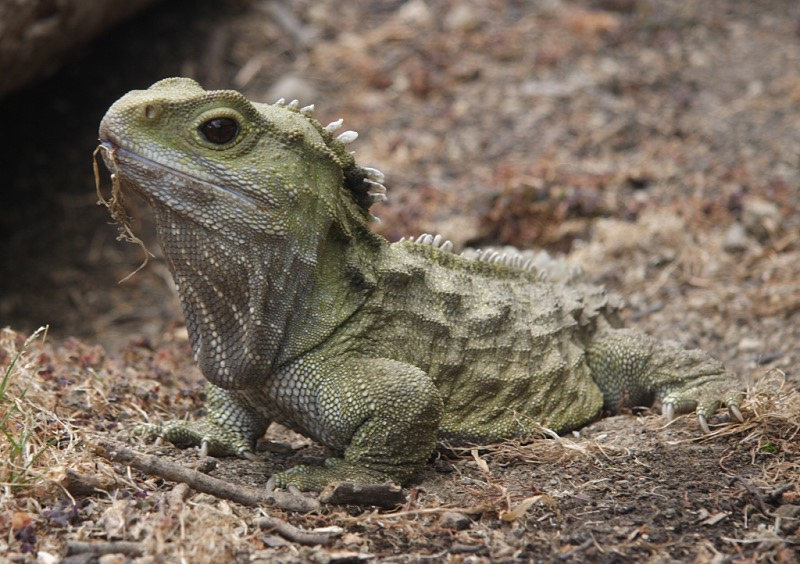 Tuatara have grown in population since being introduced to the predator free island in 2003. 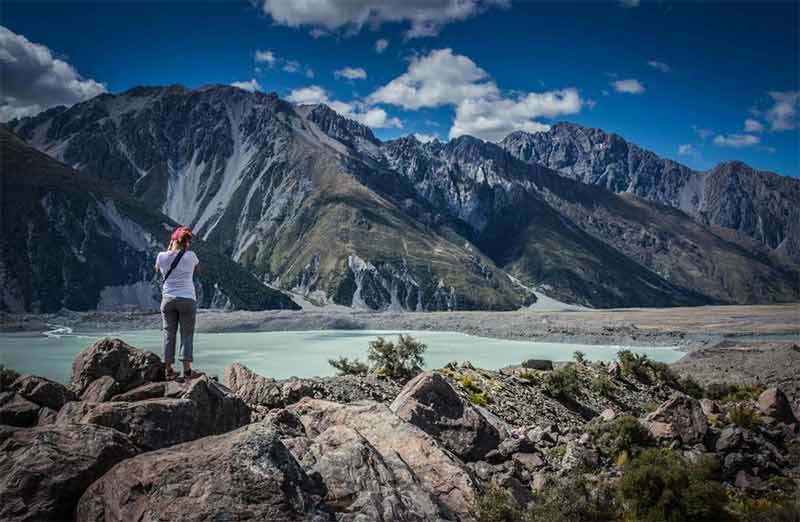 This is a terrific opportunity to experience some of New Zealand’s best walking tracks along the trails of the wild West Coast, just 45 minutes from Auckland. 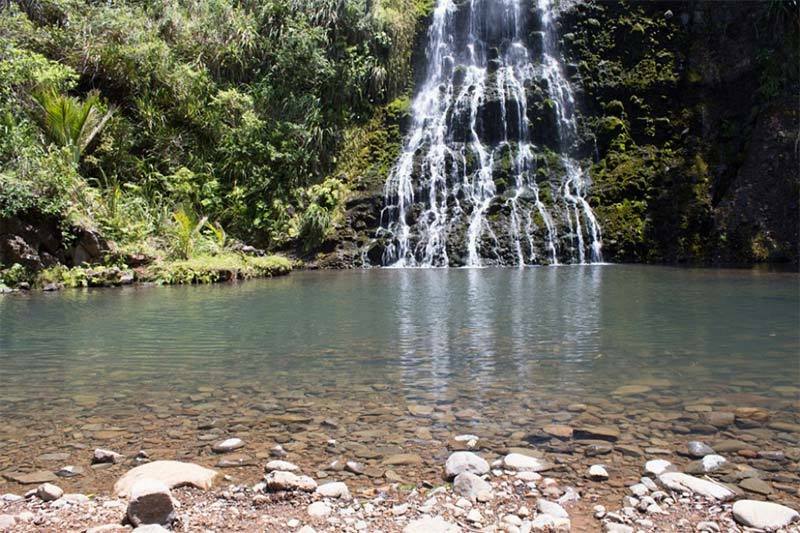 Your guide for the day will also take you to waterfalls and rainforest scenery that will take your breath away! A basic level of fitness is required as are good walking shoes. 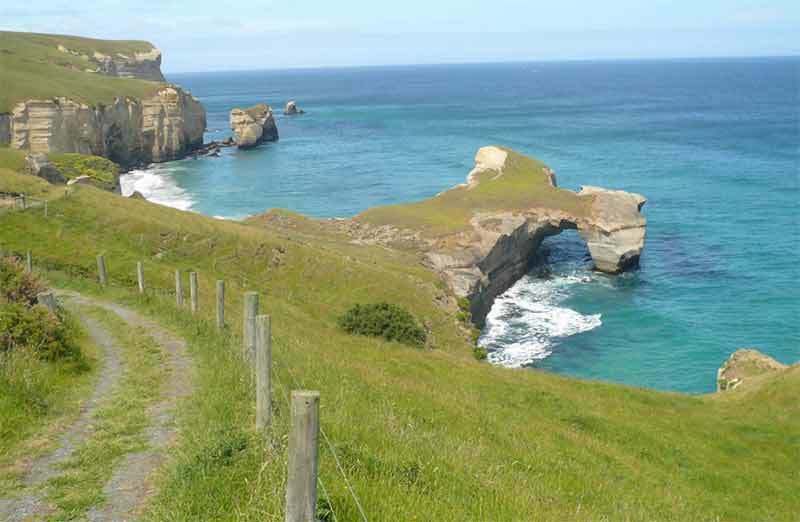 Gorgeous views of Auckland's wild West Coast make the scenic walk up to the top well worth it. 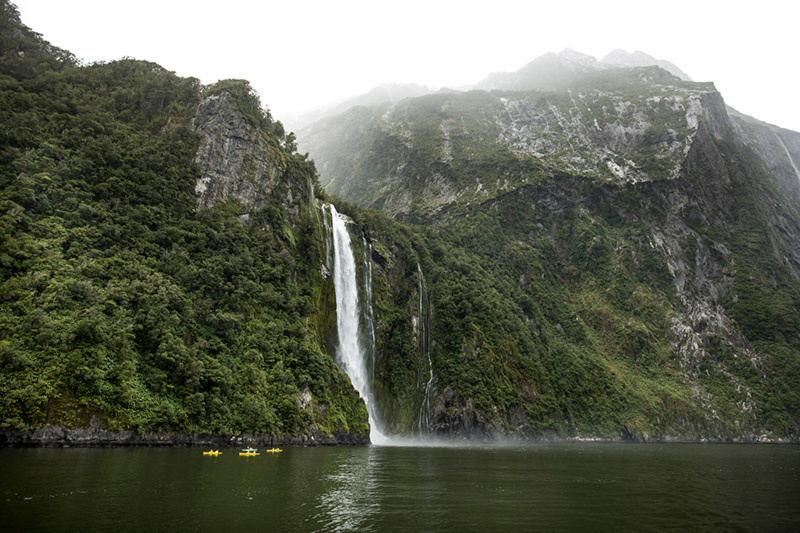 The must see Karekare falls with its beautiful surrounding rainforest. 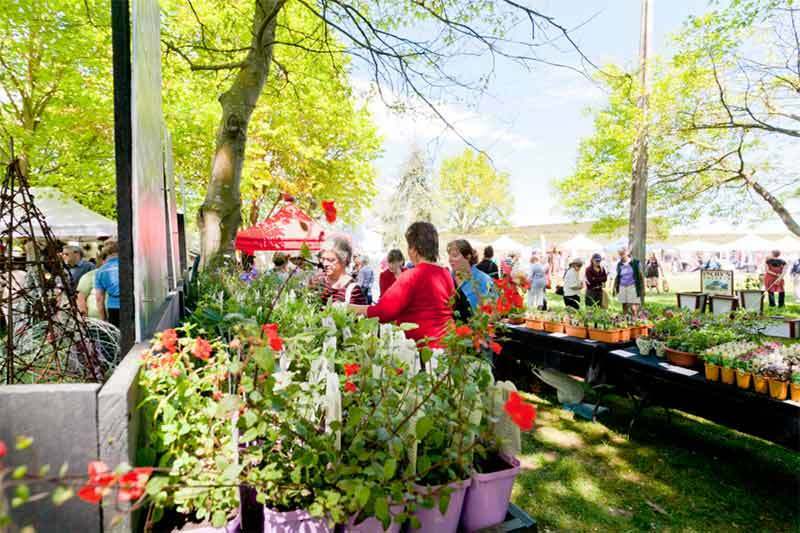 Cost: $209.00 per person includes transport, snacks, hot/cold drinks and a delicious picnic lunch, taxes and park fees. 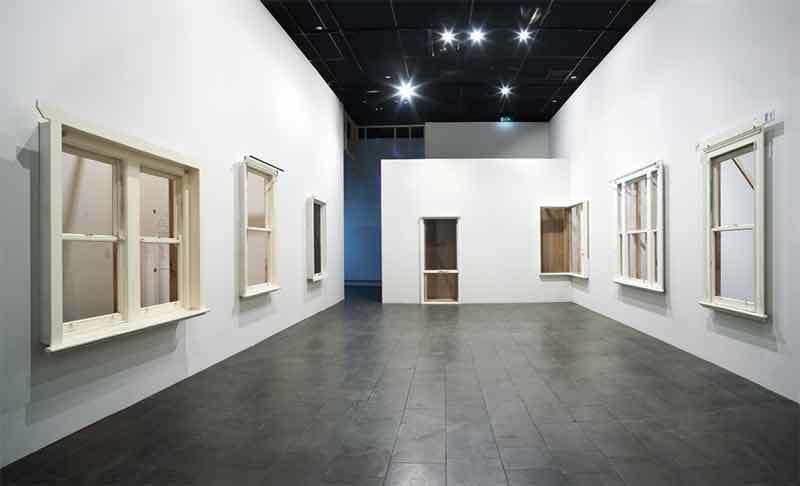 In 2007 the original Auckland Art Gallery was completely closed for 4 years while it underwent extensive renovations. 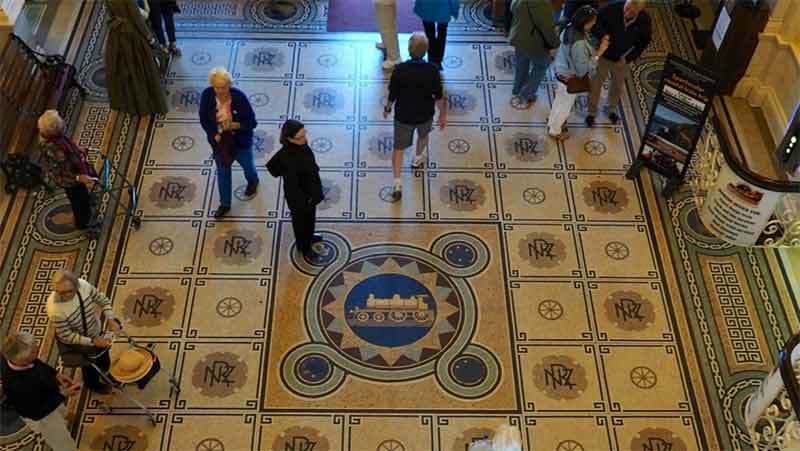 Since reopening it has established itself as one of the country's most iconic buildings. 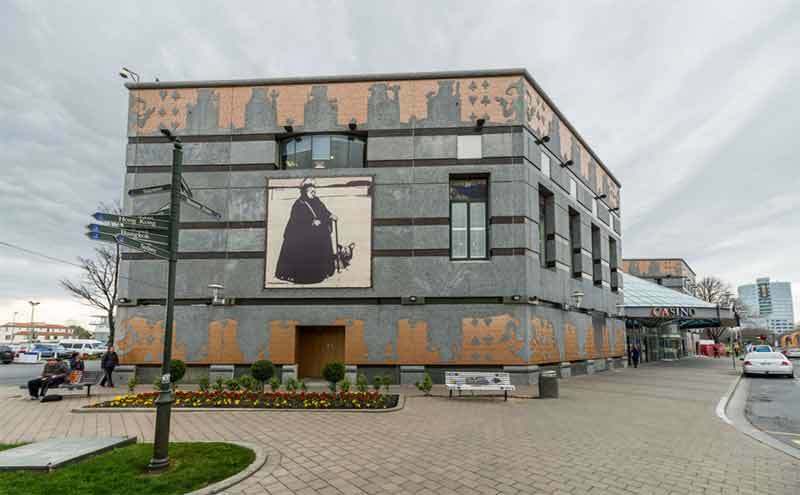 This is the perfect place to immerse yourself in the sights, sounds and atmosphere of traditional and contemporary international works of art. 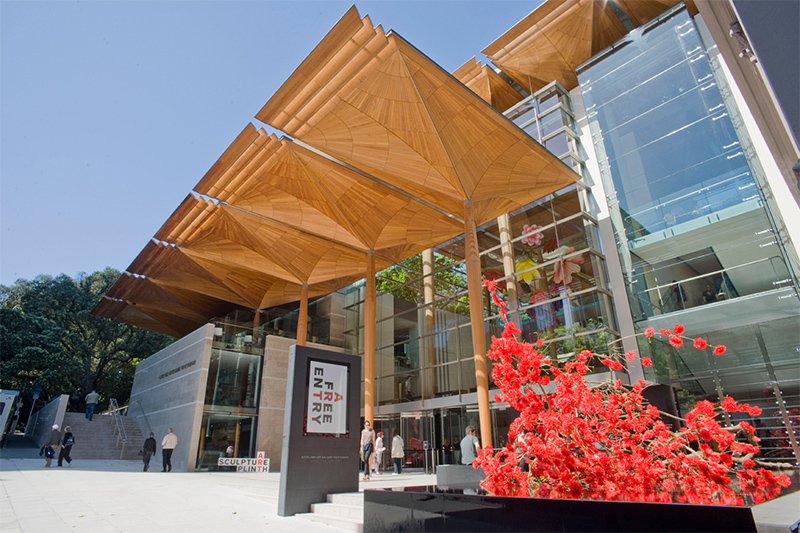 The gallery is located right in the heart of the city and also boasts the largest permanent collection of New Zealand art. 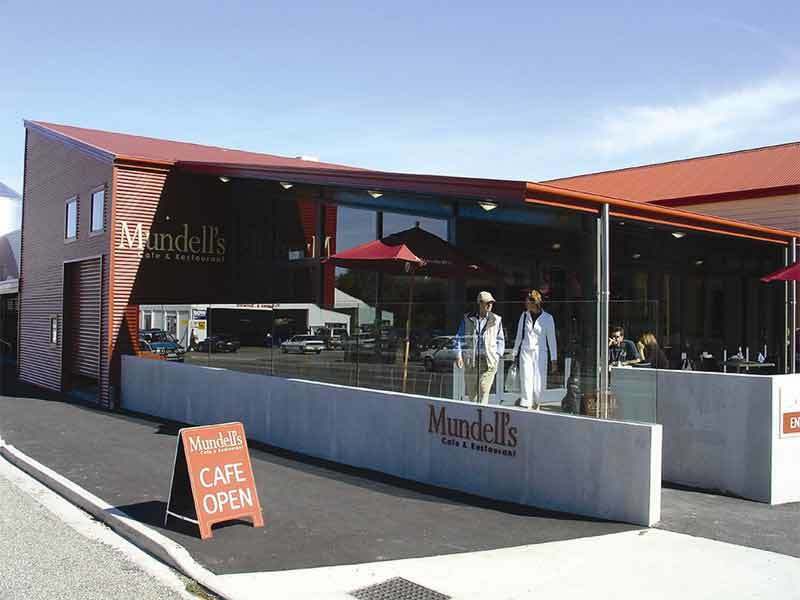 Their popular cafe is a great place to enjoy a coffee or lunch and the back entrance looks out on Albert Park and the adjoining University of Auckland. 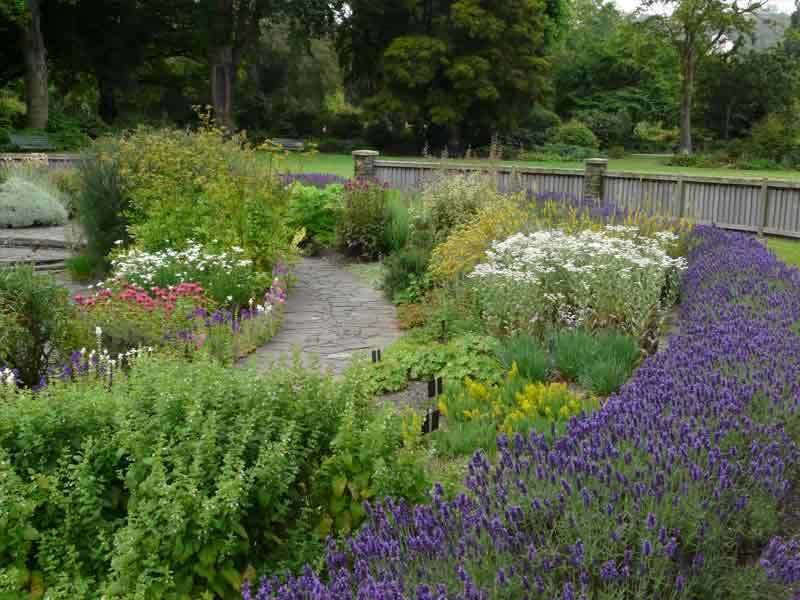 A nice place for a stroll to admire the historic fountain, bandstand and flower gardens. 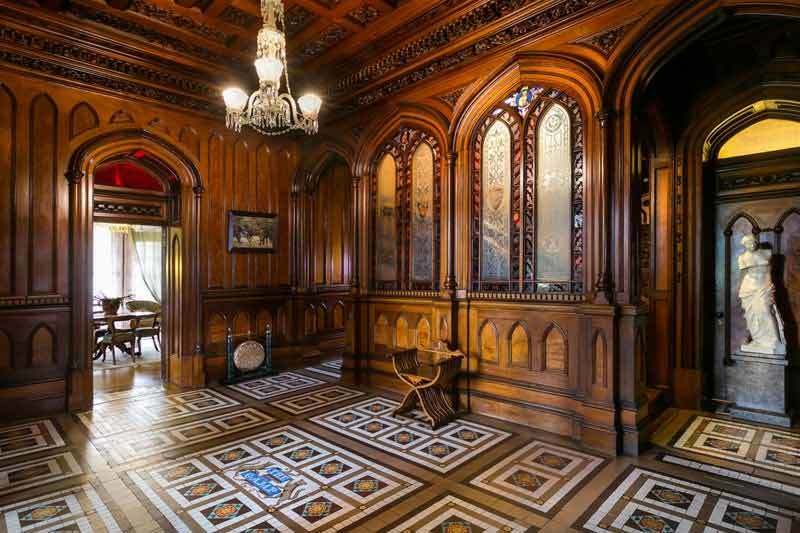 The stunning entrance to the gallery. 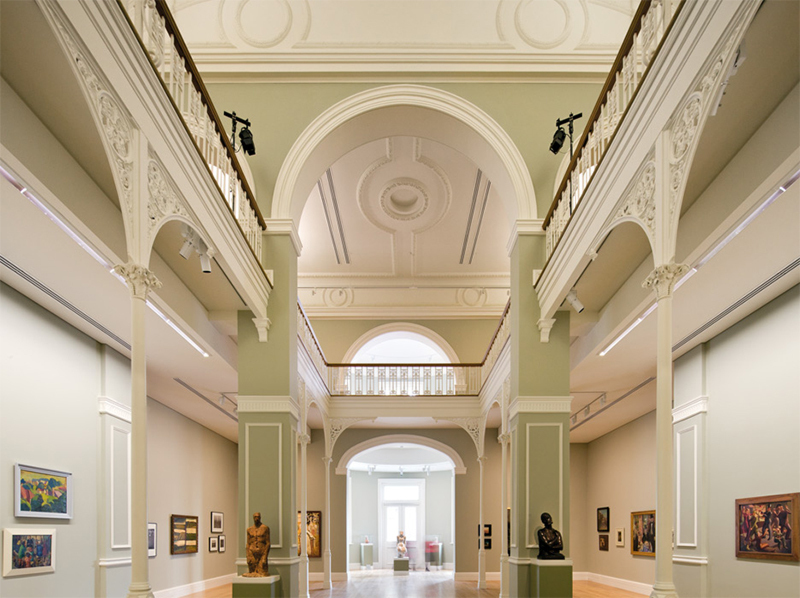 The beautifully restored Wellesley Gallery in the Heritage Building. Auckland, also known as 'The City of Sails' is the city that provided the core of the team that first won the America’s Cup in 1995 in San Diego. Here's your opportunity to feel the thrill of sailing an authentic America’s Cup yacht. Take the helm to help steer, work hard on the grinders to hoist the mainsail or simply sit back and enjoy the scenery. 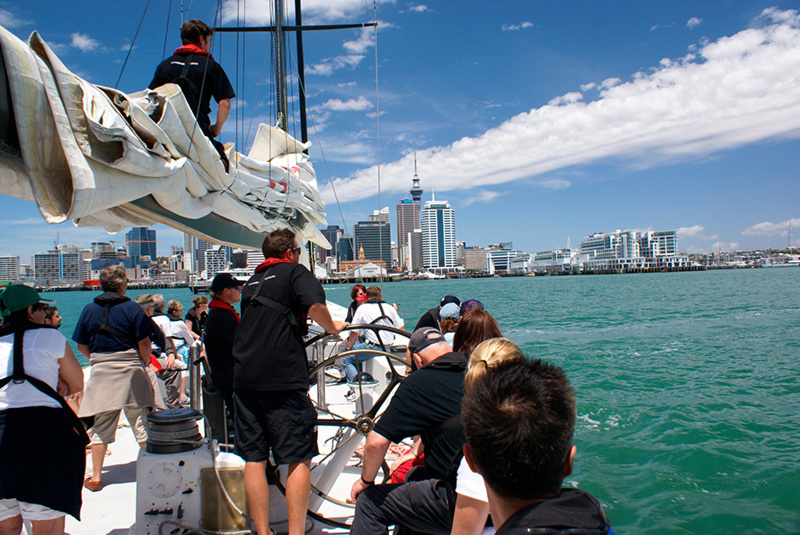 Join the crew and help steer the impressive yacht around Auckland harbor, a must do for yachting enthusiasts. 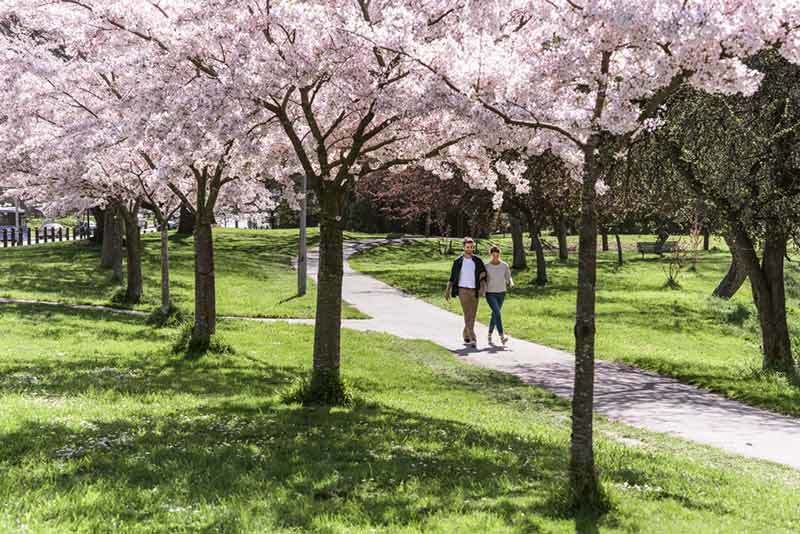 We can help you arrange a free self-guided walk around the city or for a more in-depth experience, you can walk with an expert guide to discover some of the hidden treasures of Auckland City. 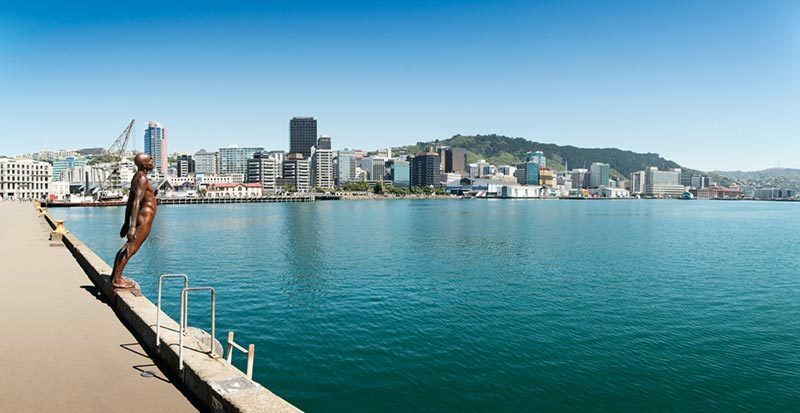 From the must-see highlights and picturesque views, to the trendy backstreets and cultural offerings, there will be a range of experiences on offer and stories about how this young city emerged from a narrow volcanic isthmus to become a bustling, cosmopolitan city on the edge of the world. 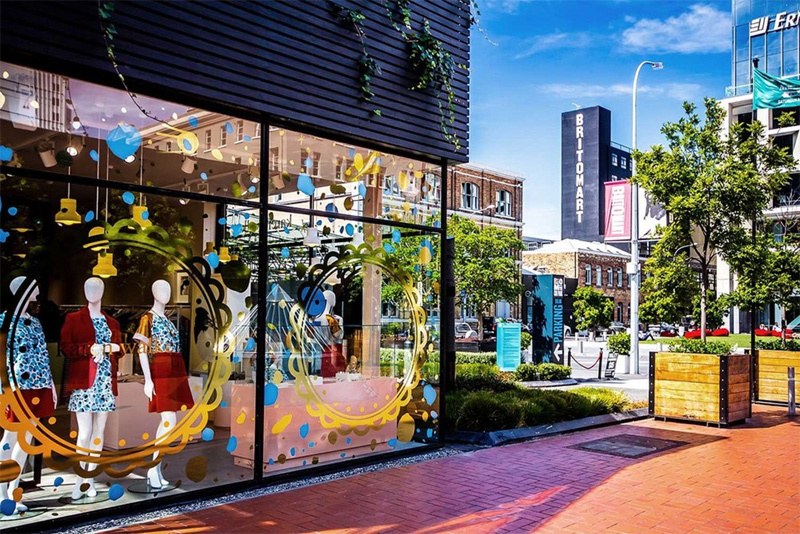 Britomarkt is Auckland's waterfront precinct and with heritage buildings,new architecture, eateries, health and beauty and designer boutiques it's a must see on any walking city tour. 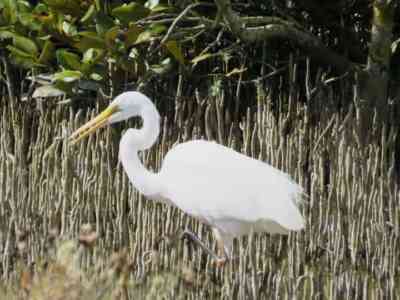 The wetlands at the center provide a home to many bird species, a great vantage point to take some photos. 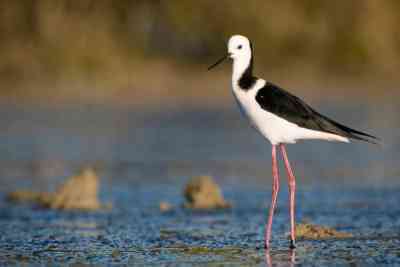 NZ shorebirds at risk of being endangered including the Wrybill that can be seen at the Miranda Centre. Allow: An extra 20 minutes driving time. 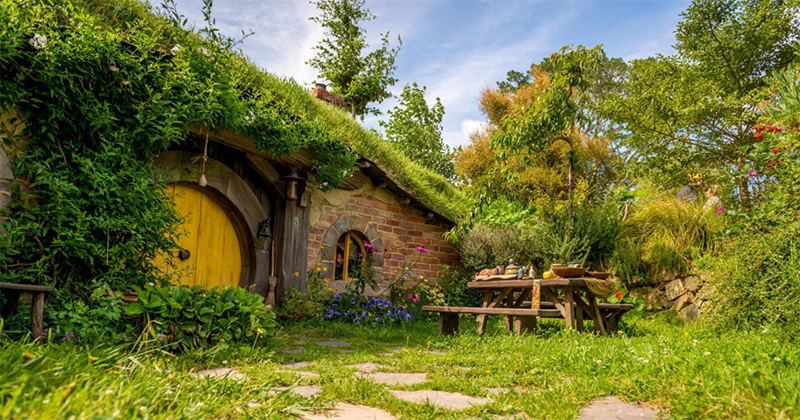 Visit the Hobbiton movie set where scenes from The Lord of the Rings and The Hobbit were filmed. 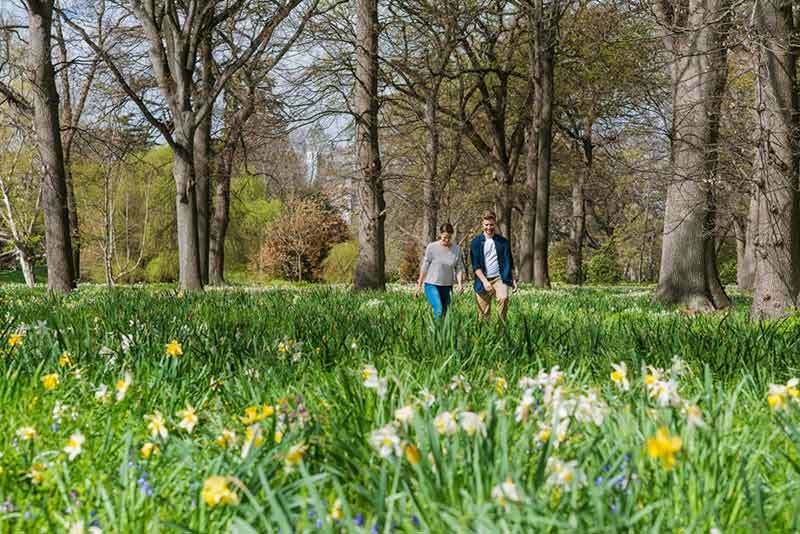 In a fascinating two-hour guided tour you will be taken through the twelve acre site recounting fascinating details of how the movie set was created. The Hobbit Holes, Green Dragon™ Inn, Mill and other structures created for these films can be viewed. For something really special ask us about the Wednesday evening Dinner Tour. A tour through the Hobbiton movie set is a must for any Hobbit/Lord of the rings fan. 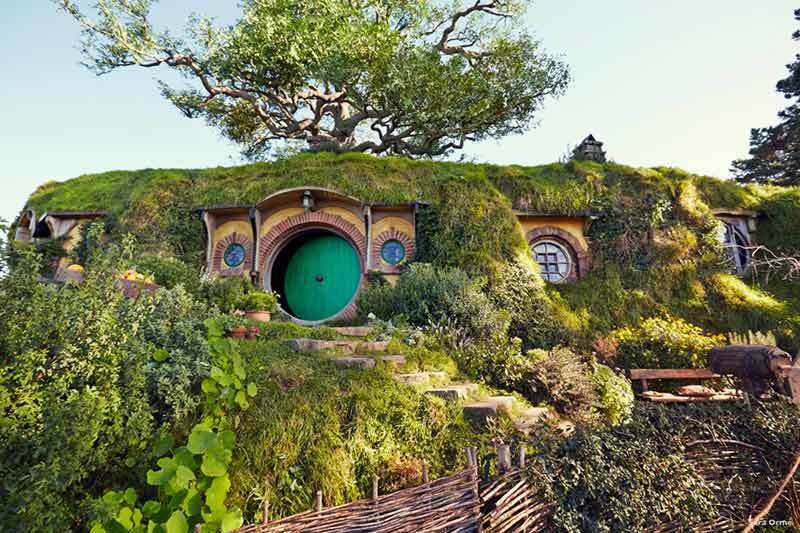 The Hobbit houses and gardens are kept in beautiful condition. 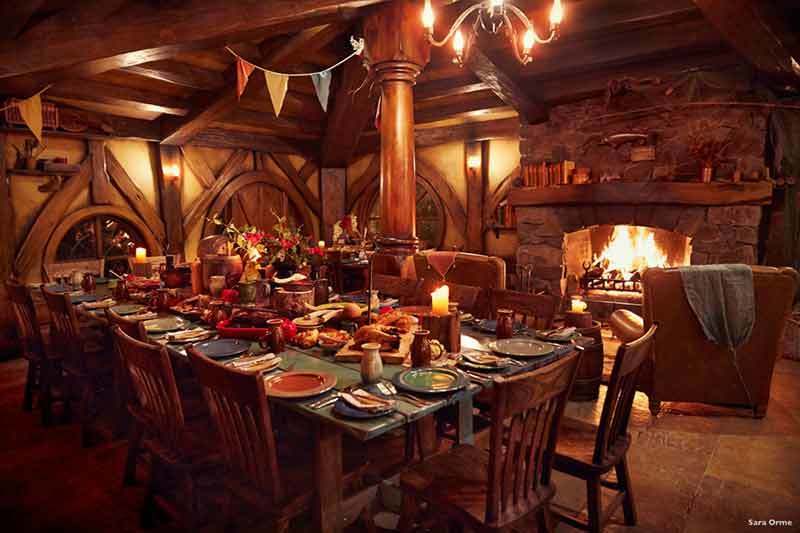 Dining in Hobbit style, part of the Wednesday evening dinner tour. 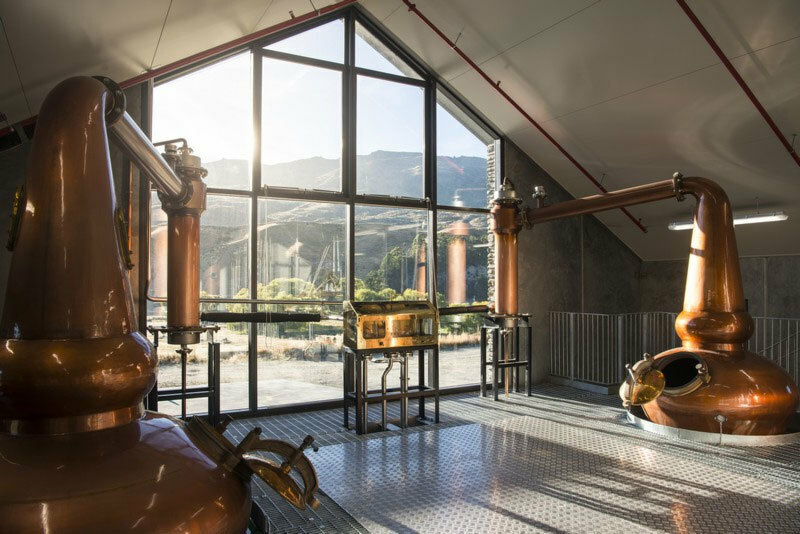 All lit up for the evening on New Zealand's most famous farm. 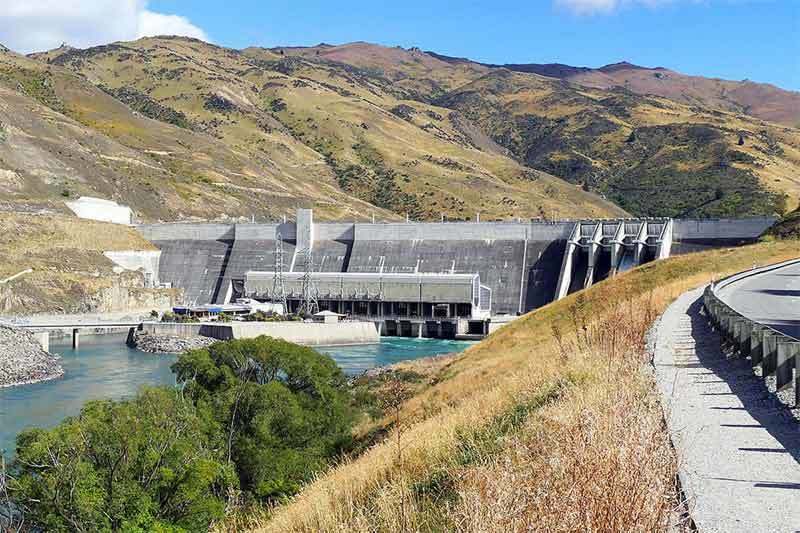 This is one of the iconic visitor attractions on any New Zealand vacation itinerary. The glow worm, Arachnocampa luminosa is unique to New Zealand and thousands of these tiny creatures radiate their unmistakable luminescent light as your expert guides explains the Caves' historical and geological significance. 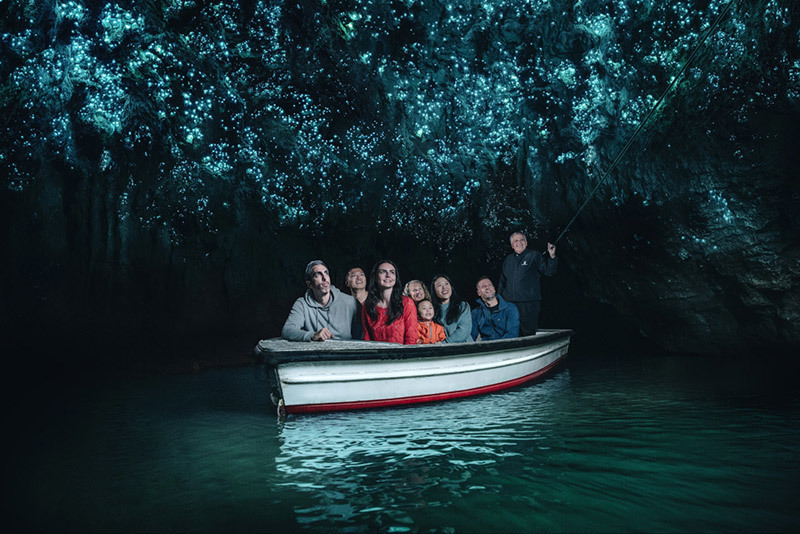 A highlight of a visit to Waitomo Caves is the river boat ride under the thousands of magical glowworms. The boat tour takes you into the cave past the thousands of magical glowworms. 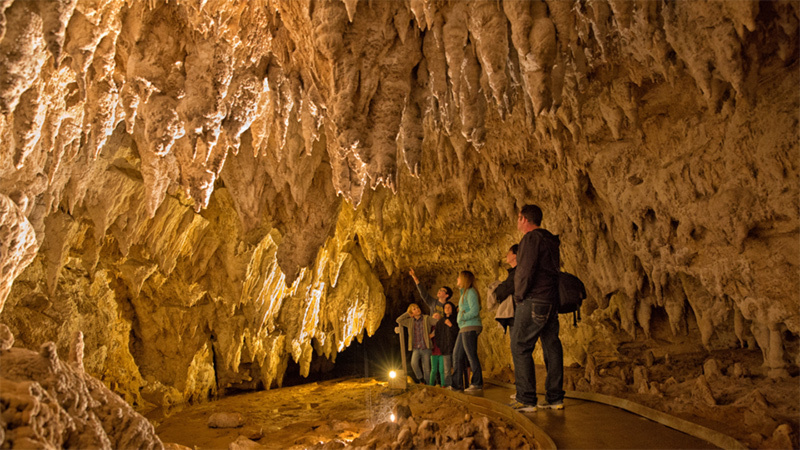 The guided tour continues inside the caves with information and history about the amazing rock formations. 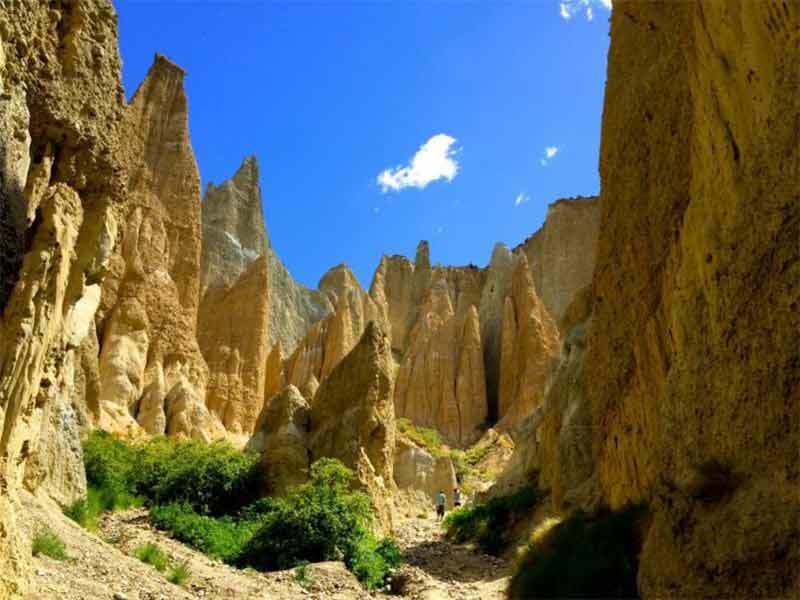 After visiting Hobbiton, instead of driving directly to Rotorua, you have the option of driving for 45 minutes, across the Kaimai Hills to enjoy the beautiful white sand beaches of Mount Maunganui. 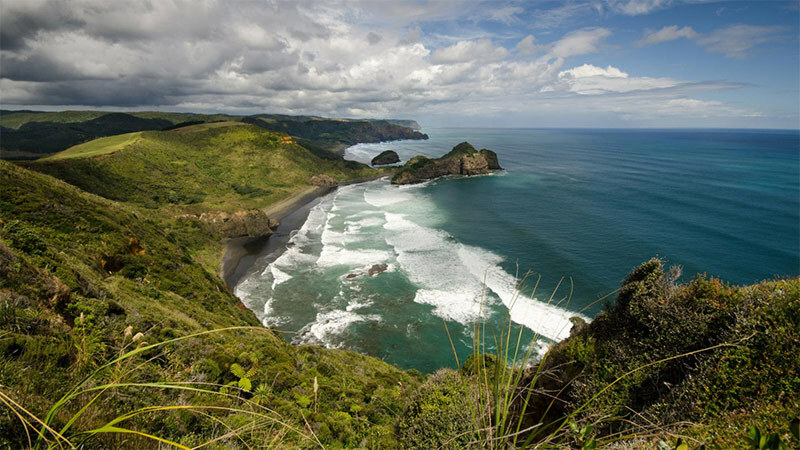 After a swim in the warm Pacific waters or a pleasant stroll to the summit of Mount Maunganui, it's a just an hours further drive, via a lovely scenic route to Rotorua. Relaxing on the sandy beach after a swim in the surf. 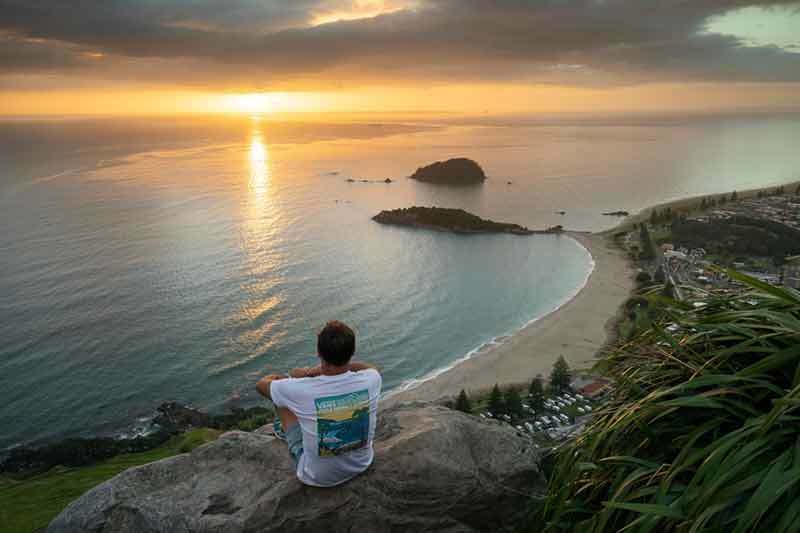 The walk up to the top of the Mt Maunganui is well worth it for the views. 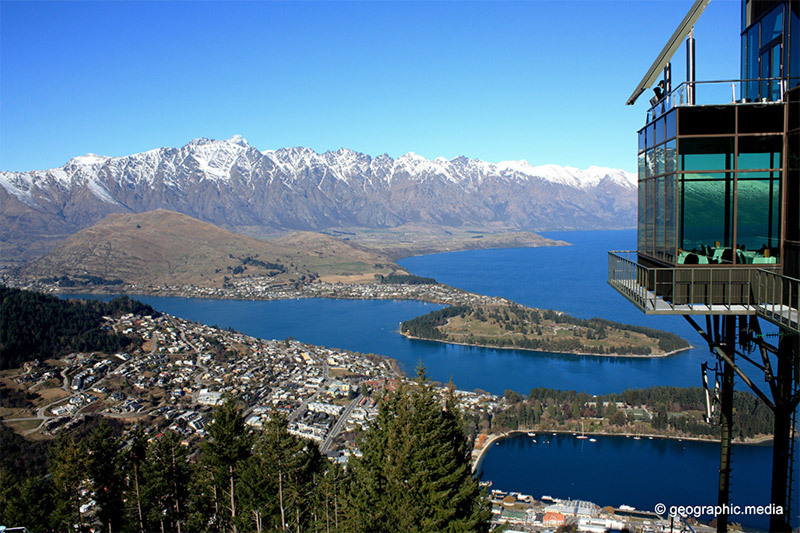 The stunning views from the the summit include the inner port and harbor. This is a historic natural hot mineral springs spa that for 3 years in a row was selected by Conde Nast Traveler as one of the world's top ten Medical & Thermal Spas. 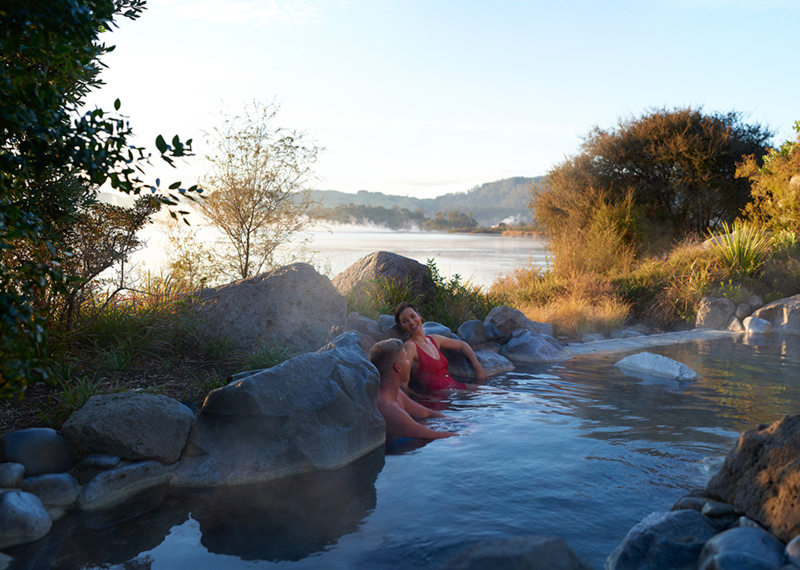 There are twenty-seven hot mineral pools in the Lake Spa offering a complete range of body & skin therapies. Visitor options range from family pools to private luxury seclusion. Lie back, relax, enjoy! 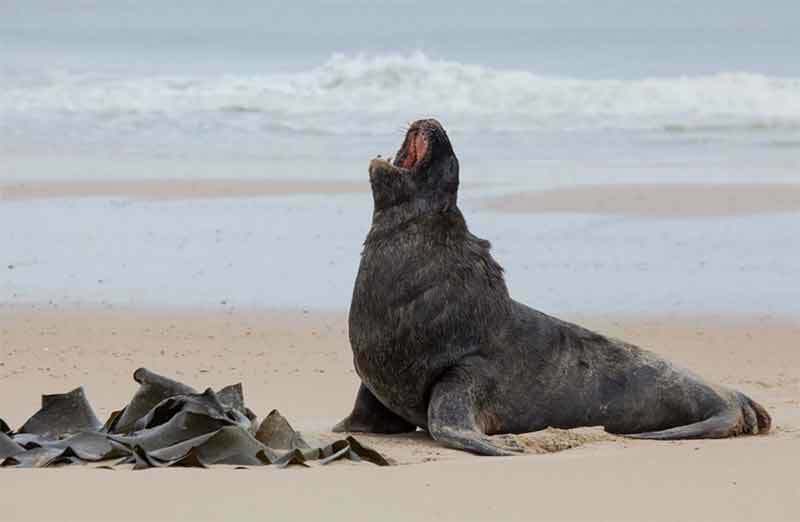 It doesn't get more relaxing than an invigorating mud bath. 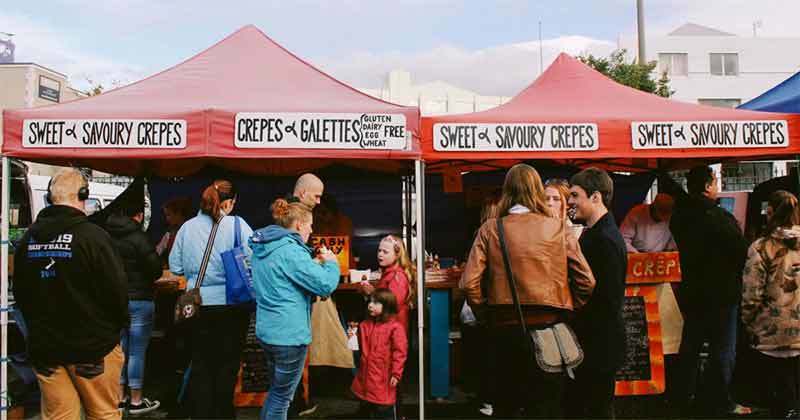 There are many options available in Rotorua for enjoying a traditional Māori feast. 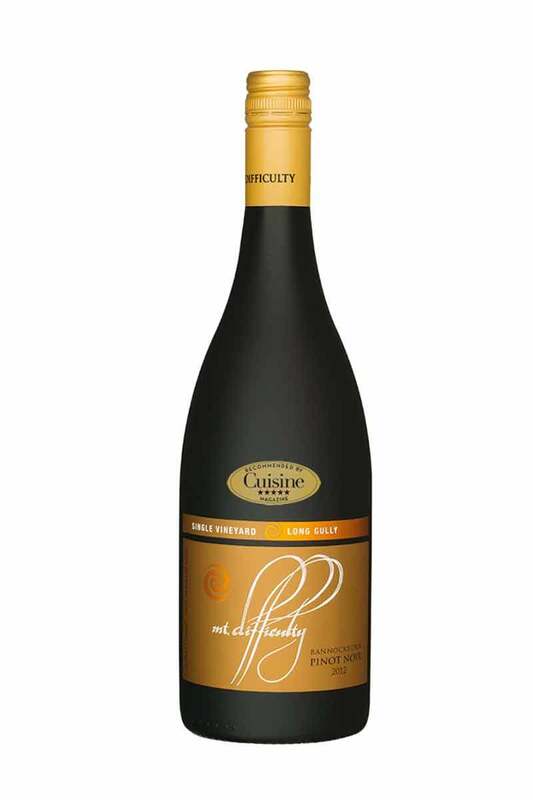 We selected this particular one becasue, quite simply, it's the best. Guests are welcomed to Mitai Māori Village by the arrival of warriors in their war canoe. 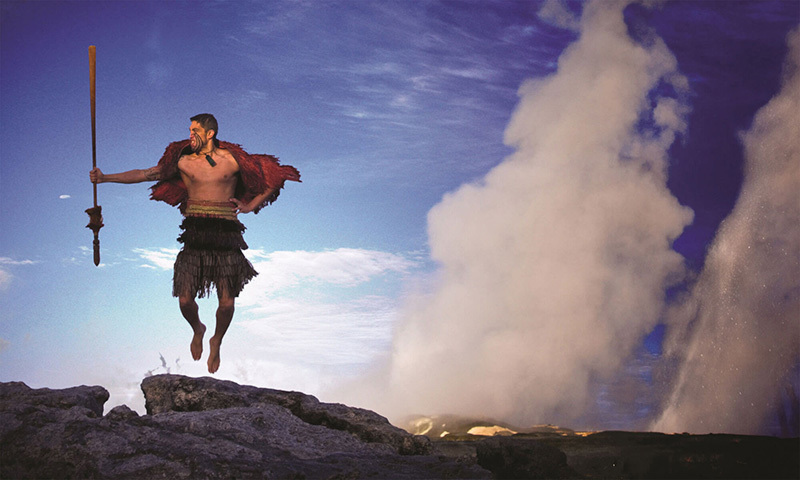 Within the village, guests are entertained with the performing dances of the Māori, including the poi, and of course the war cries of the haka. 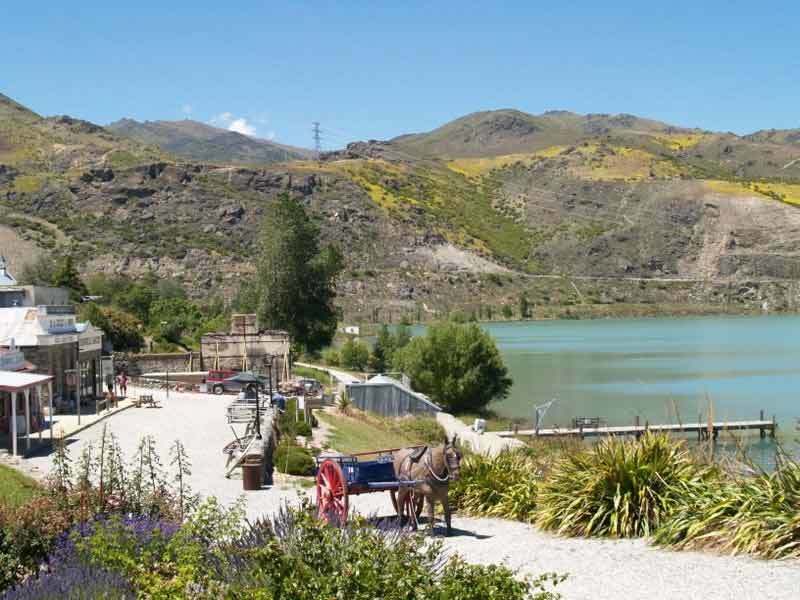 By the time they leave, guests will have an understanding of the Māori art of ta moko (tattoos) and they will remember their journey to the sacred pools and the glow worms - and of course, not forgetting the delicious food cooked in the earth oven - the Hangi as it is called by the Māori people. A warrior announces the ceremonial arrival of the canoe. 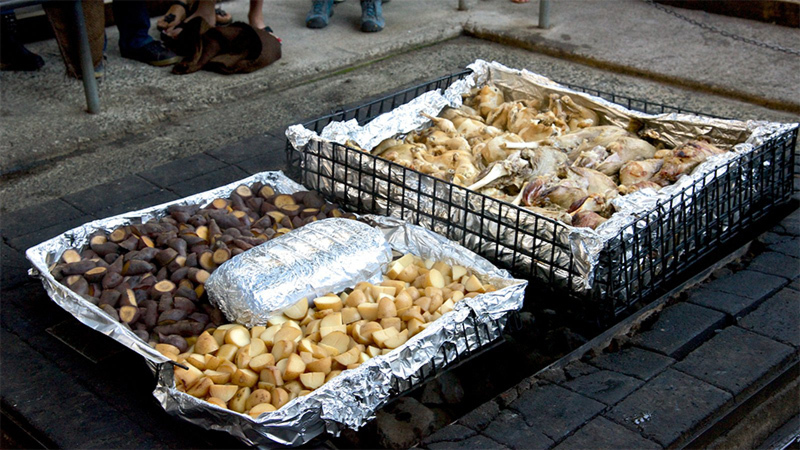 Delicious food taken from the hot earth oven, the hangi. 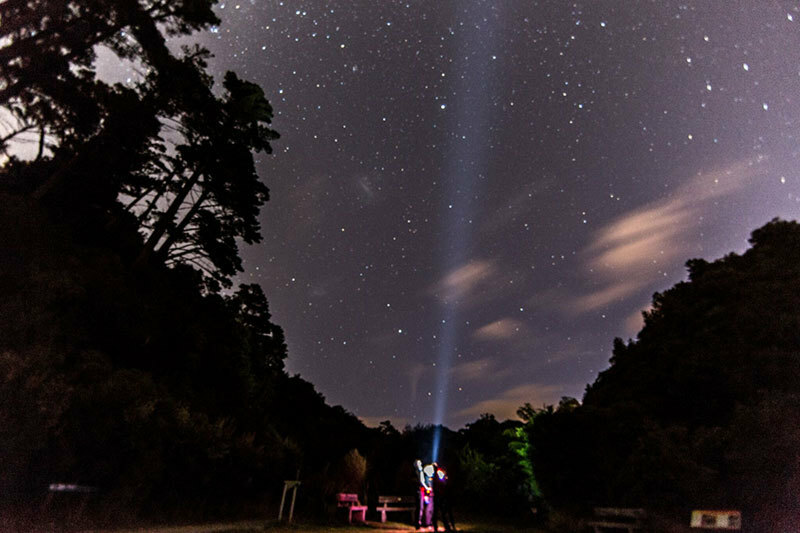 Explore constellations, look for a shooting star and discover planets invisible to the naked eye with the Skyline Rotorua Stargazing experience. 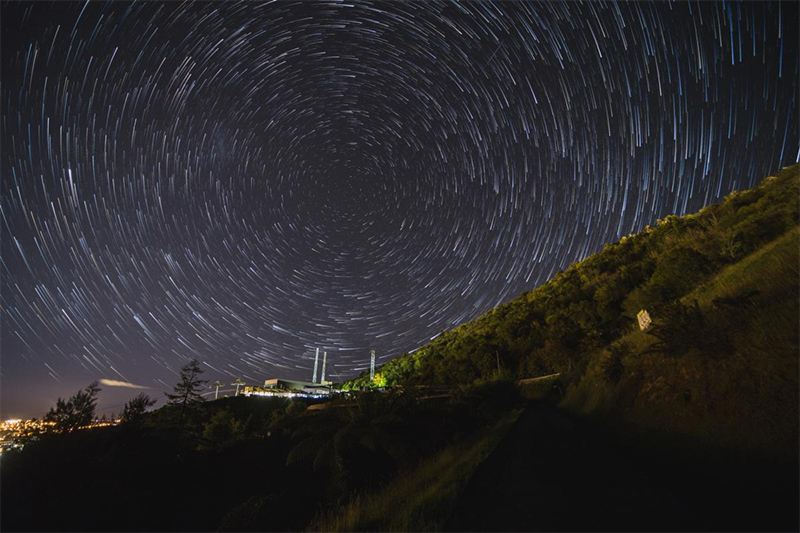 Ngongotaha is one of the top eight locations in New Zealand for stargazing where the dark clear skies blanketing Rotorua make for a breathtaking experience. 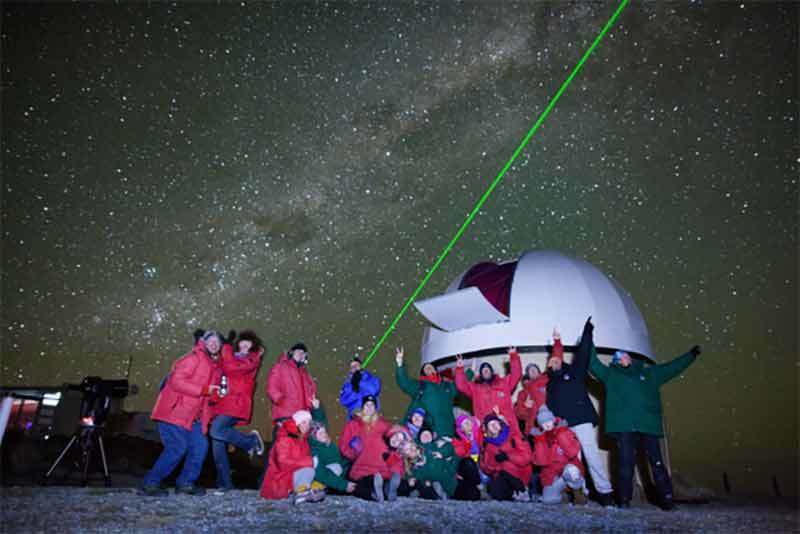 Keen stargazers have the opportunity to access a 'hidden world' not seen by the naked eye, and impossible to see in many other locations around the world. 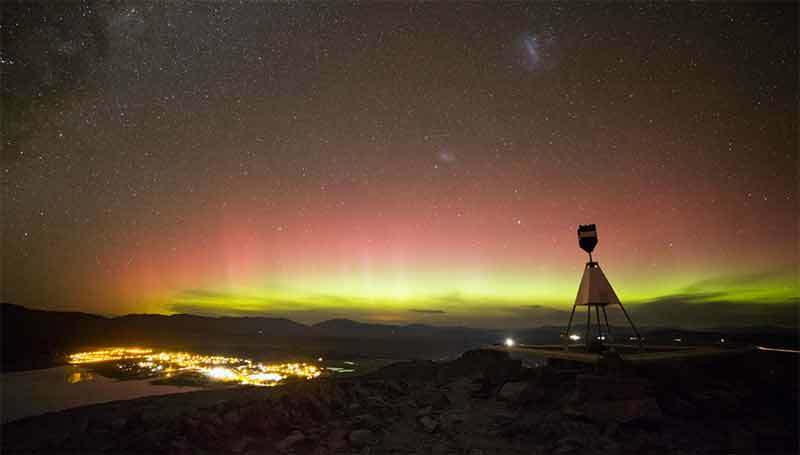 Skyline Stargazing takes visitors to a specially-constructed area high above the Gondola, where there is no trespassing light, allowing for an unbelievably clear view of the night sky. 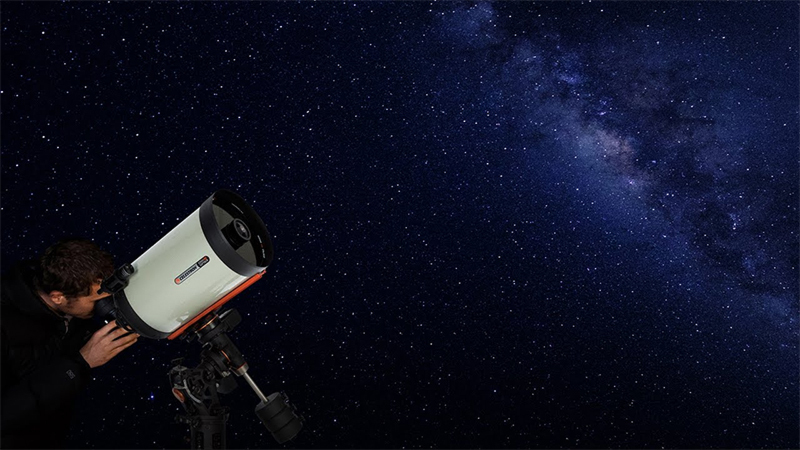 Top-of-the line telescopes give stargazers the chance to view an amazing array of stunning sights, from the iconic Southern Cross, to nebulas, planets, the Milky Way and other galaxies. After taking-in the beauty of the night sky, settle down for dinner at Stratosfare Restaurant. 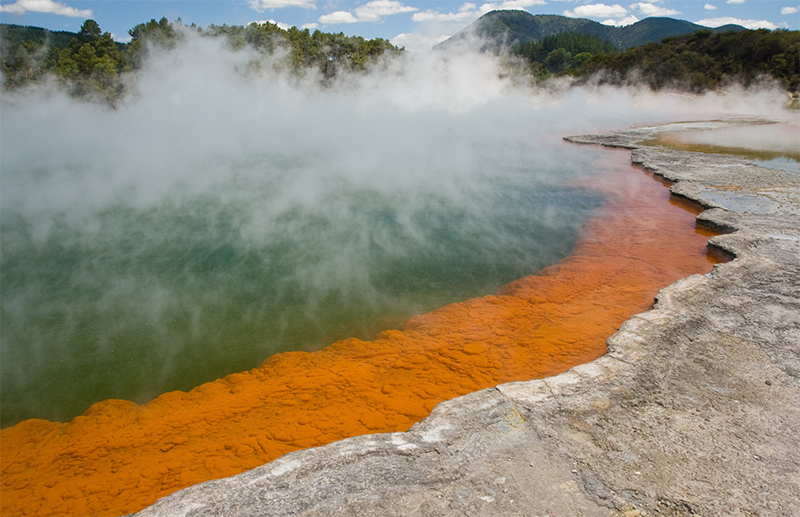 The Wai-o-Tapu Thermal Wonderland is located 20 miles south of Rotorua, providing a chance to explore spectacular scenery in New Zealand’s most colourful volcanic zone. 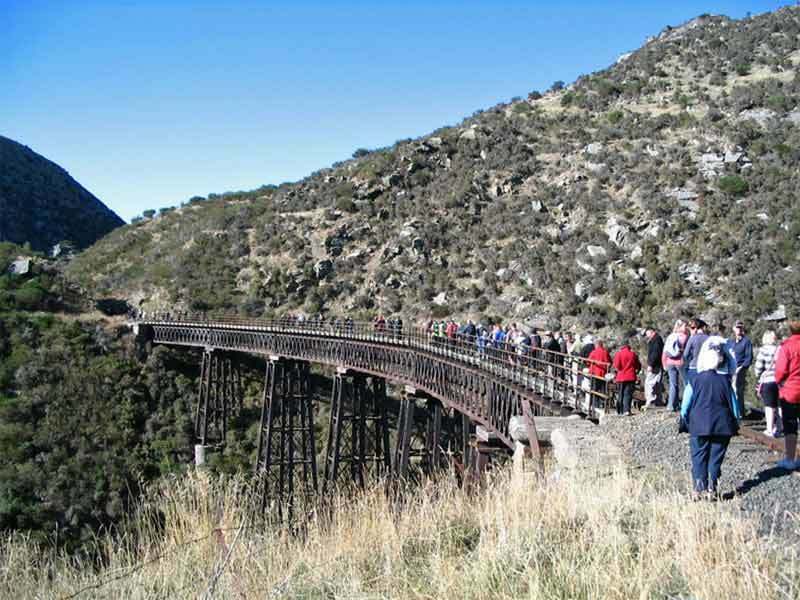 See unique volcanic features as you walk at your own pace along well defined tracks. 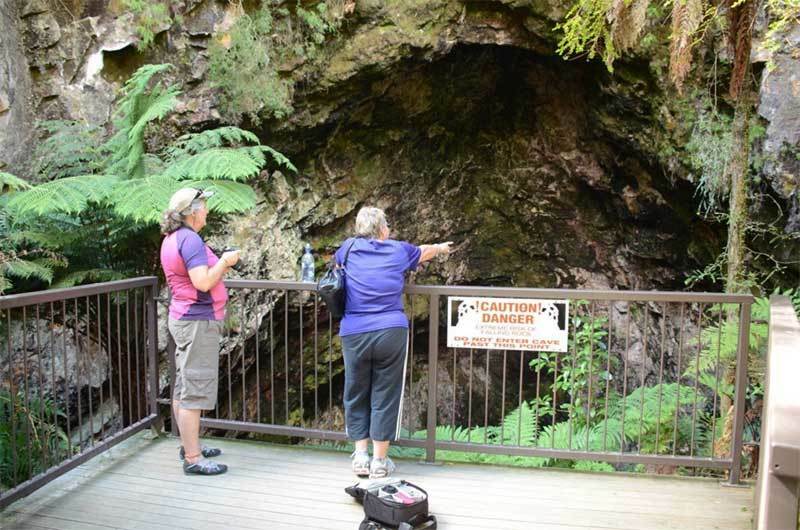 At 10.15am each day there's the opportunity to learn the history and mechanics of the famous Lady Knox Geyser. 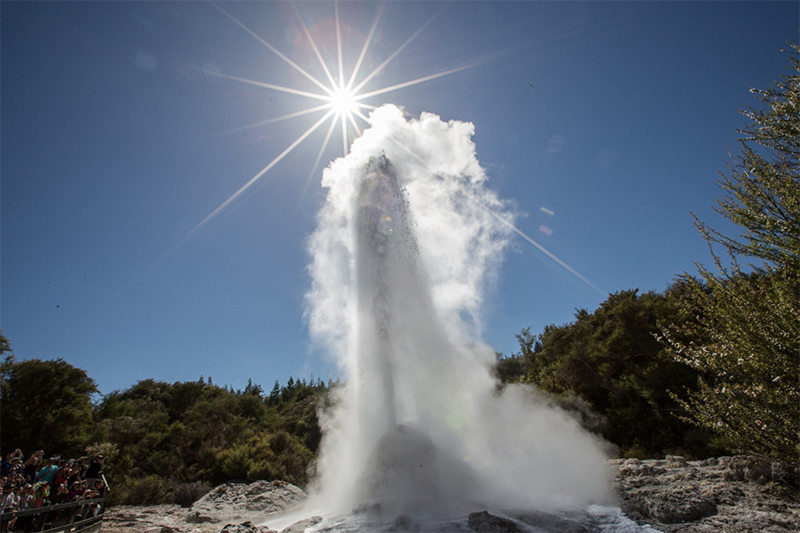 A presentation by an expert guide in the natural amphitheatre, is an opportunity to see the geyser erupt by dropping a surfactant into the opening of the vent, followed by a jet of water spraying into the sky, reaching heights of up to 65 feet. A lunar landscape? 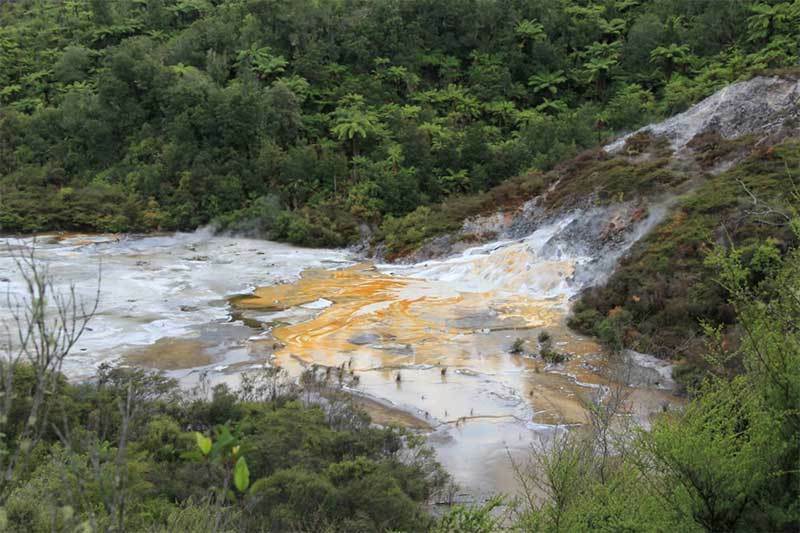 No, it's Wai-O-Tapu. The beauty of nature, in this case a hot one! 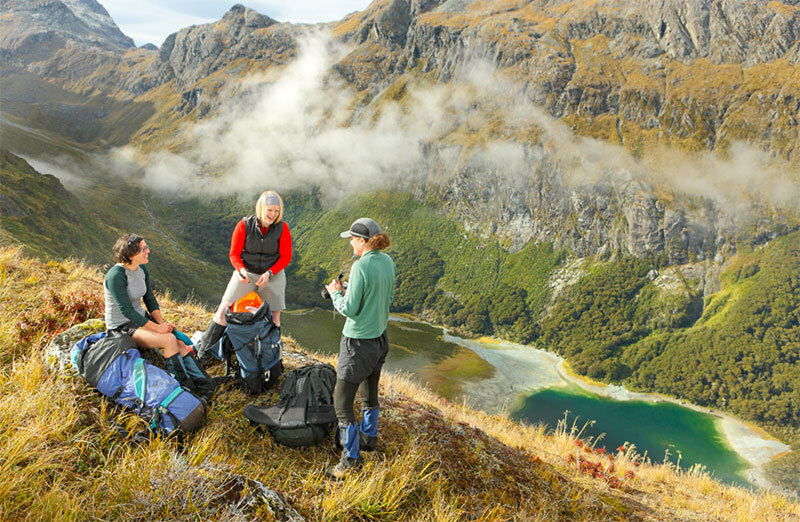 The strange geological formations, the forests and the lakes of Waimangu Valley always creates a sense of wonder for visitors. This is a place of constant geothermal activity and tremendous heat, creating steam, geysers and streams bubbling away at 125 degrees! 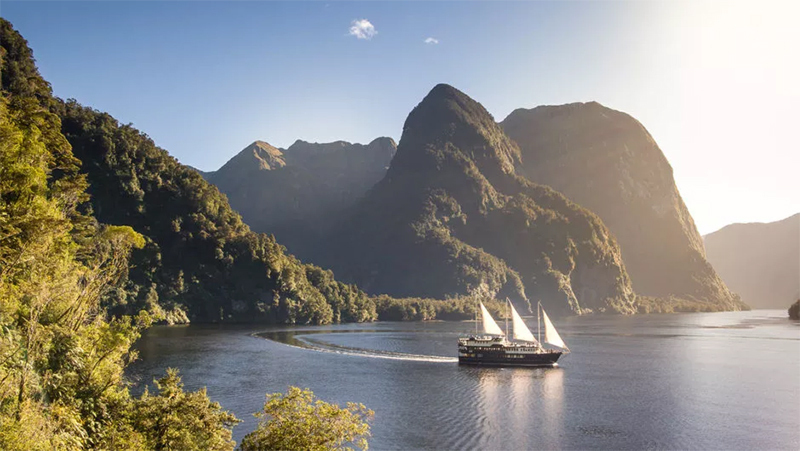 We recommend a cruise on the incredible cobalt blue Lake Rotomahana, where stories will be told of the violent eruptions of 1886 that formed the Waimangu Valley and the natural beauty that it created. 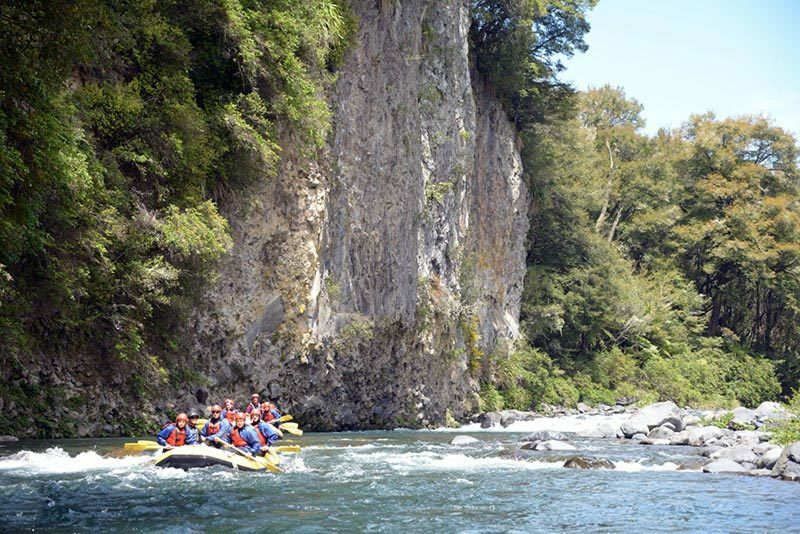 You can also read about our visit to Waimangu Valley in our blog - North Island Highlights - Waimangu Volcanic Valley. Walks through the forests make for amazing views of the cobalt waters. 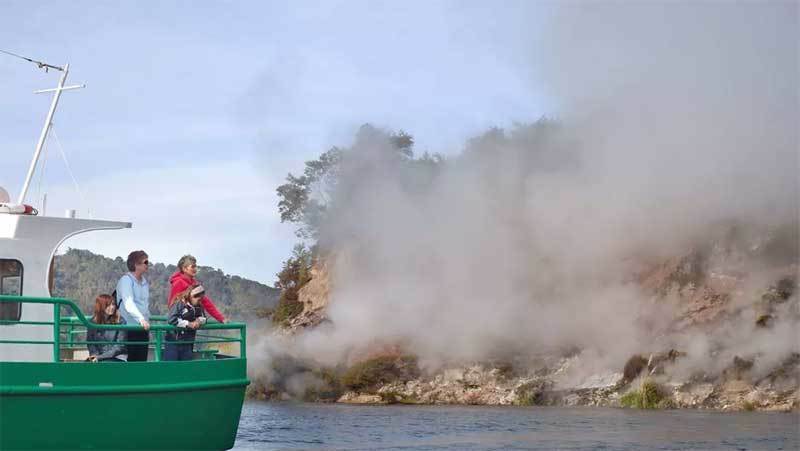 Cruising Lake Rotomahana brings you up close to the geothermal wonders. 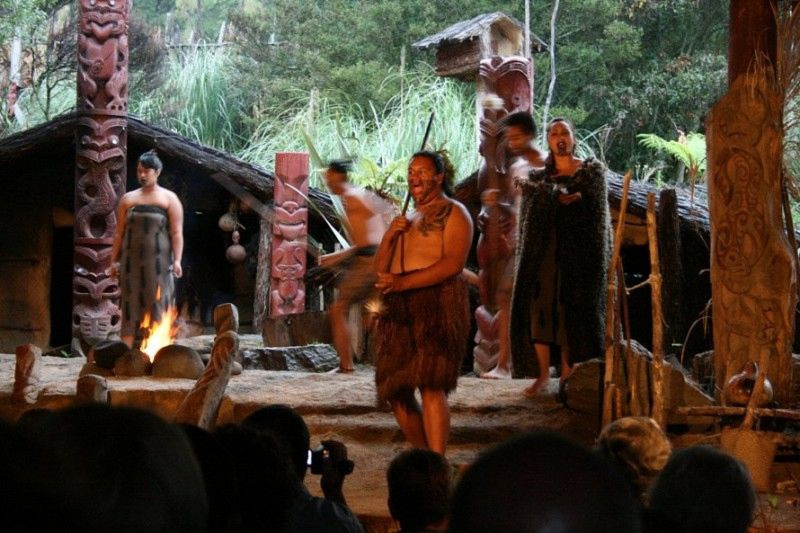 For over 200 years the local Tuhourangi/Ngati Wahiao tribe have welcomed visitors into their 'backyard' and allowed them to experience at first hand the culture of one of Rotorua's most enjoyable attractions. 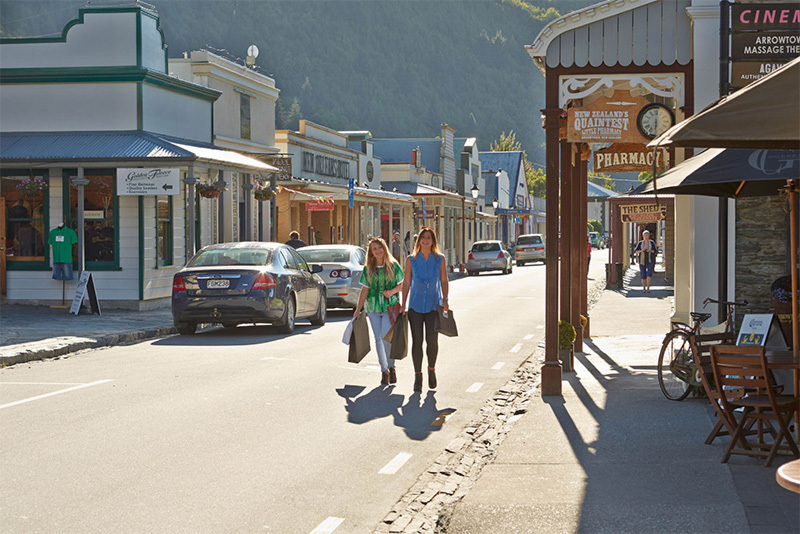 The village and geothermal delights of Whakarewarewa Village are where you'll relive the history of their village, with stories from experienced Māori tour guides who will share the stories from their pasts. 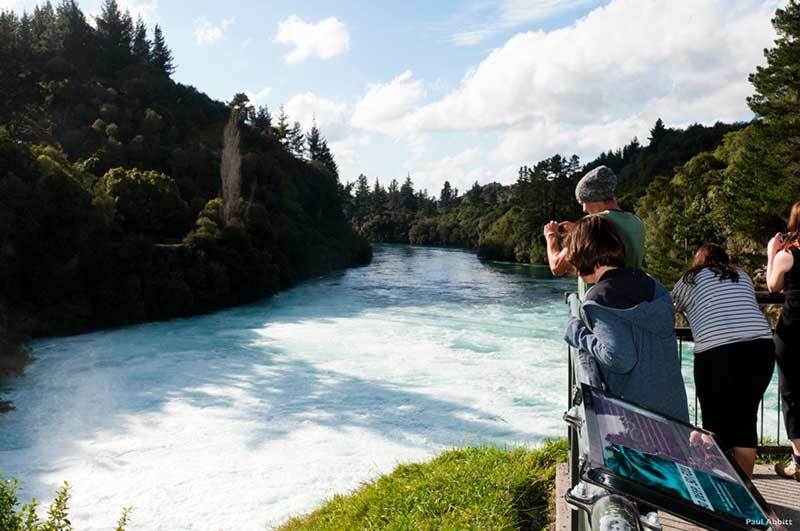 After enjoying the geysers, mud pools and hot springs, be sure to call at Te Puia, New Zealand’s Māori Cultural Centre, located just 5 minutes away. 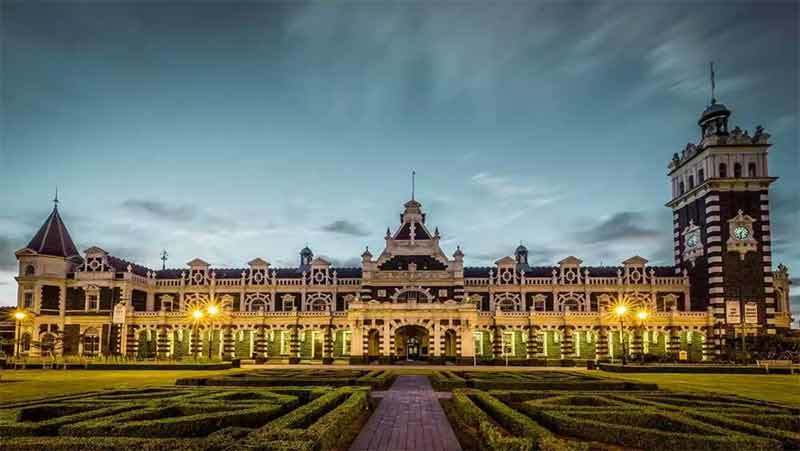 This 150-acre site is also home to the official 'New Zealand Māori Arts and Crafts Institute' a great place to consider the purchase of quality Māori art effects. The geysers at Whakarewaerewa village. 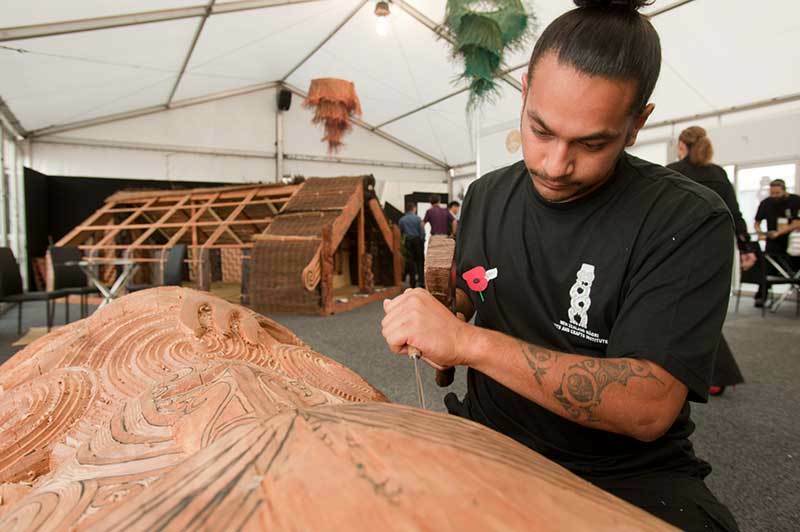 Te Puia showcases Moari arts, craft and culture. Te Puia, NZ Moari Arts and Craft Institute. Wood carving seen at the Institute. 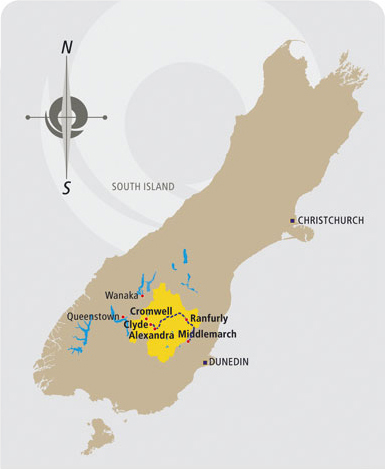 Cost: Whakarewarewa - $25.00. 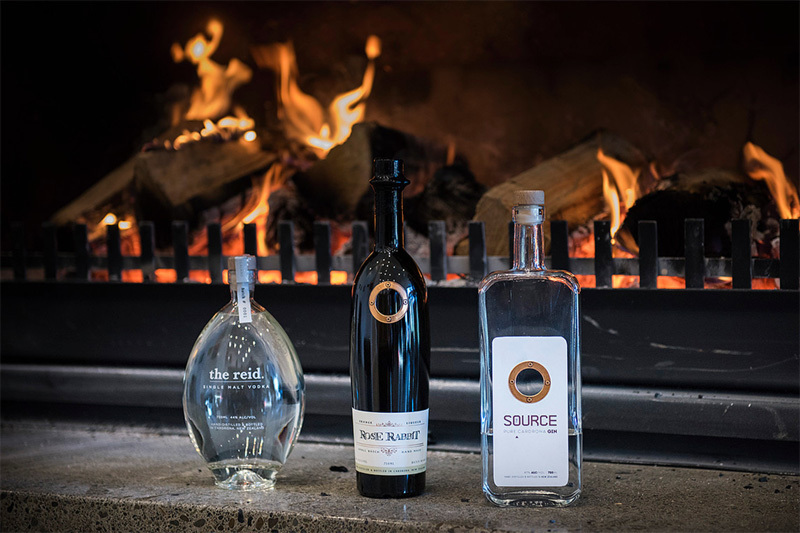 Te Puia From $32.00. 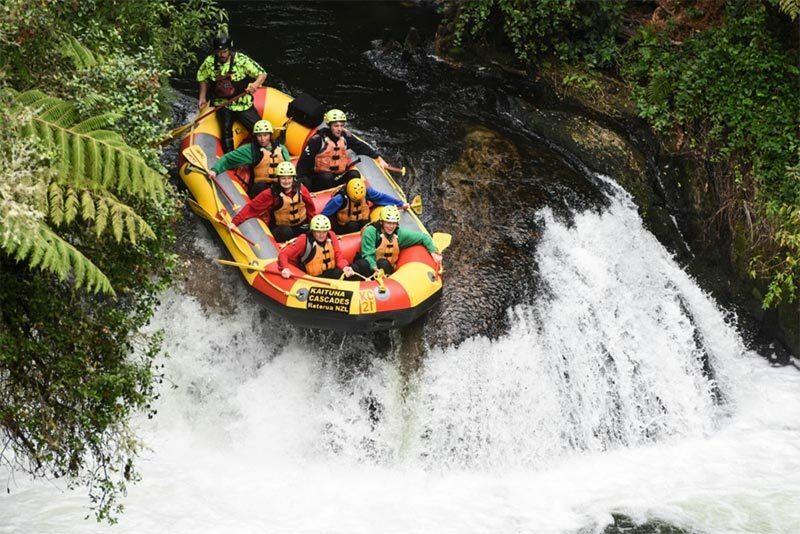 Over the past two years this new activity has taken Rotorua by storm and is now on the must-do list for most visitors. 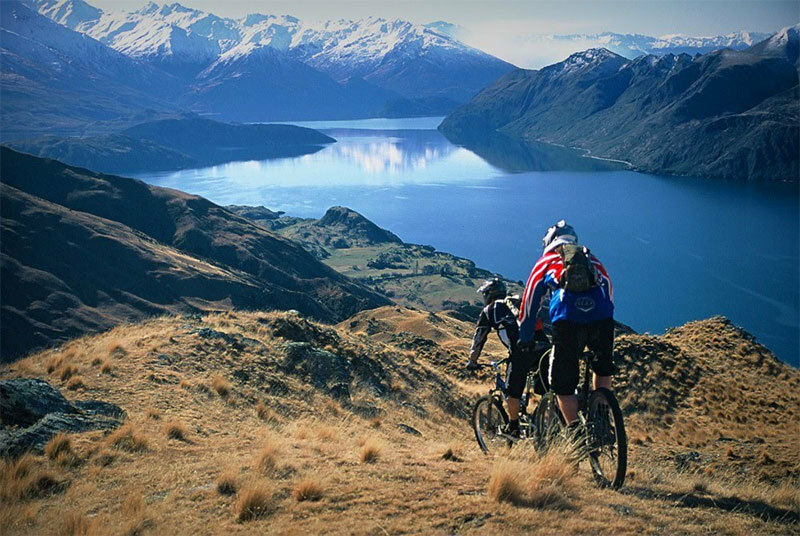 It takes customers on a journey that provides unprecedented views of a magnificent native New Zealand forest. From as high as 72 feet above the ground, safely secured in harnesses, clients travel along an exhilarating 1-mile course. 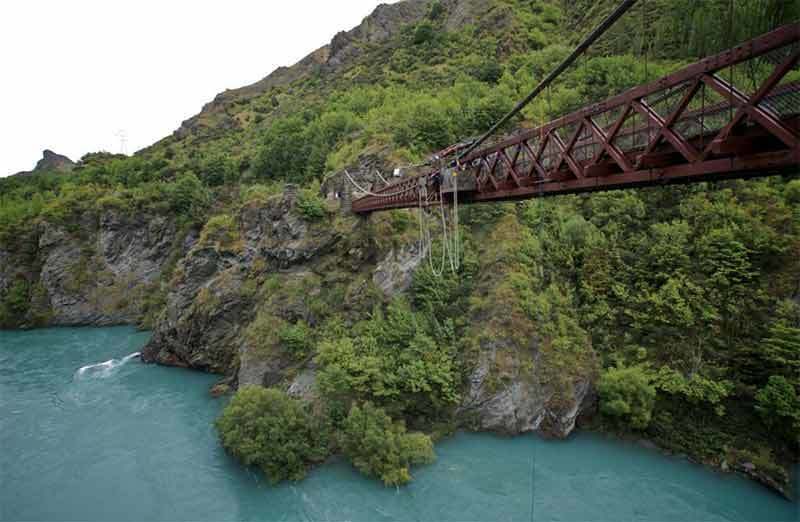 This course is a network of ziplines, tree to tree swing bridges, treetop platforms and walking trails. 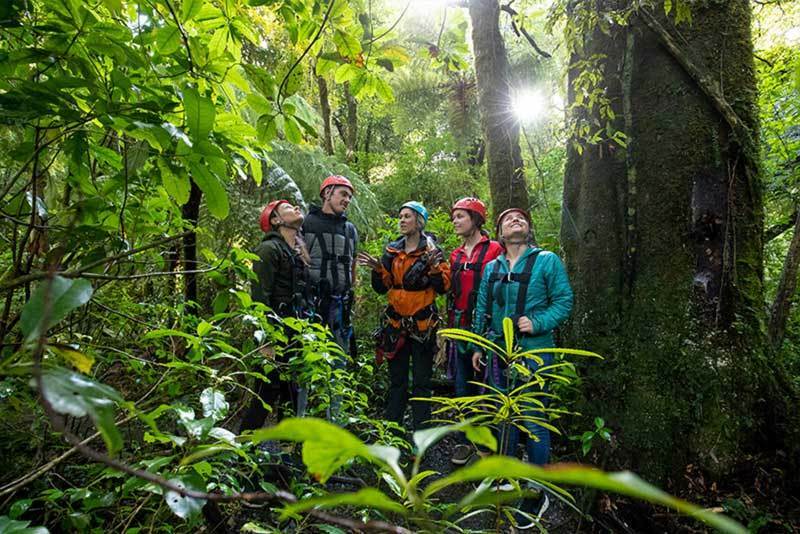 The highlight for many is stepping out of the canopy from a magnificent 500 year old native Rimu tree and travelling 700 feet above a long forgotten forested valley to finish at the hidden landing platform. Jane from our office did the forest canopy tour last year and she thought it was great fun. 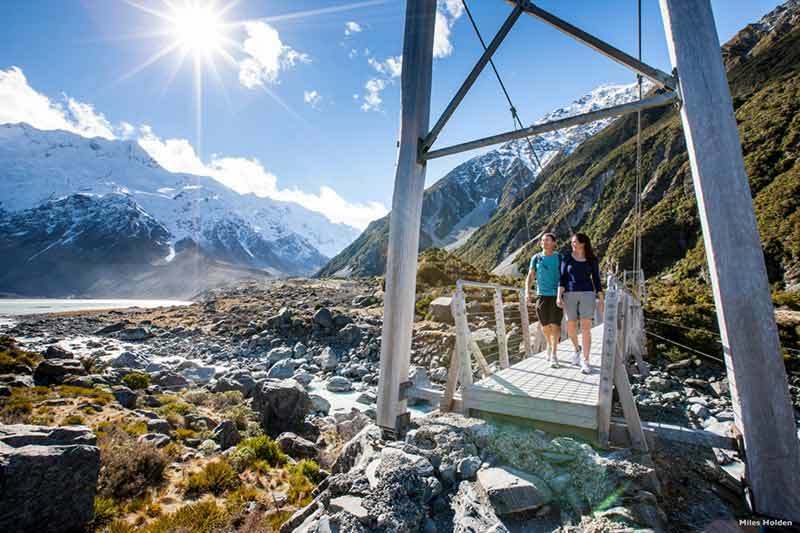 The all Kiwi staff were friendly, knowledgeable and obviously serious about safety issues and this gave her the confidence to try the zipline experience, which she rated as a 5-star thrill. The tour guides are a wealth of knowledge about the rain forest's history and future. Swing bridges provide a view over the ferns and forest floor. 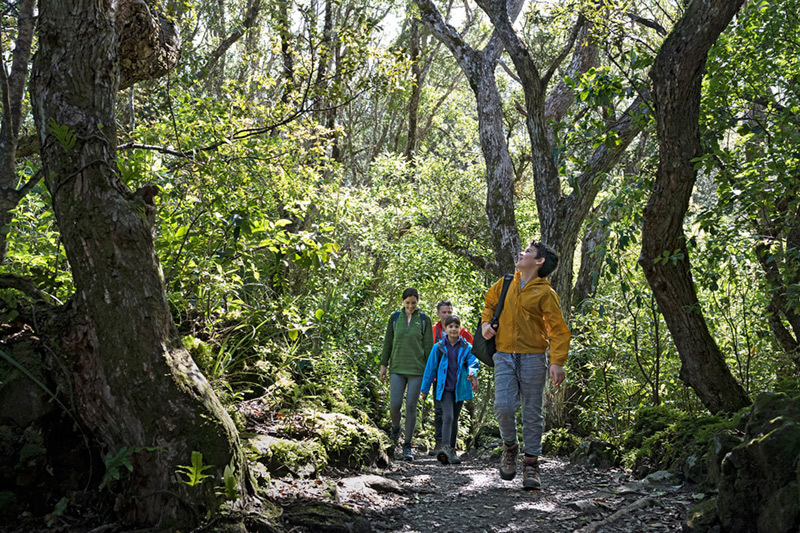 Previously the domain of only the most experienced hikers, the untouched wilderness of the magnificent Whirinaki Rainforest is now accessible on a full-day guided walk. 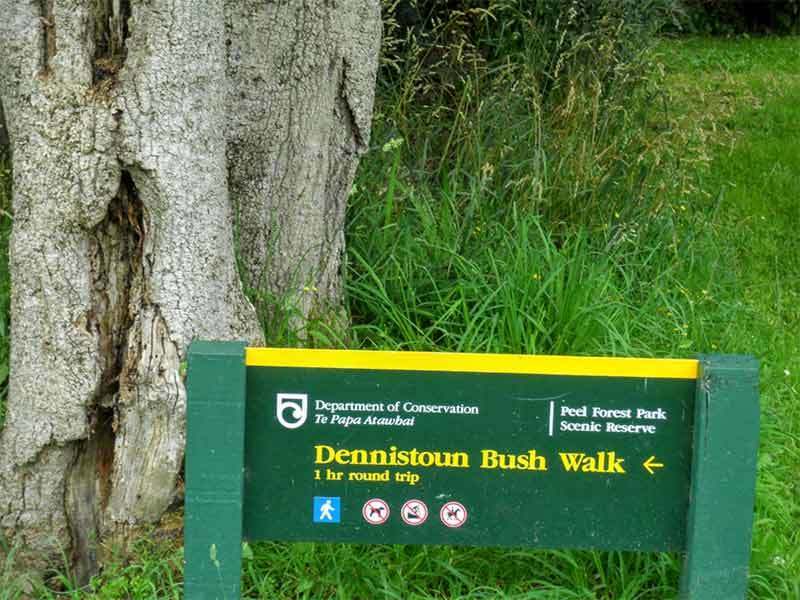 Regarded by many as one of the finest one-day walks in the country. 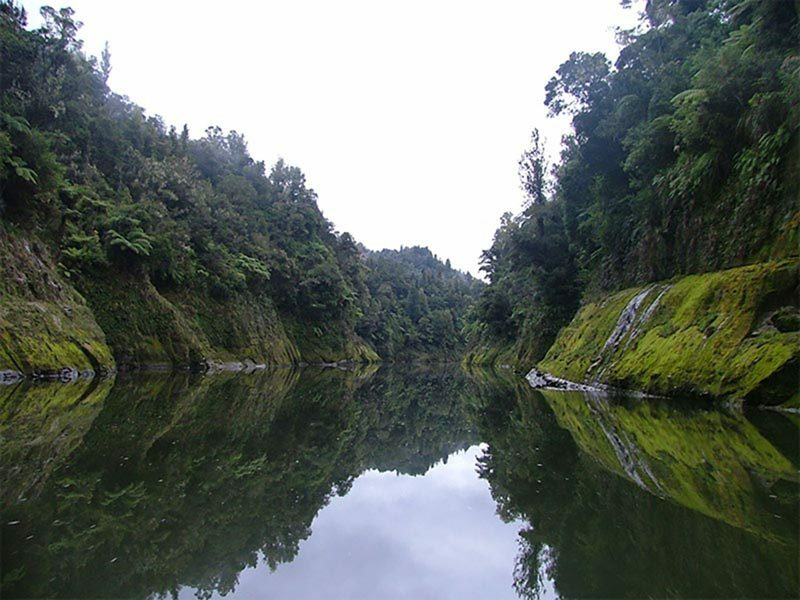 This is where towering rimu,totara, matai, miro and kahikatea trees, some of them 800 to 1000 years old are found. 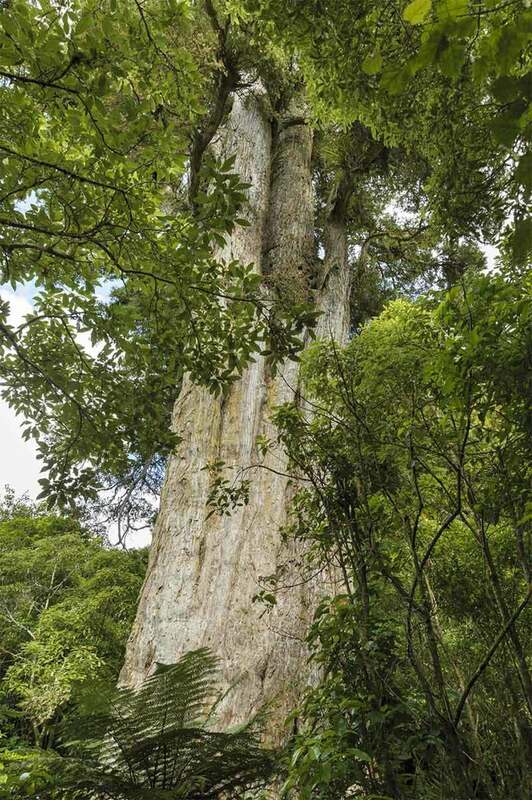 These ancient giants of New Zealand’s podocarp tree species reach for the sky, to heights of over 200 ft. 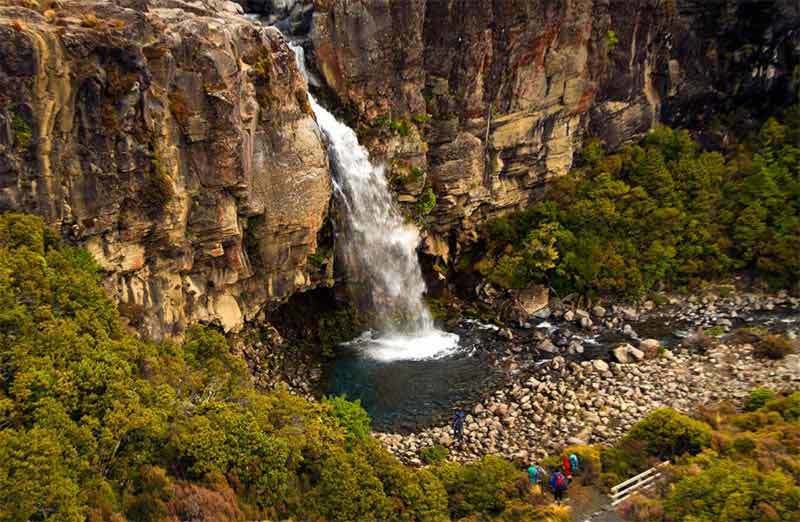 Beneath the forest canopy wonder in awe at the rich diversity of native vegetation and birdlife amidst the spectacular scenery of rushing rivers and cascading waterfalls. 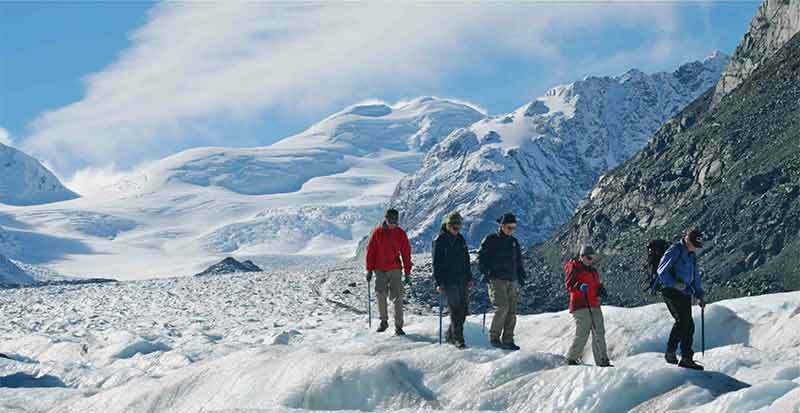 The team here at New Zealand Vacations recommend this tour as a highlight of any New Zealand vacation. 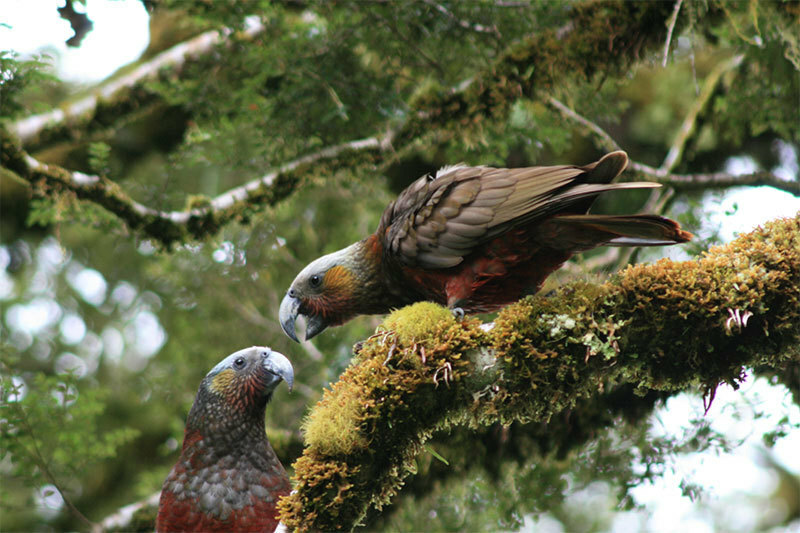 The diversity and richness of the Whirinaki Forests is unequalled. 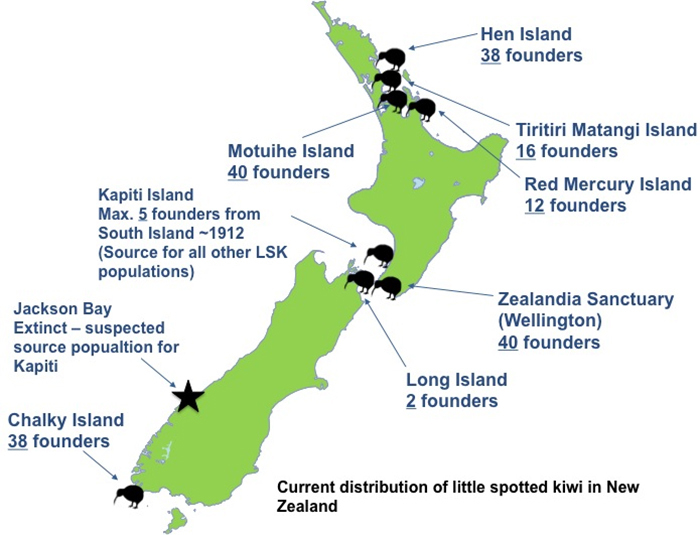 We have an interesting blog about Whirinaki that provides more background information. 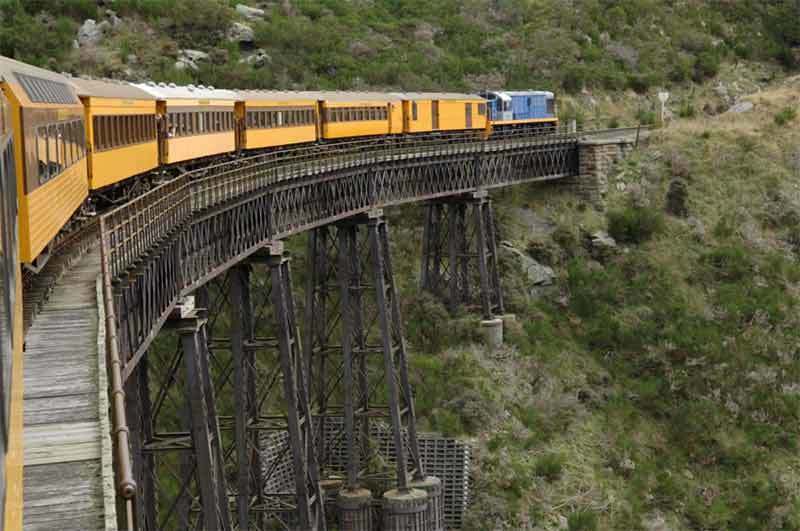 The full day guided walk has tracks and bridges leading into the otherwise untouched forest. 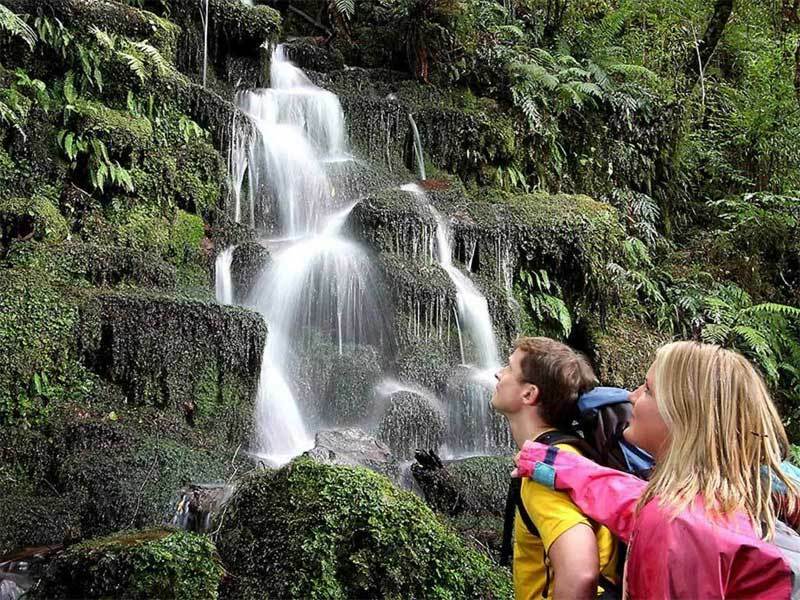 Cascading waterfalls are a highlight for many on the guided walk. 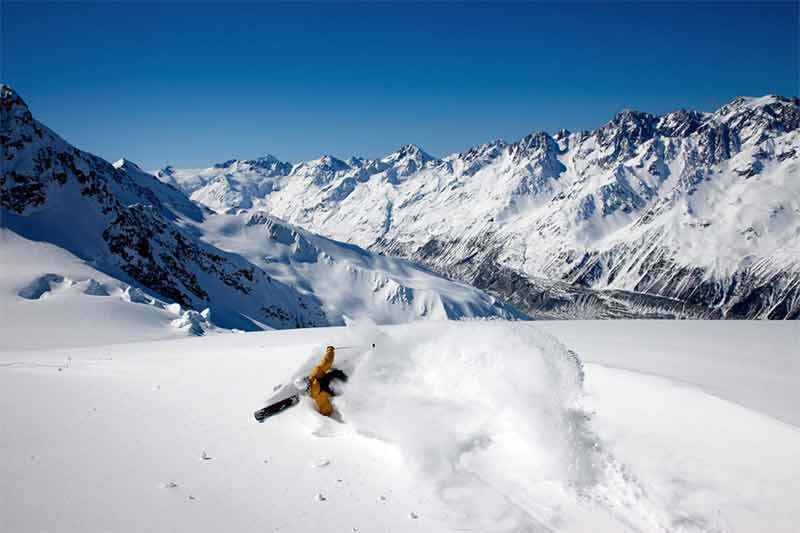 This is something for those who enjoy getting right off the beaten track! 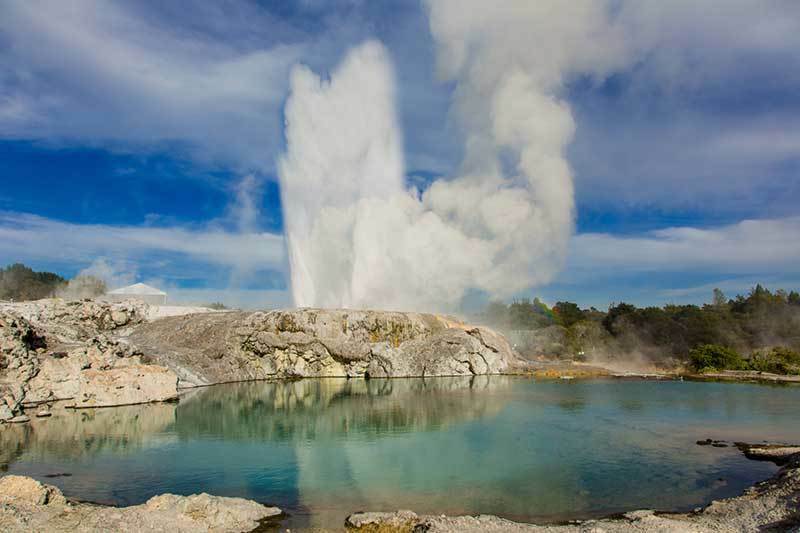 Because of its remoteness, it's not as well known as the other geothermal attractions of this region, but for those willing to take the drive in, its definitely worth the effort. 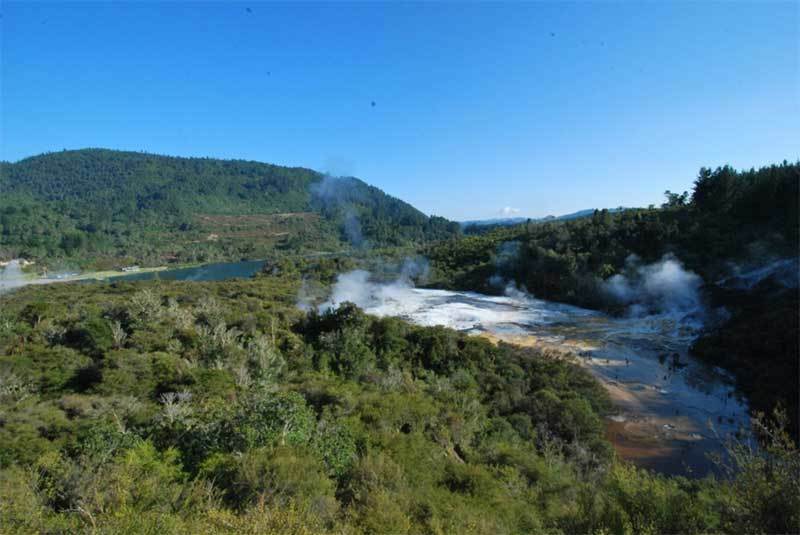 The Lonely Planet Guide says "Orakei Korako is possibly the best thermal area left in New Zealand and one of the finest in the world". They are right. 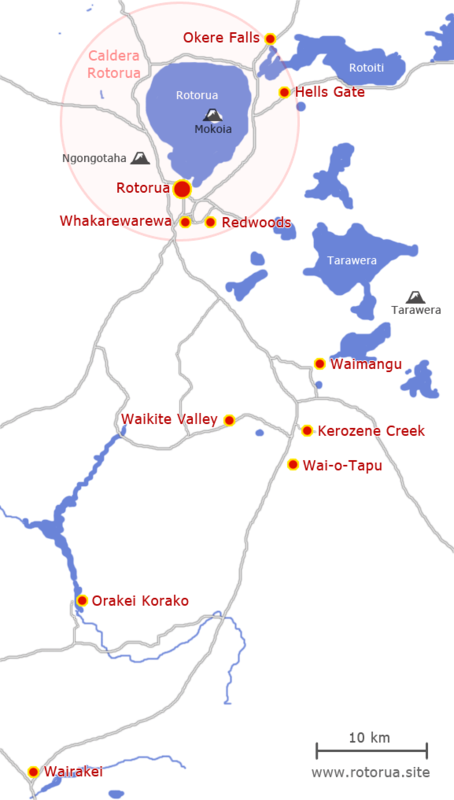 Orakei Korako Cave and Thermal Park are located at Hidden Valley. 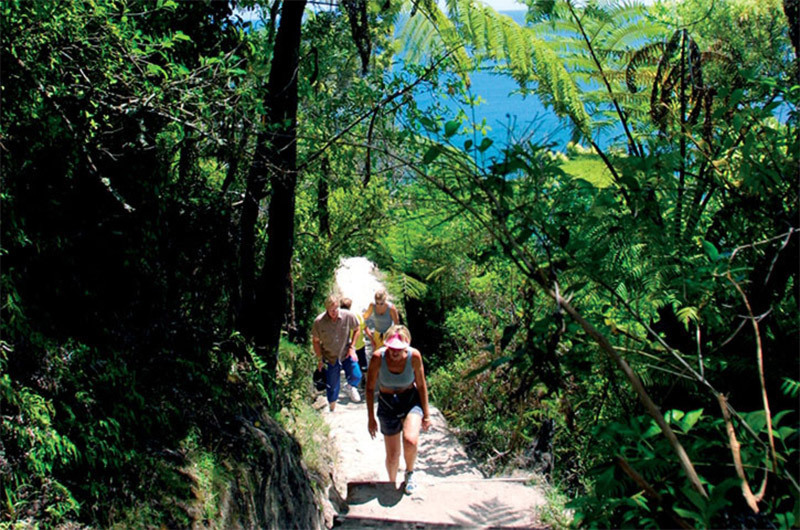 Travel down State Highway 5 in the direction of Taupo for 23-miles to Golden Springs. 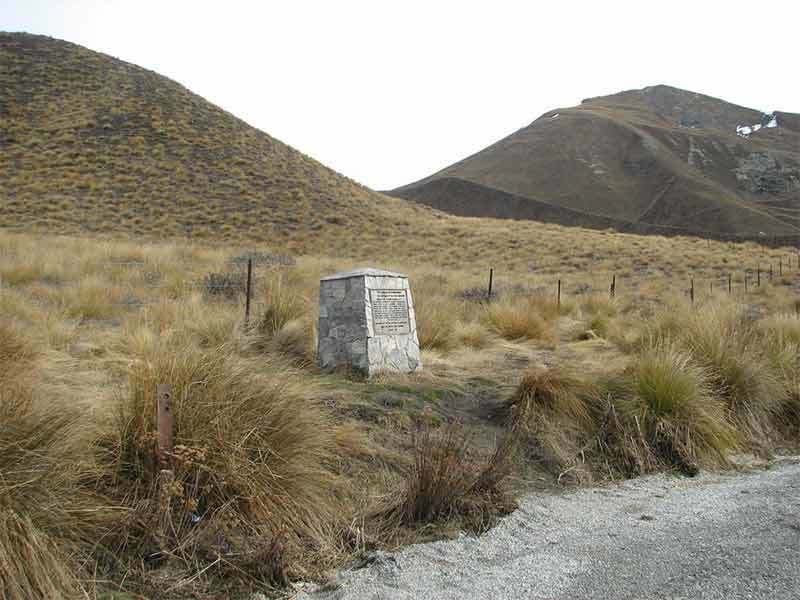 2-miles south of Golden Springs, take the turnoff to Orakei Korako on the Tutukau Rd. Travel 10-miles then turn right onto Orakei Korako Rd, then travel the final 3-miles to the end of the road. 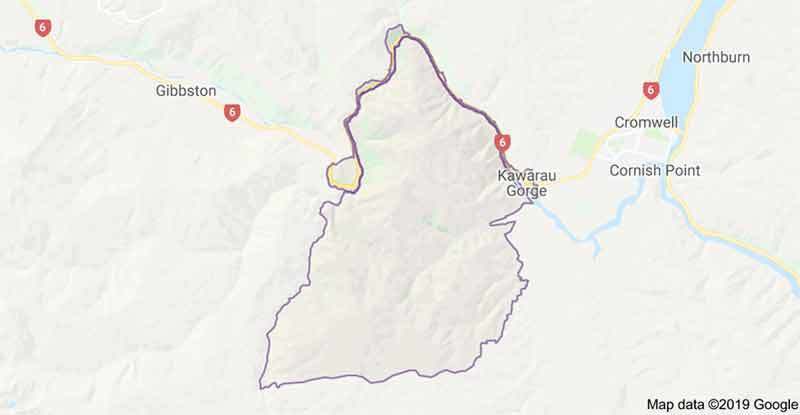 Approximate driving time from Rotorua is 45 minutes. All of these roads are sealed. How magical is this experience? 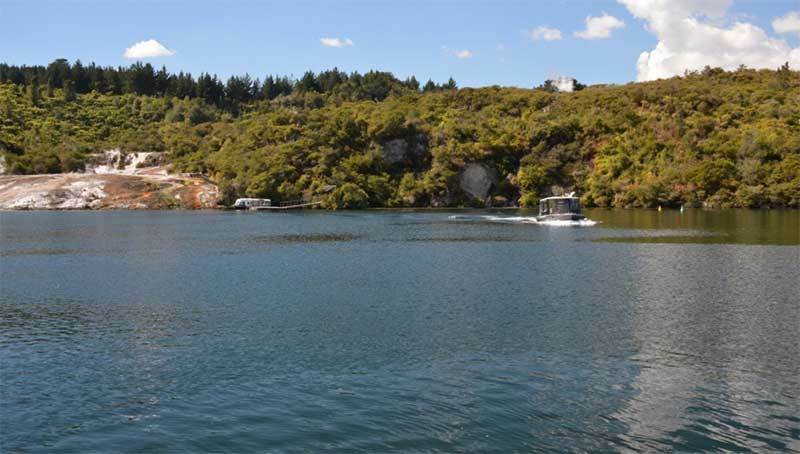 You arrive at the Hidden Valley, park your car beside Lake Ohakuri, head off and buy a ticket to the Orakei Korako Cave and Thermal Park, catch a ferry across the lake and start your adventures. 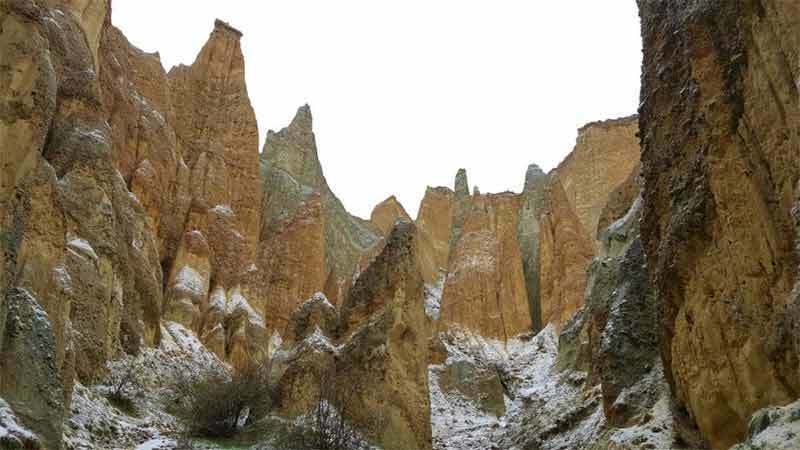 It is a mythical start to a remarkable set of natural features. As you cross the lake the Emerald Terrace tumbles down into the lake. Above it the steam from a thousand hot springs wafts around in the breeze. The ferry moors at the jetty and you start the walk - a circle - around the Thermal Park. 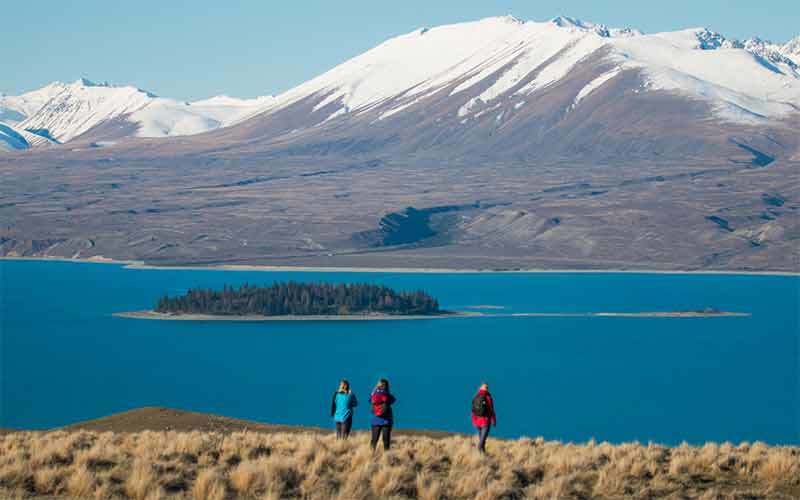 In about 2-miles you will see everything that thermal New Zealand can offer. 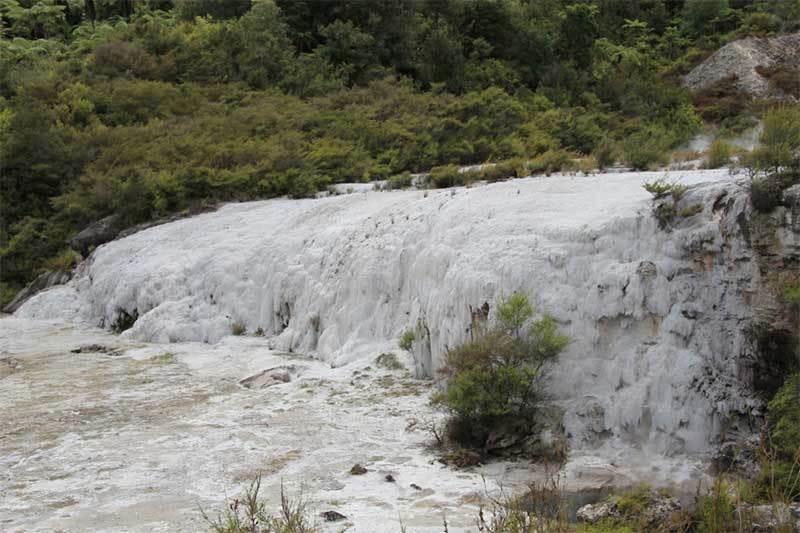 What Rotorua offers in two days, Orakei Korako offers in two hours. The wooden walkway crosses the Emerald Terrace where mineral-based golds and oranges mix with whites and browns in a rainbow of colors. 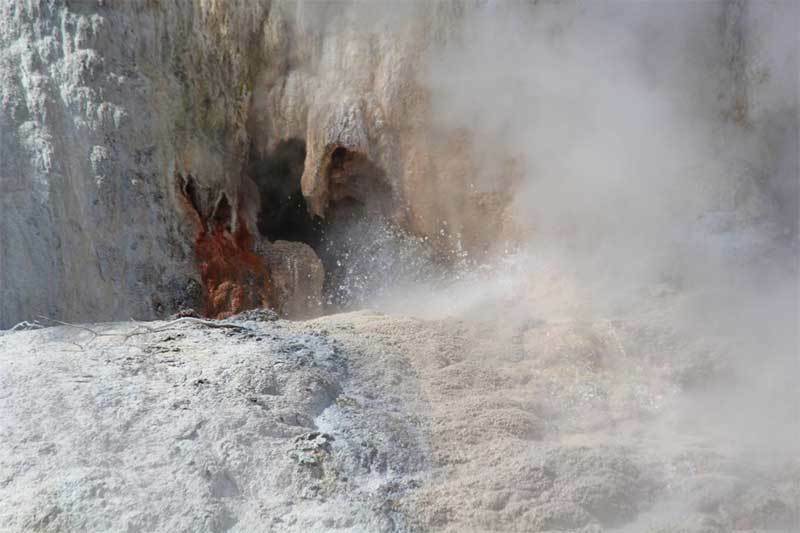 You then reach the Diamond Geyser where every few minutes a fountain of water cascades down the mineral-encrusted rocks. Then it's on to the Rainbow and Cascade Terrace, a beautiful formation that looks as though it belongs in a cave rather than as a broad thermal terrace. At one point there is a huge white terrace which looks like a freshly shorn sheep's fleece. 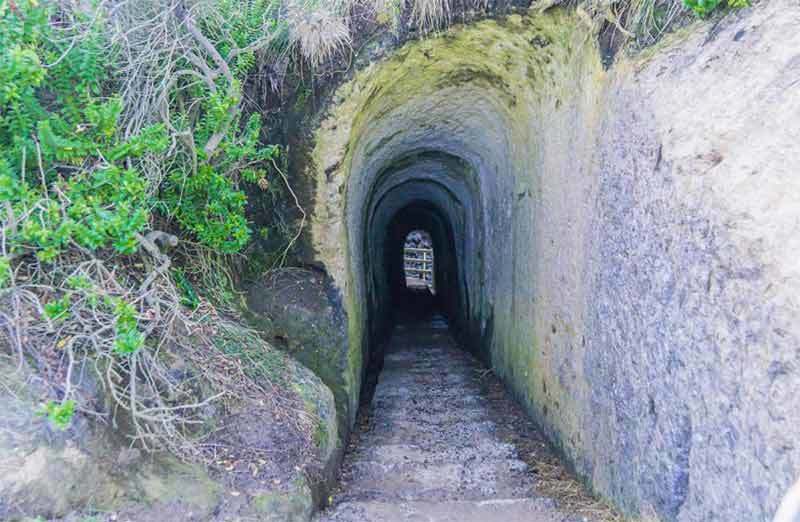 Further up the hillside is Ruatapa Cave, a deep cave with warm water in the pool below. And beyond that, in a delightful walk through a rainforest, are mud pools which bubble away like a witch's cauldron. 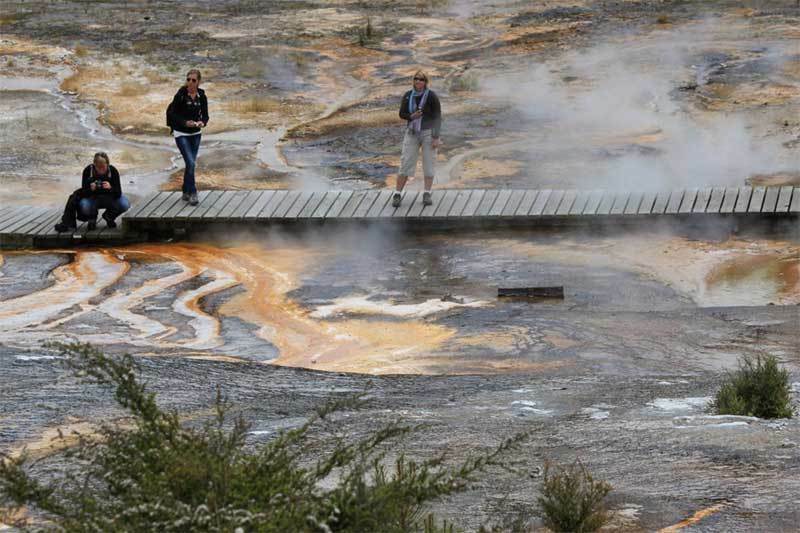 It is an unforgettable geothermal experience. 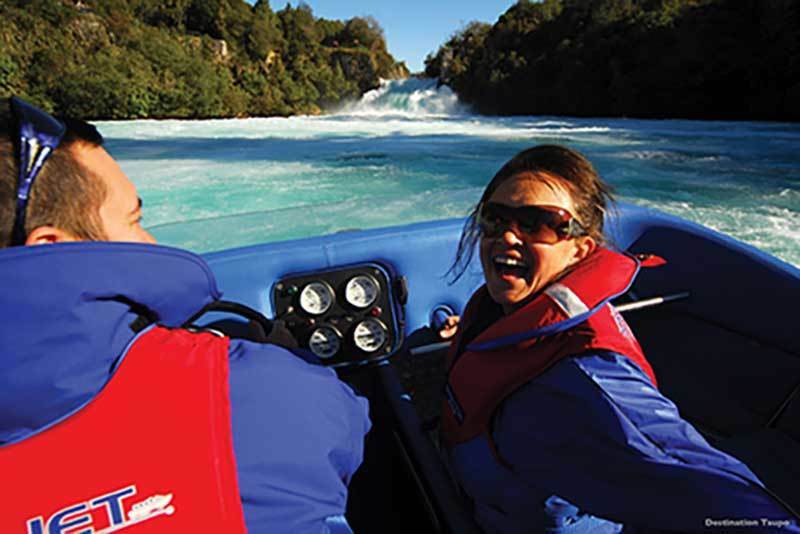 Lake Taupo is New Zealand's largest lake and it empties into the country's longest river, The Waikato, at the mighty Huka Falls. At this point the banks of the falls are just 300ft part, so the view and the sounds of the falls are truly spectacular. 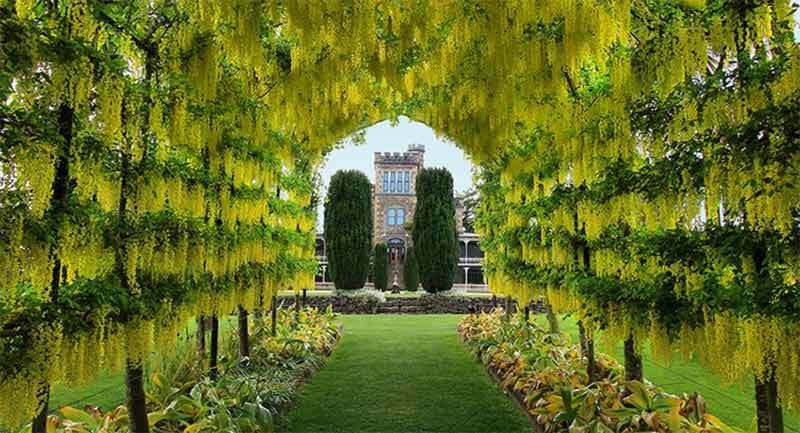 Don't miss it, just off the main road before arriving at the town of Taupo. 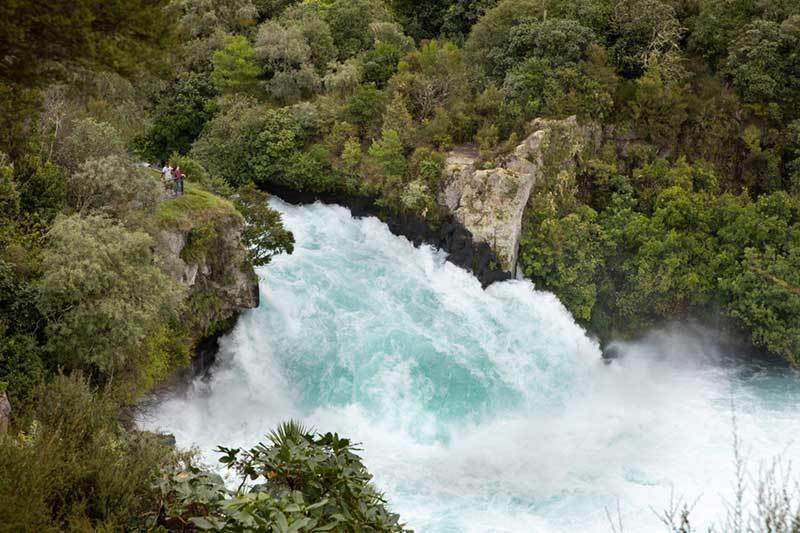 The magnificent Huka Falls - well worth the stop. The viewing and information platform is a great standpoint for photos. 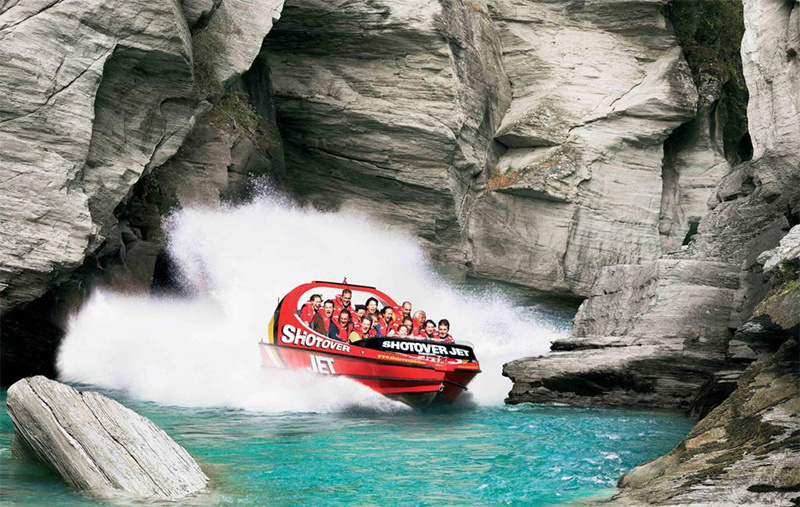 For the more adventurous an exciting jet boat ride is another way to view the falls up close. 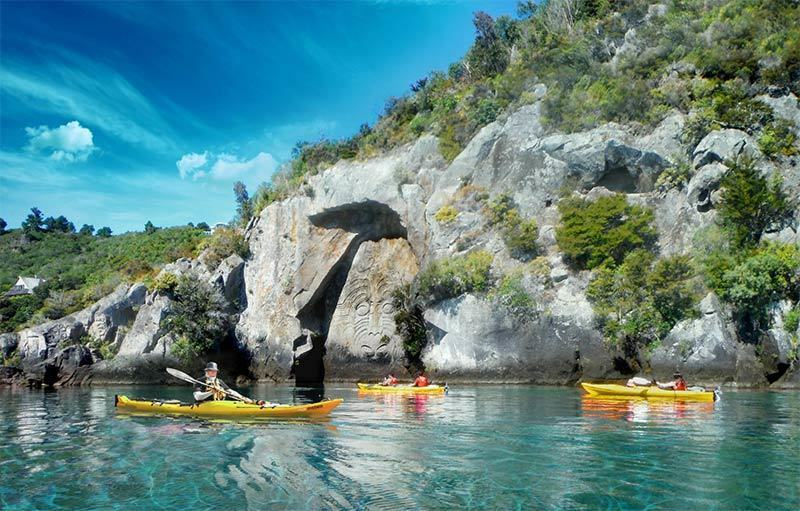 This kayak lake tour includes a visit to a series of huge stone carvings on the lake, created by master Maori carver Matahi Whakataka-Brightwell. 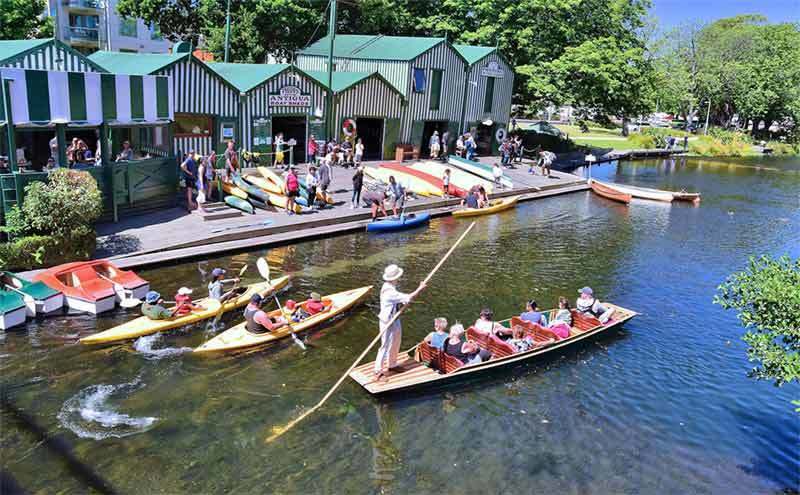 No experience is necessary - the kayaks are safe and easy to use and all trips are guided and full instruction is given. A truly a unique trip and one you will remember. Kayak's get you up close what's been hailed as an extraordinary work of art, only visible from boat or kayak. 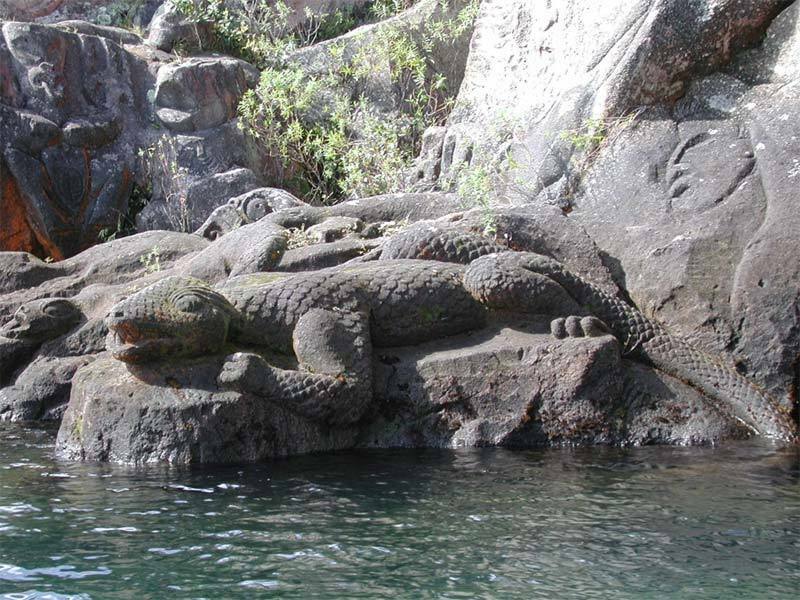 A Taniwha or water monster is beautifully carved into the rock. 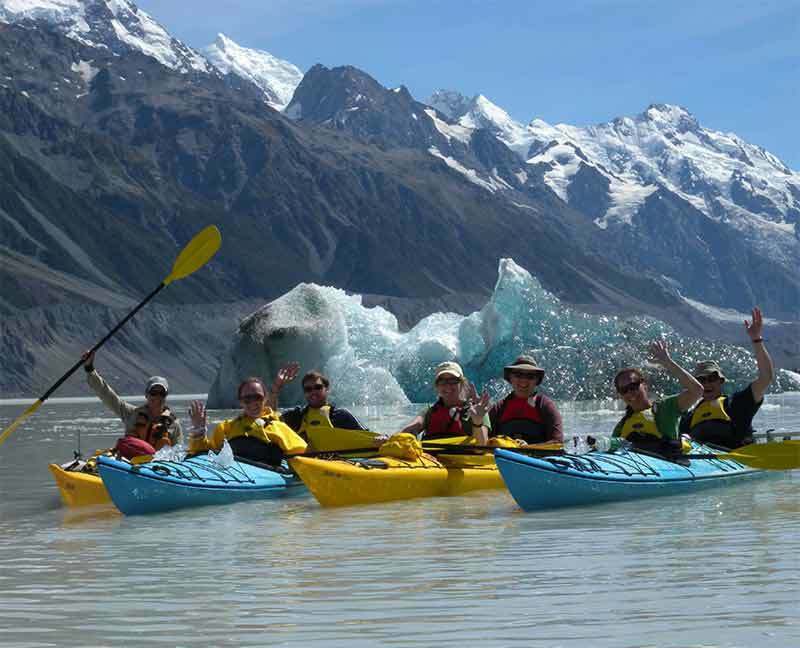 Cost: $75.00 including full instruction, top quality kayaks and gourmet refreshments. 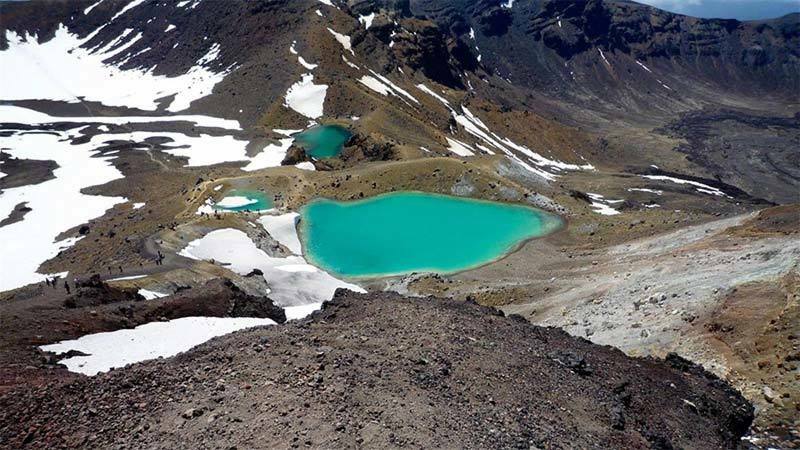 The Tongariro Alpine Crossing is widely regarded as the best one-day trek available in New Zealand and is ranked among the top ten single-day treks in the world. 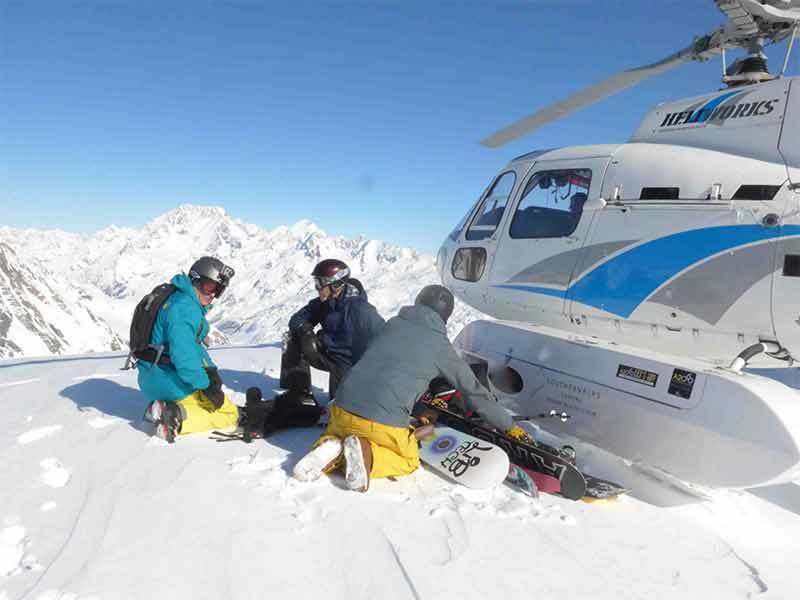 This will be a long day and a tiring one, so you'll need to be moderately fit. 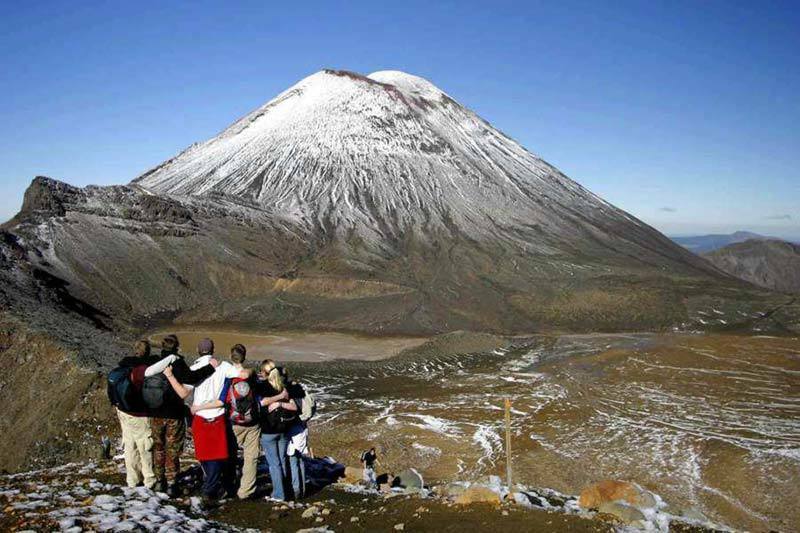 Ever present as you walk is the brooding Mount Ngauruhoe, used by filmmaker Peter Jackson as the Land of Mordor and 'Mt Doom' in his Lord of The Rings movies. Multi colored lakes are a highlight of the walk. 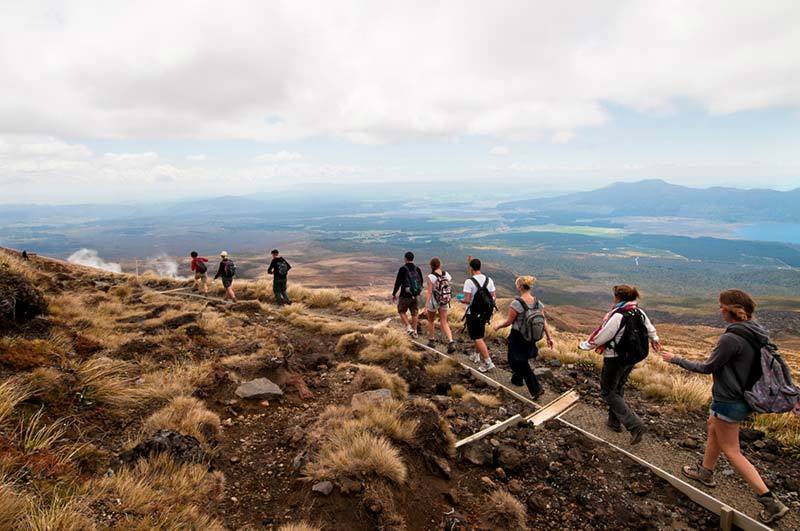 Walking on layers and layers of ancient lava flow, this is an unforgettable a one day trek. 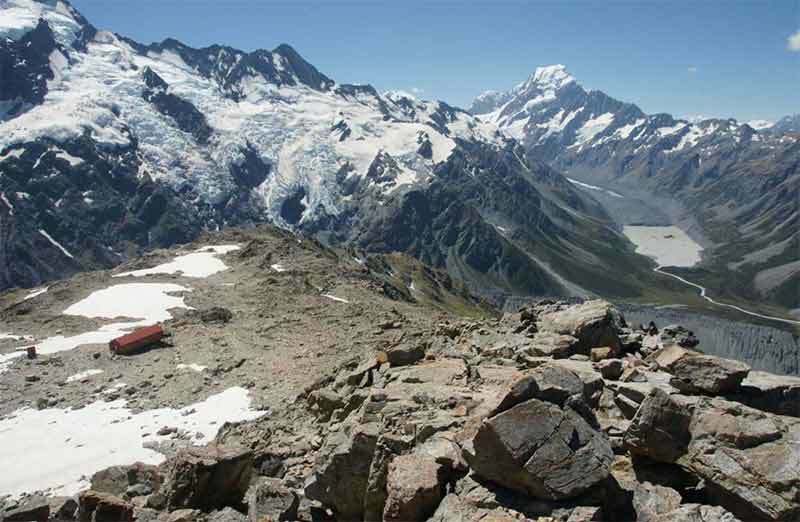 Well maintained pathways make access to the summit accessible to all. 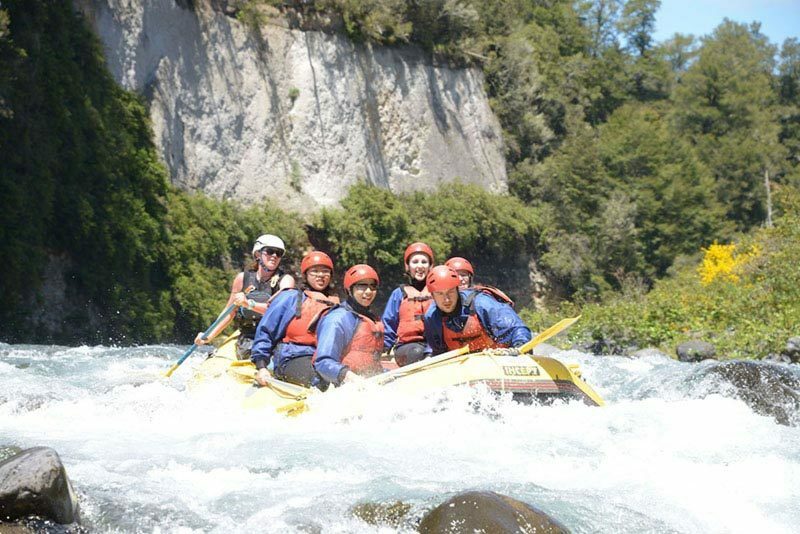 The is one of New Zealand's best river rafting experiences. 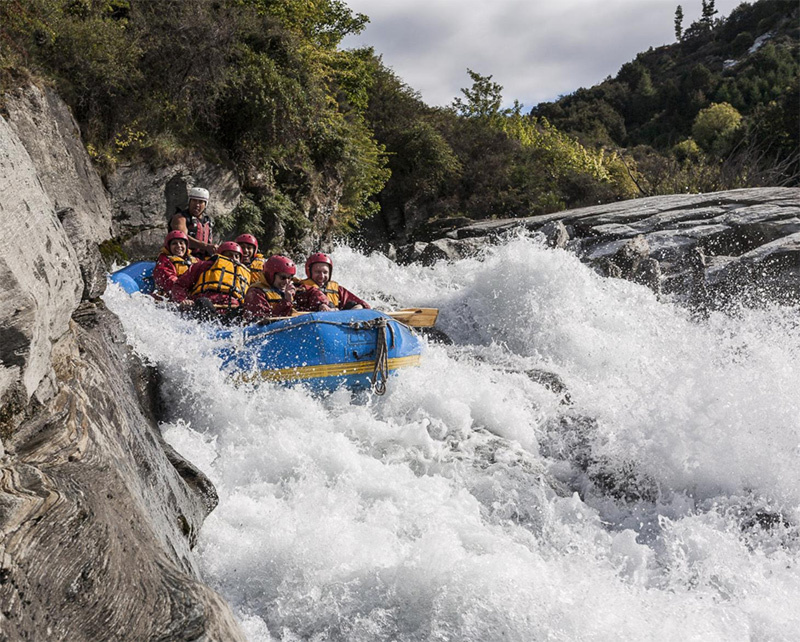 After an on-shore safety briefing and paddle instructions with an experienced guide you begin your white water rafting journey on grade 3 rapids – an ideal grade for experienced paddlers or first-time rafters. In 2.5 hours you navigate over 60 roller coaster rapids with your expert guide at the helm and treated to sights only accessed by raft. 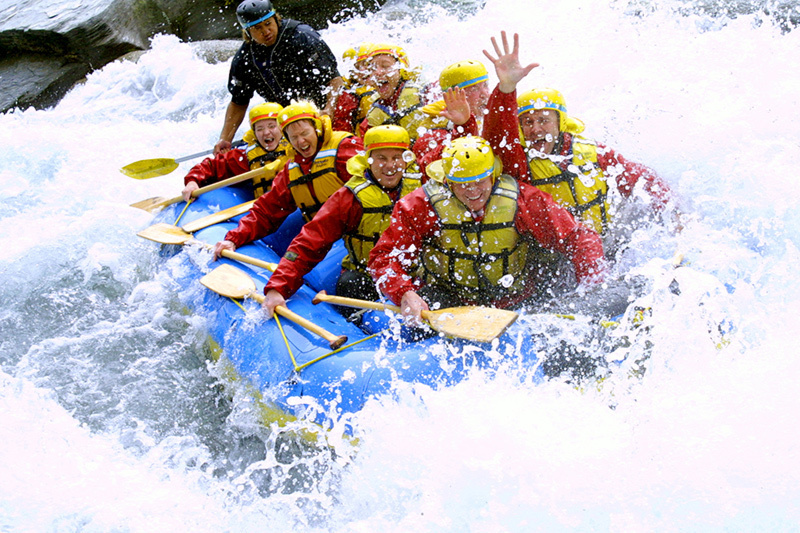 Navigating one of the 60 white water rapids. Taking in the scenery on gentler parts of the rafting journey. 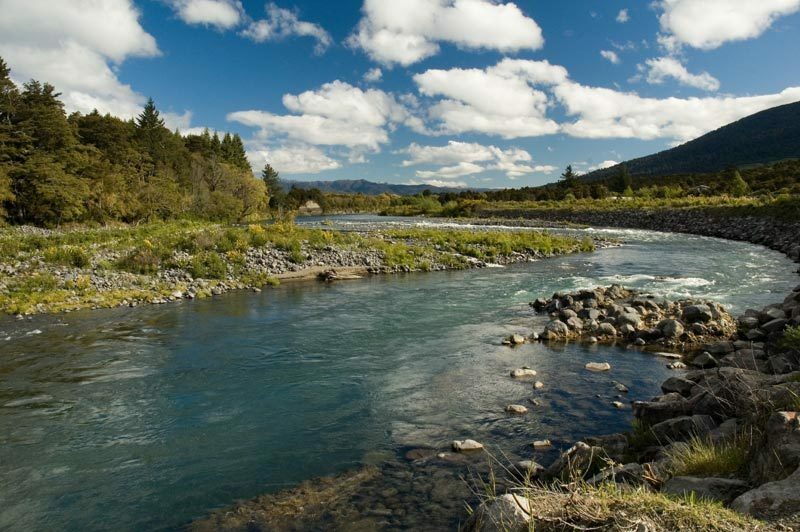 A calmer part of the stunning Tongariro River. 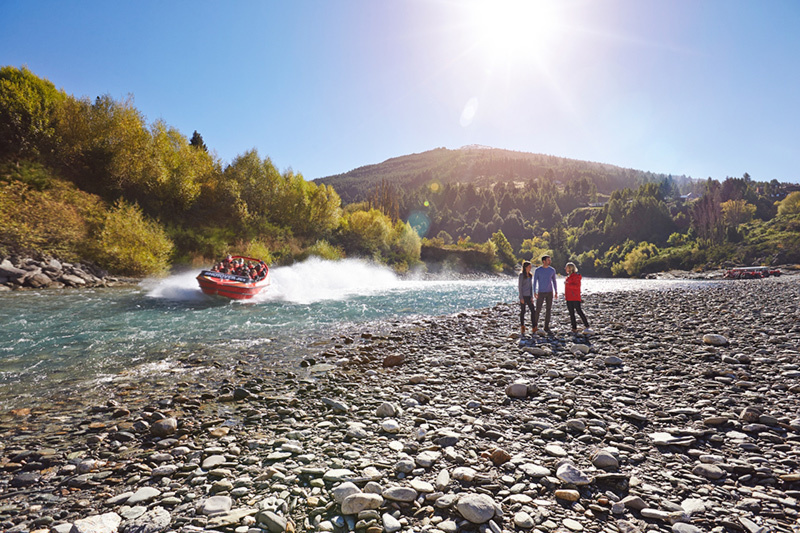 Easy to see why its one of New Zealand's best white water rafting experiences. 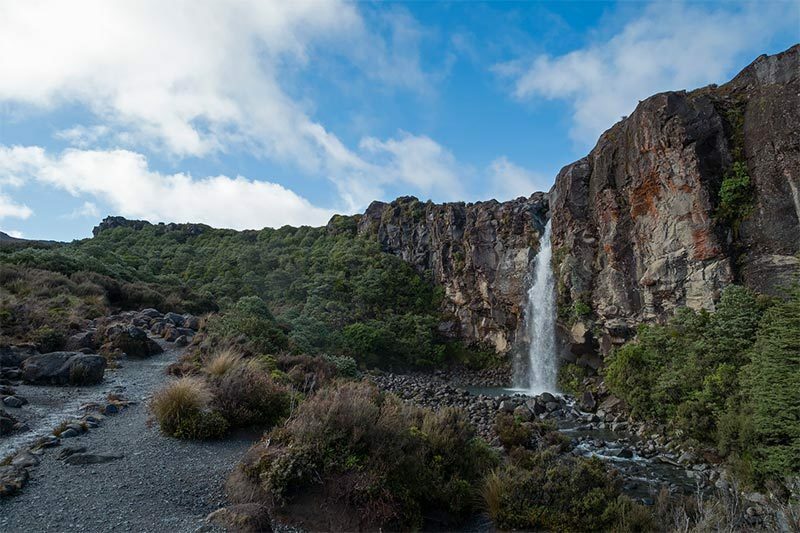 Taranaki Falls is a 20-minutes drive away from National Park Village where most of our New Zealand Vacations customers will stay. 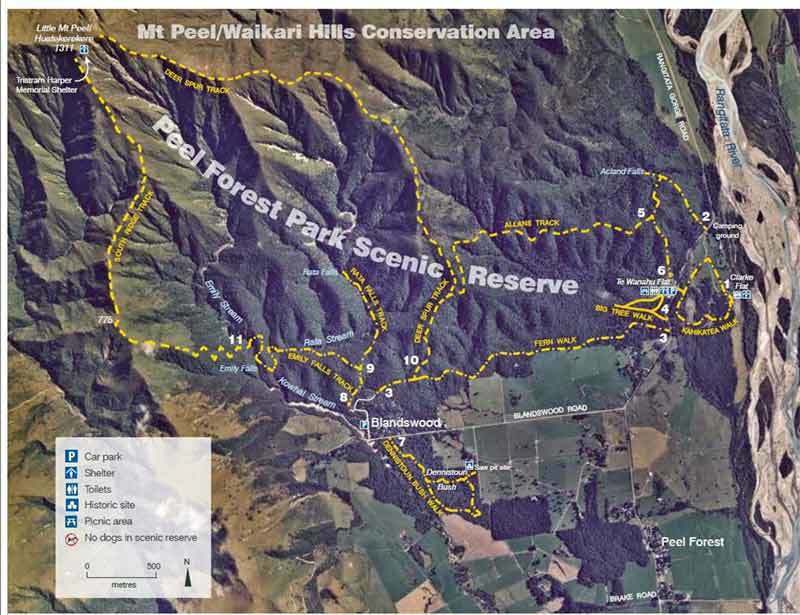 An easy 2 hours loop, the Taranaki Falls Walk leads to the waterfalls lookout, and then to the waterfall's base. The track is awesome! 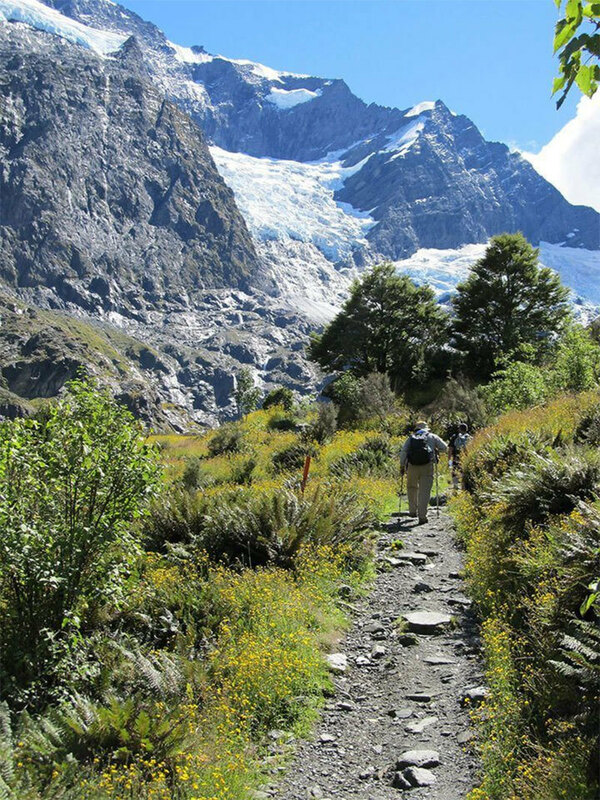 The first part of the track goes through the alpine grassland with amazing views of the volcanoes. The second part of the loop goes through the beech forest with some river crossings (all bridged) and small waterfalls. 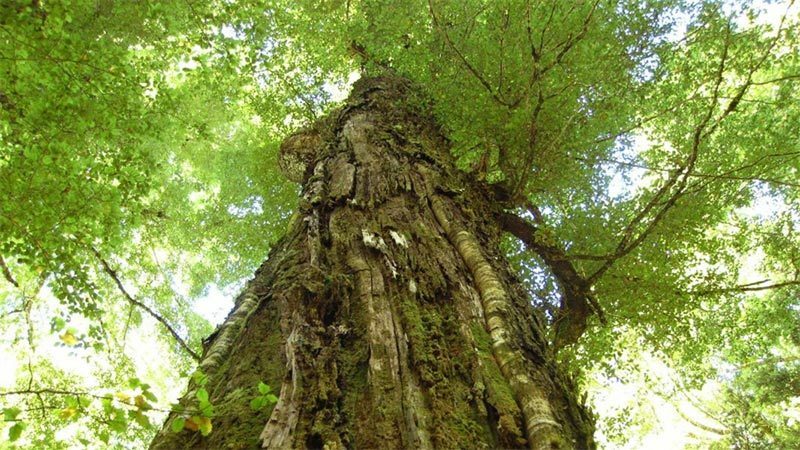 Views from within the beech forest. View from the base of the Taranaki waterfall. Waitere stream looking towards Mt Ruapehu from the bridge above Taranaki Falls. The views of the Falls from the top make the 2 hour loop is well worth the walk. 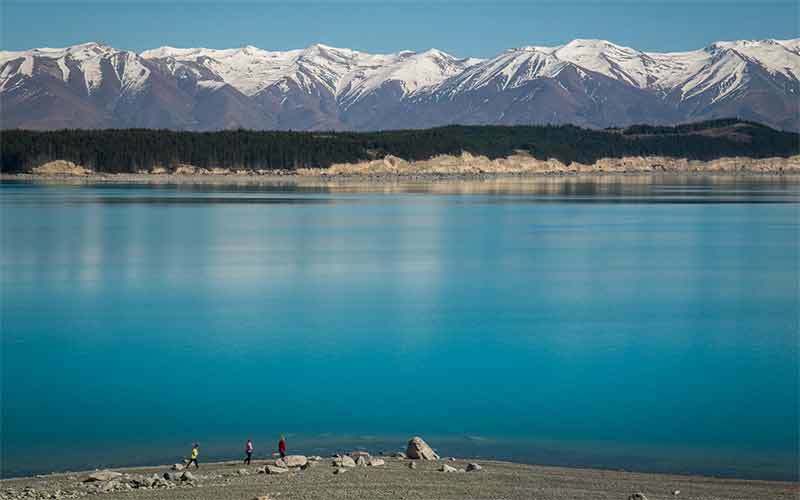 This beautiful lake is a 25 minute drive from the town of National Park where most of our New Zealand Vacations customers will stay. From the Rotopounamu car park it's just a 20 minute walk to the lake or 2 hours if you choose to walk around the 3 mile loop trail. 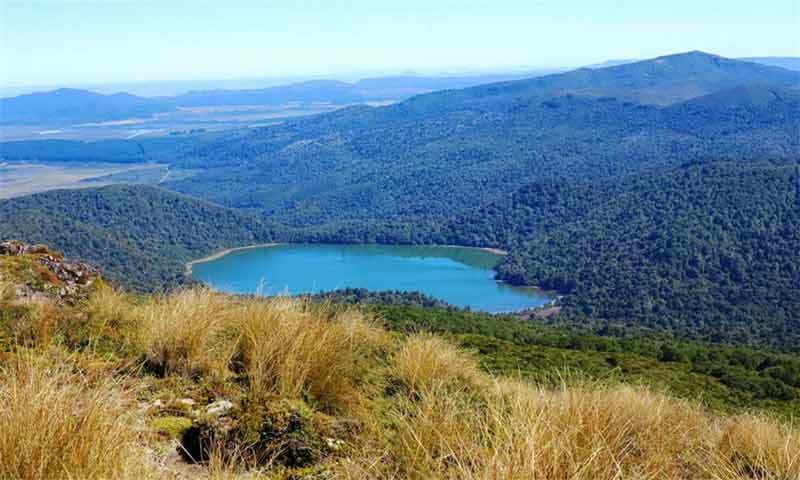 Beautiful Rotopounamu (the greenstone lake) is nestled into the side of Mt Pihanga and is a favorite place for birdwatchers, walkers and swimmers. View of the 'hidden' lake from the summit above. 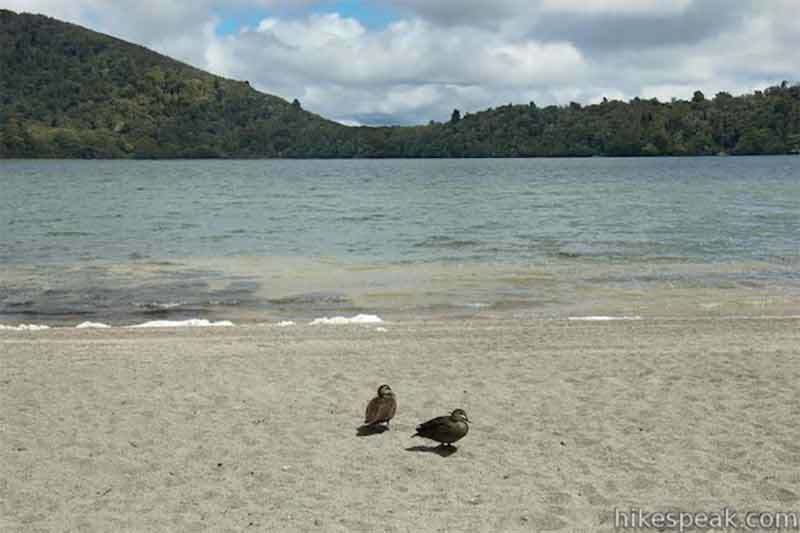 The lake attracts lots of bird life often seen on the beach or in the surrounding forest. The 3 mile loop trail around the lake has stunning forest scenery. 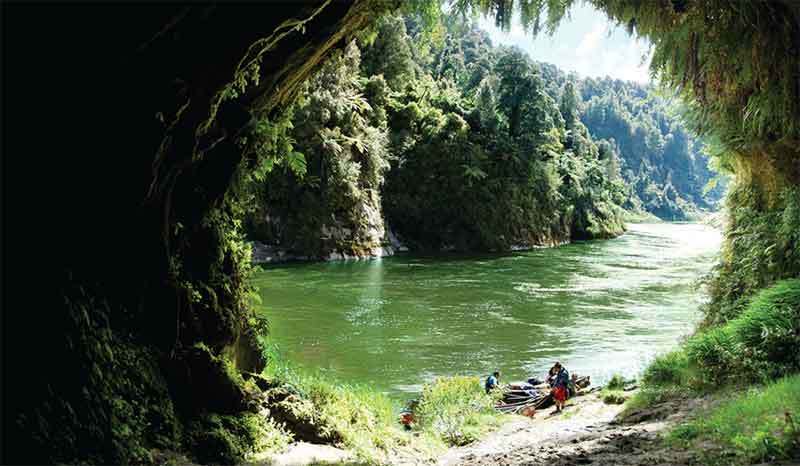 Just 25 minutes south of Tongariro is a side road to Pipiriki, the access point one of the most remote and beautiful rivers in New Zealand, The Whanganui River. You'll travel by jet boat exploring magnificent forest scenery, deep ravines covered in mosses and an array of native ferns. The ravines and river banks make for stunning scenery. 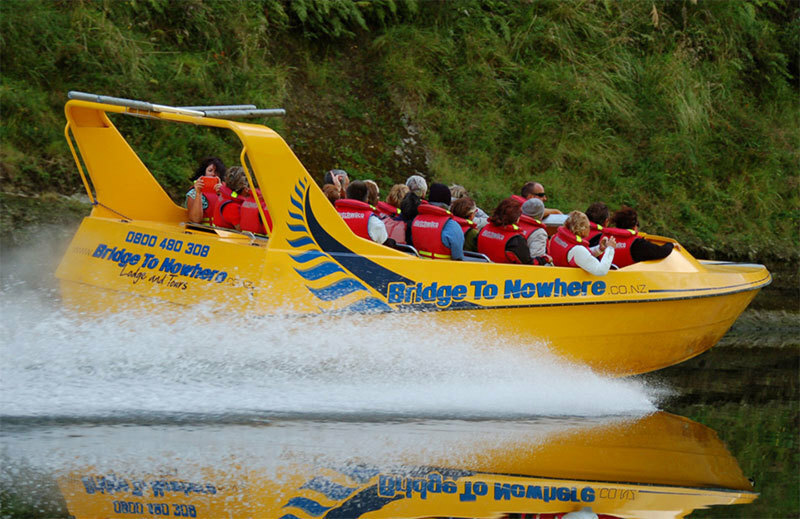 Travelling down the river on a jet boat. The stunning scenery with moss lining the riverbanks. This option will require an extra day to be added to your vacation, but it's a choice you will never regret. 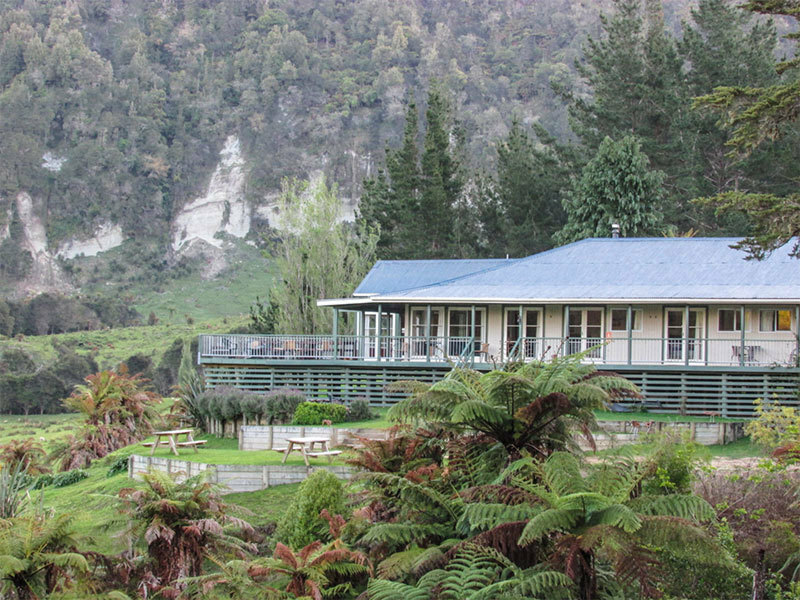 Stay overnight at The Bridge to Nowhere Lodge deep in the Whanganui National Park wilderness, perched high above the river and accessible only by jet boat, canoe, by foot or helicopter. 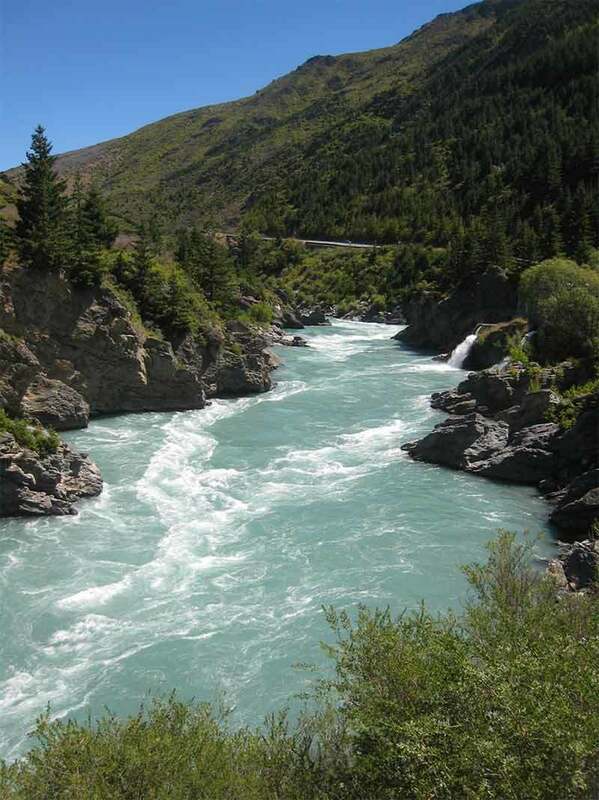 The canoe journey downstream, back to Pipiriki is simply breathtaking. 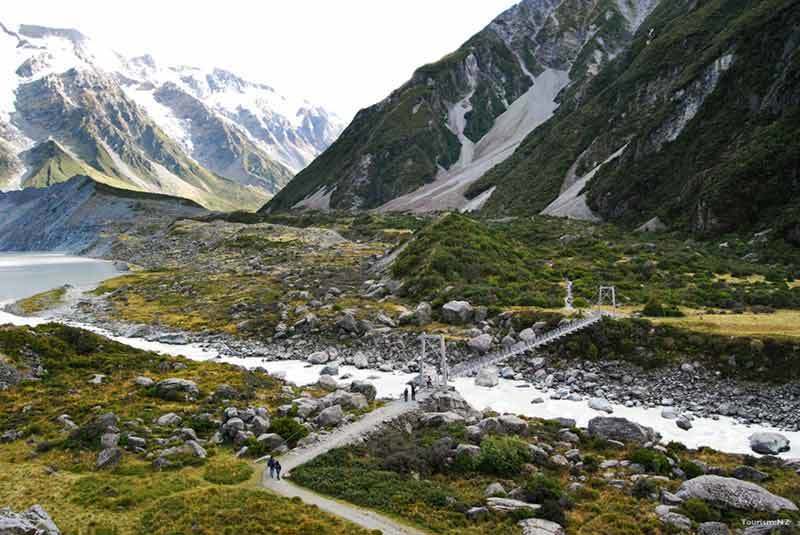 The Bridge to Nowhere Lodge with its gorgeous wild surroundings. 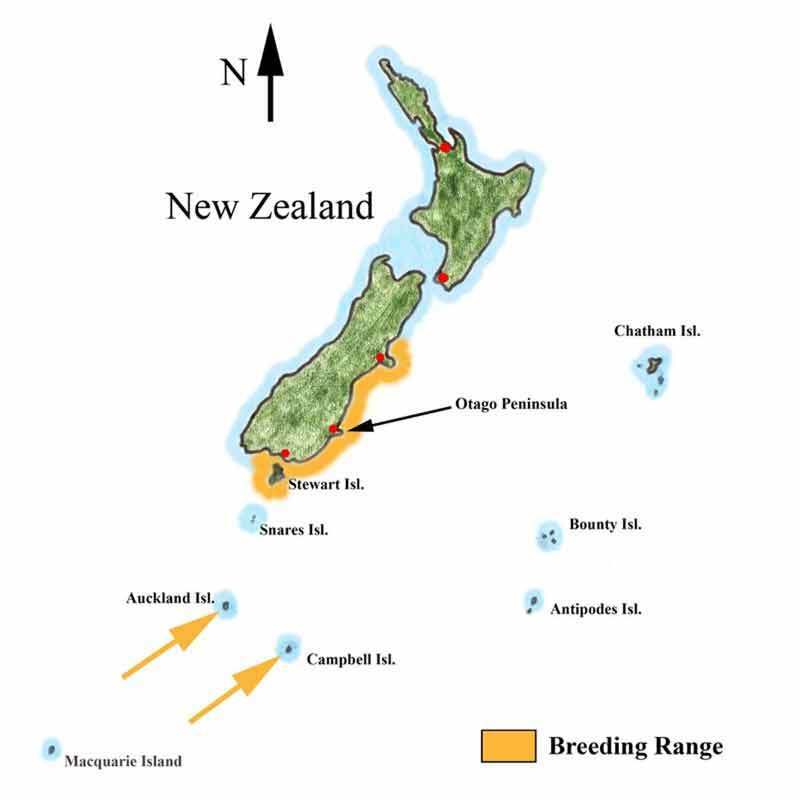 Map of the showing the Lodge within Whanganui National Park. 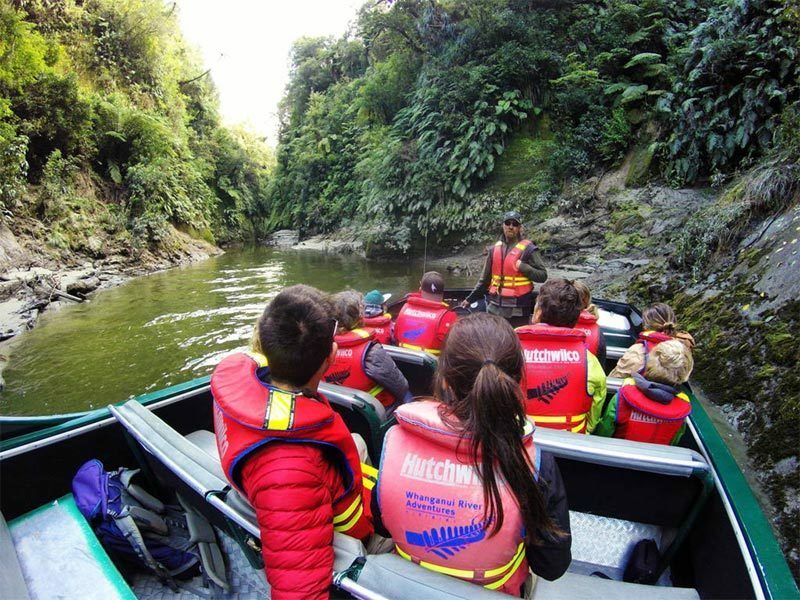 Canoeing down the Whanganui river. Jet boating to the lodge from Pipiriki. 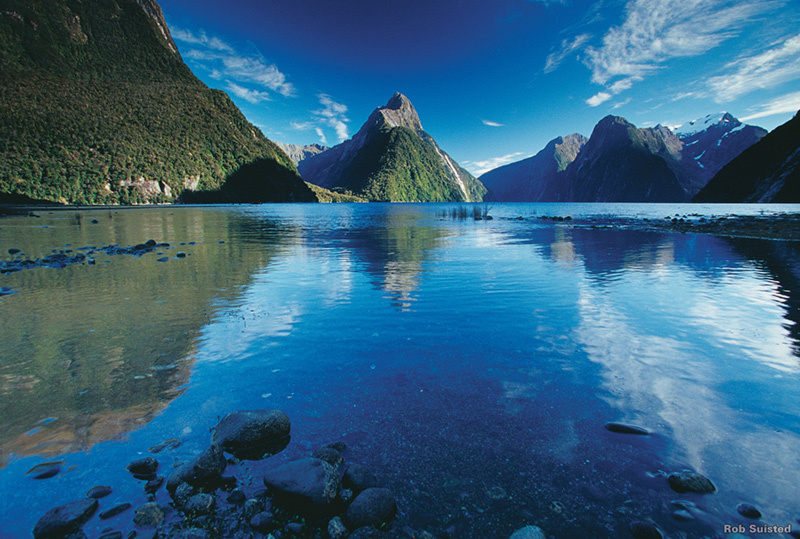 Cost: From $255.00 - includes; dinner, accommodation, breakfast, tour and jet boat transfer between the Lodge and Pipiriki. 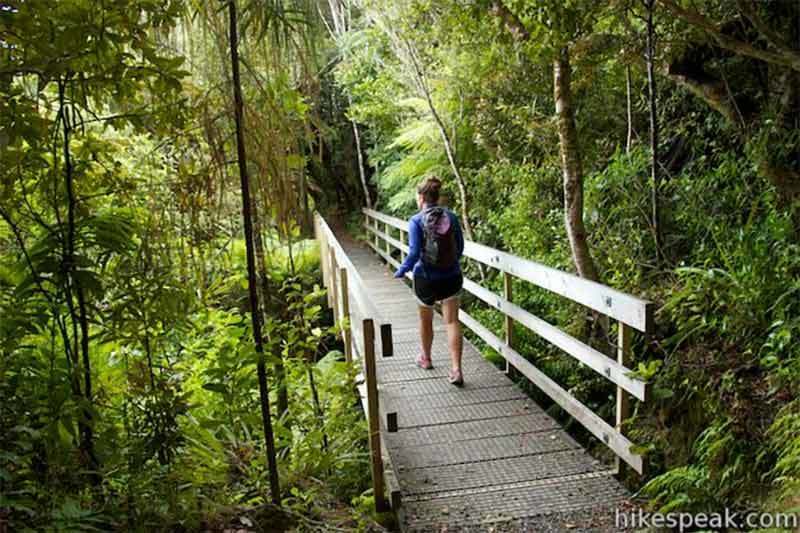 At the town of Waikenae, an hour and a half south of Whanganui is a pleasant forest walk, situated at the nearby Hemi Matenga Scenic Reserve. 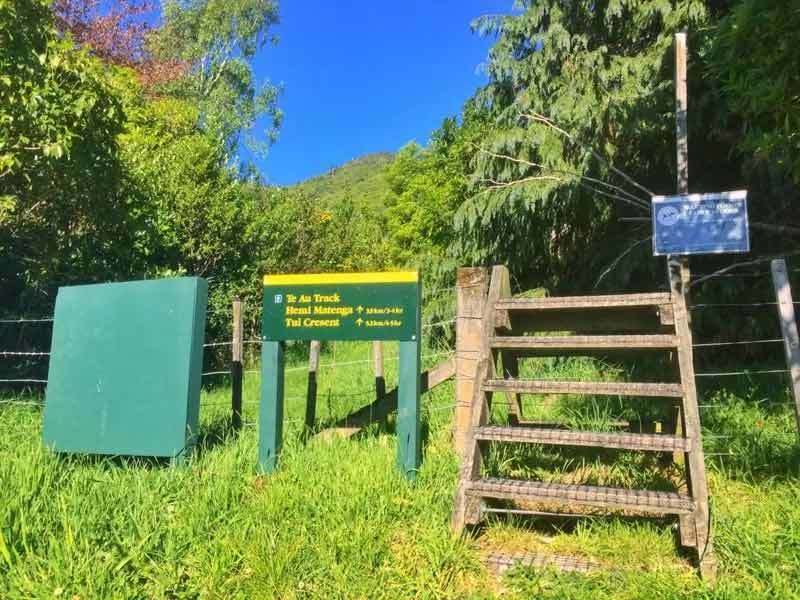 The shortest forest trail takes just 30 minutes, but if you have time there's also an easy, well signposted walk to the summit at 1300 feet that will take you an extra hour. 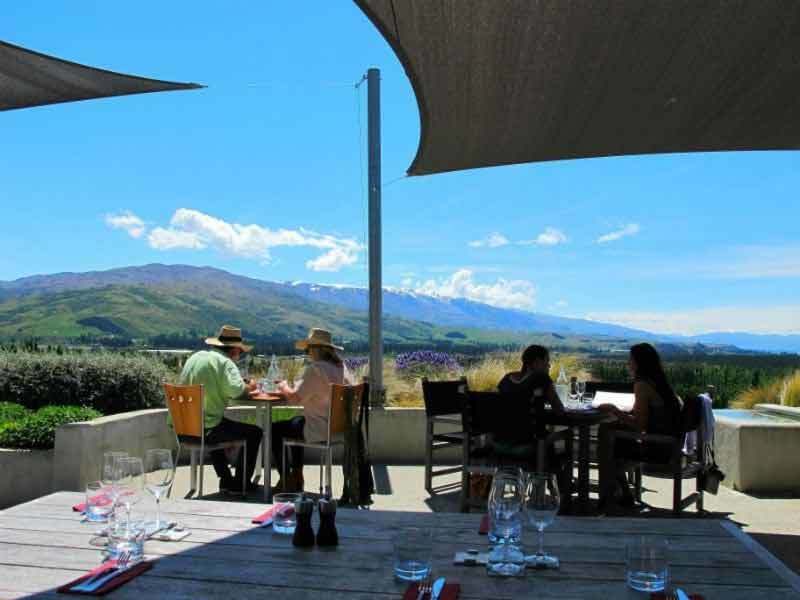 From here there are excellent views of the surrounding countryside and out to nearby Kapiti Island. To learn more, click here. 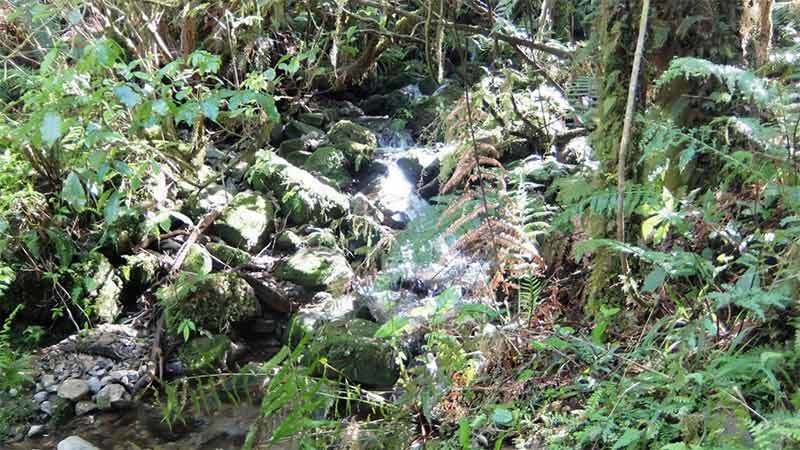 A stream coming down the summit at Hemi Matenga Scenic Reserve. 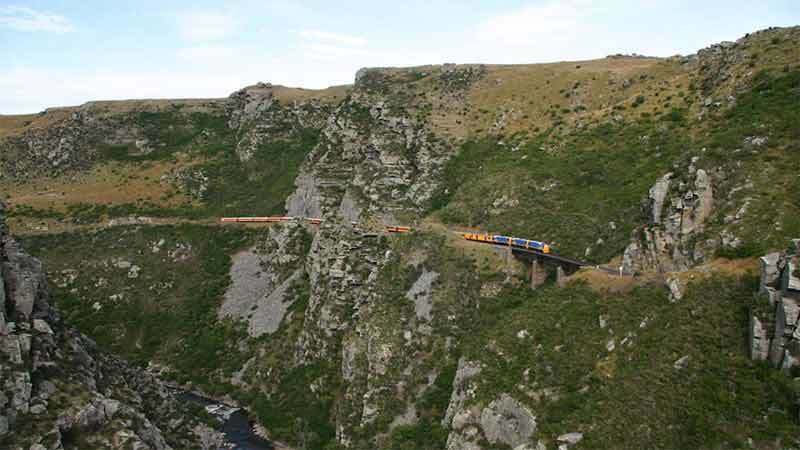 The different tracks available around the Scenic Reserve. View of Kapiti Island and Waikenae from the summit. New Zealand Vacations director Jerry Bridge also owns the company "What To Do in Wellington" and Jerry says that as long as he's in town (which he usually is) he will personally provide all New Zealand Vacations customers with an exclusive and free personalized tour of Wellington, visiting the main points of interest and some "off the beaten path" places as well. 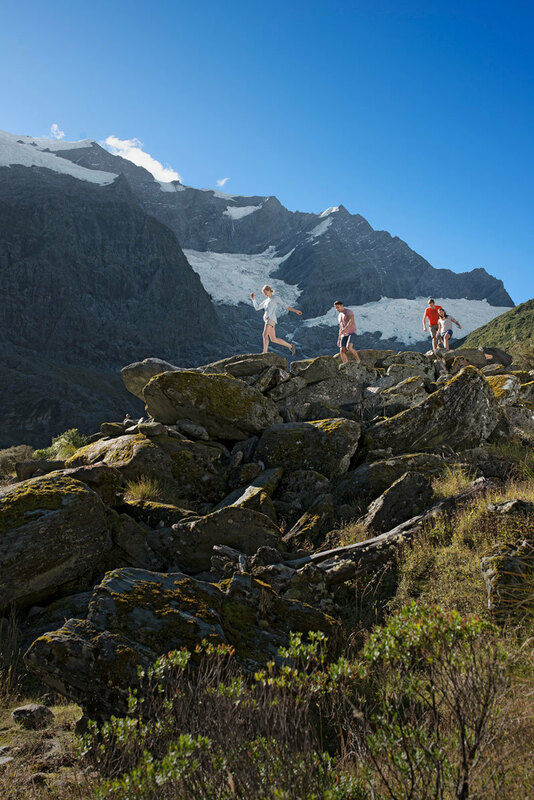 All you'll be responsible for are entry fees at the places you choose to visit. 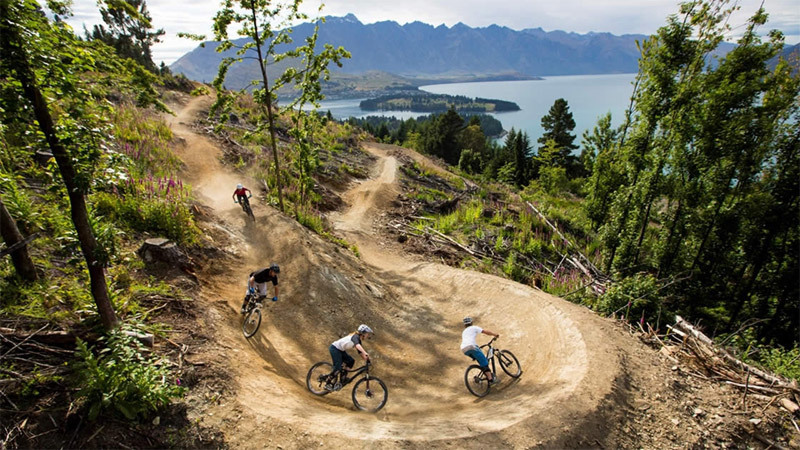 Thank's Jerry and your "What To Do in Wellington" team. 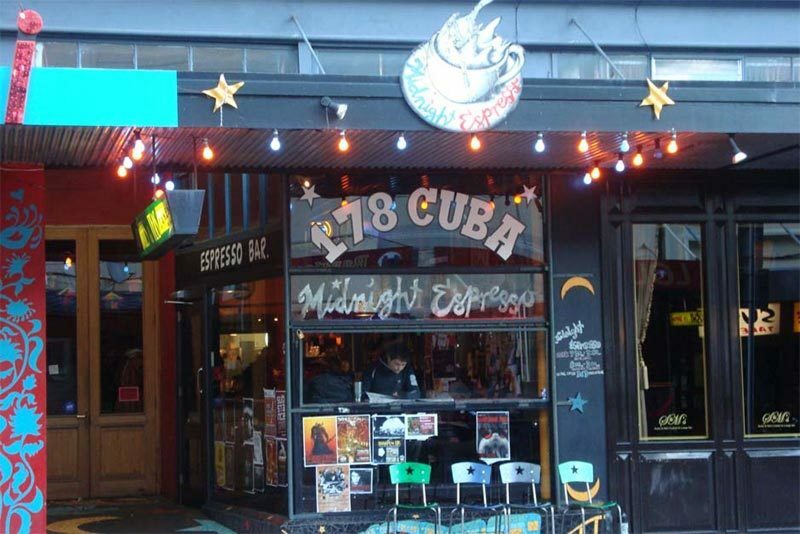 Wellington's famous inner city slice of bohemia, Cuba Street. 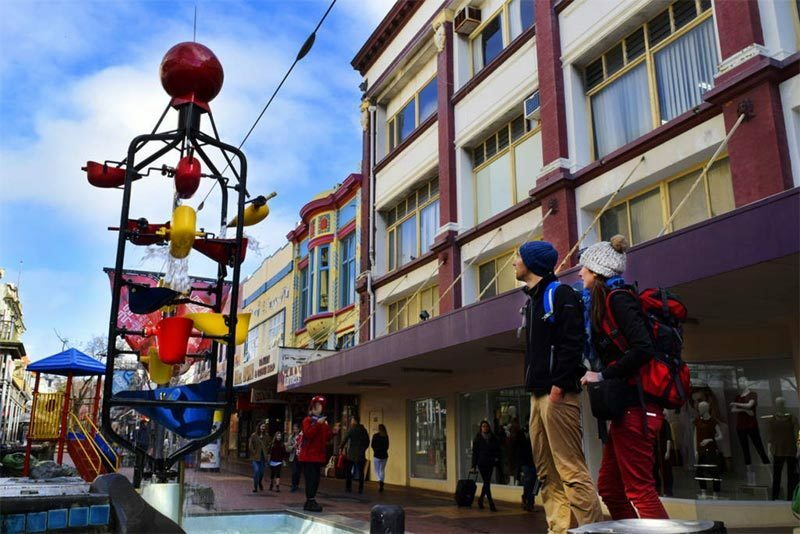 Cuba Street - shopping, dining and street performers. And home to some quirky cafes serving excellent coffee. 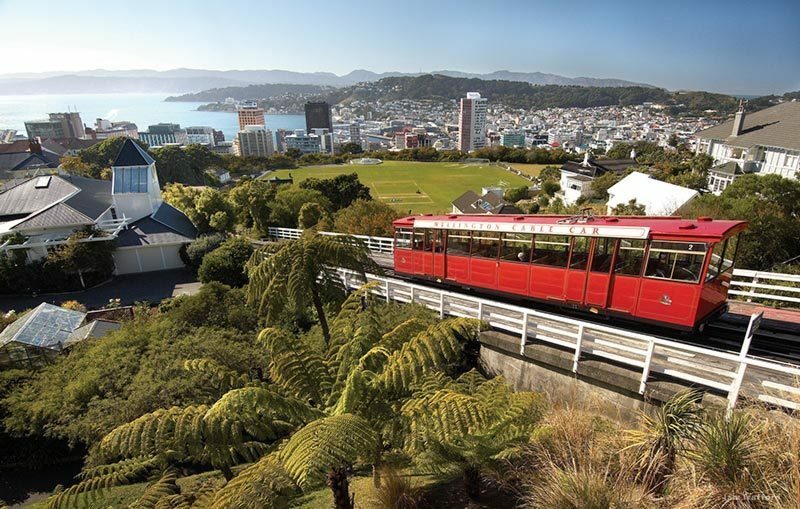 The Wellington Cable Car runs from downtown and offers exceptional views of the city. Wellington's "solace of the wind' statue looks out over the harbor. 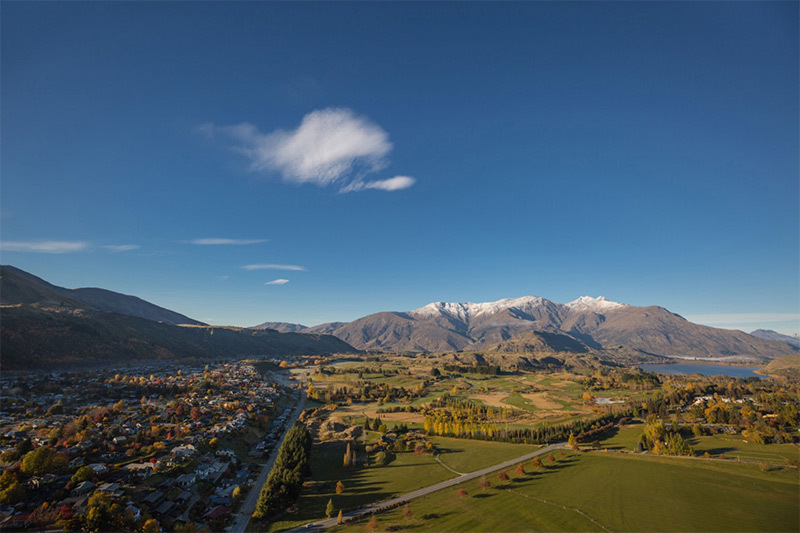 Easily accessible from the city, Mount Victoria lookout offers 360 degree scenic views. 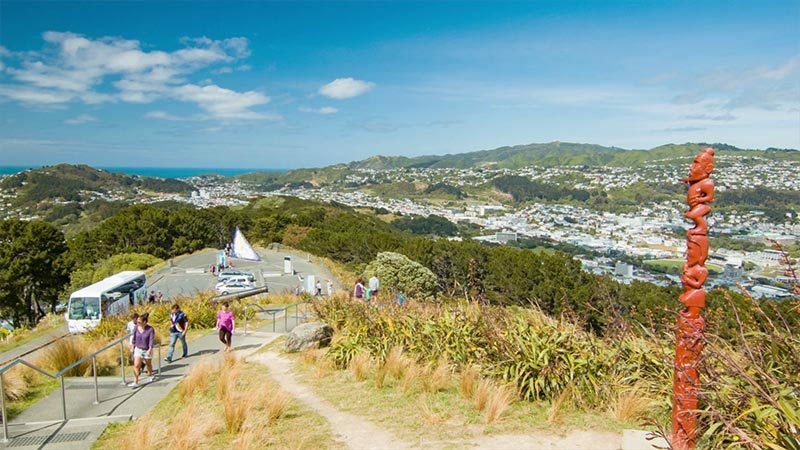 A stunning view of Wellington city seen from Mount Victoria. Cost: Free, as long as Jerry is in town when you visit. Te Papa is a state of the art modern museum, bringing together under one roof both the Maori & European history of New Zealand. It is New Zealand's national museum, the largest cultural project in New Zealand's history, completed in 1998 at a cost of $317 million. 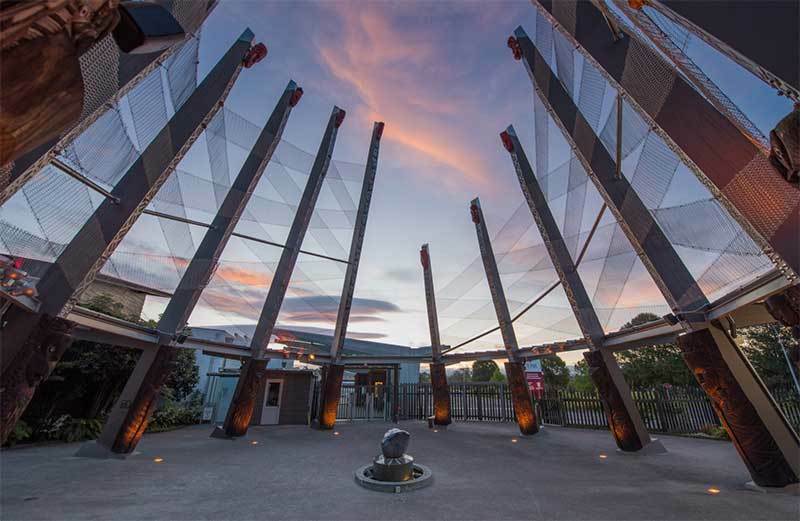 At the museum, you will encounter Maori, New Zealand's indigenous people, through authentic portrayals of their traditions and living culture, including an opportunity to visit a unique Marae (communal meeting place). 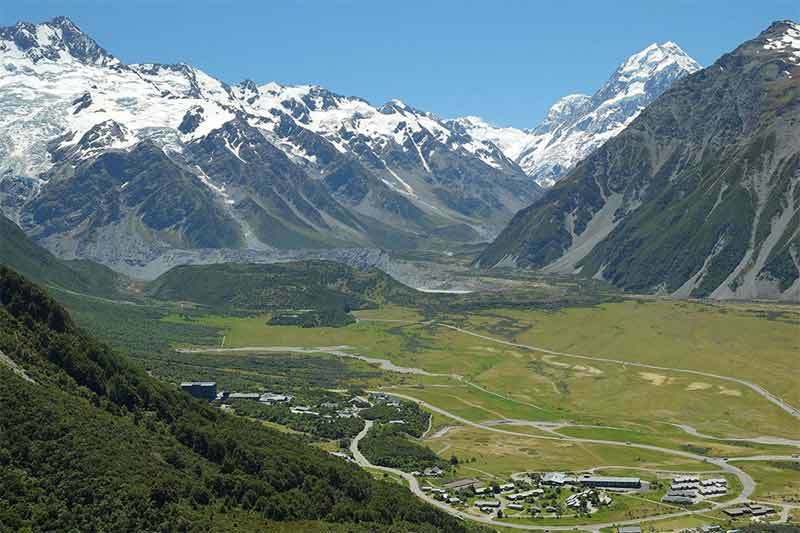 Then there's the geology, the geography and other exhibitions that will give you interesting insights to New Zealand. The best introduction to Te Papa is to take a 90 minute guided tour that explains Maori culture and treasures, art and New Zealand's colonial history. 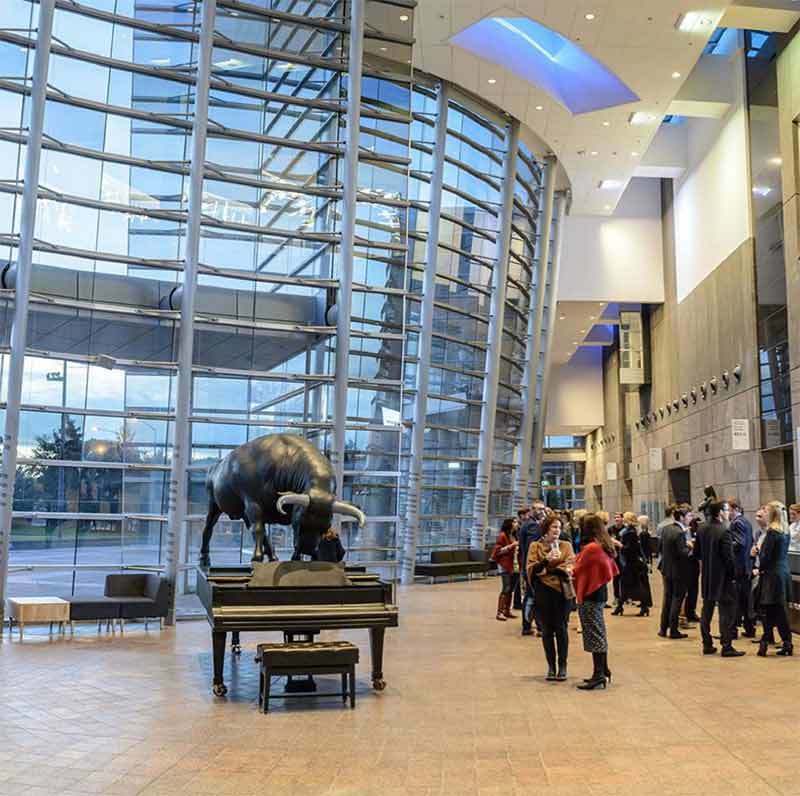 Opened in 1998 and designed by local architect Ivan Mercep of Jasmax Architects. 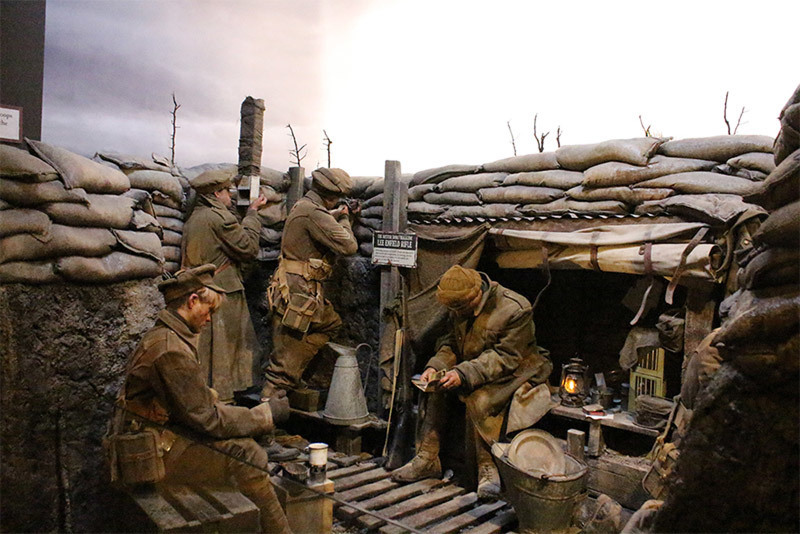 'The Great War' exhibition was created by Te Papa and Peter Jackson's Weta workshop. 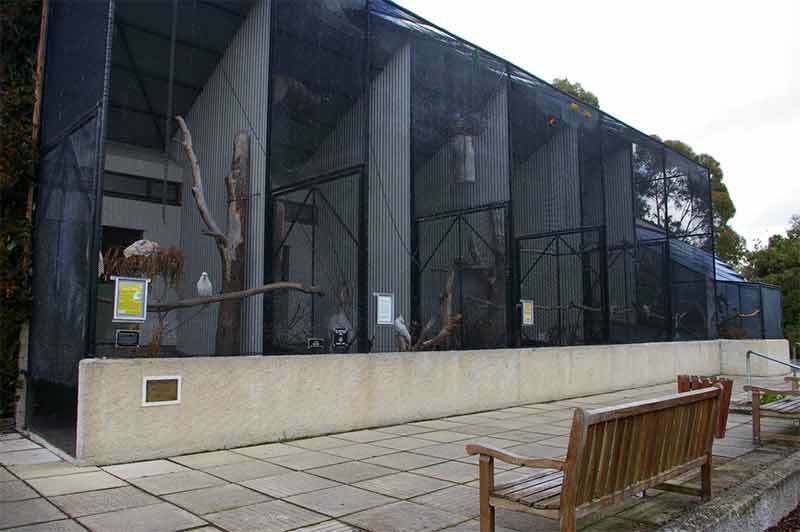 Te Papa displays a large collection of native plants, sea creatures, birds and native animals. 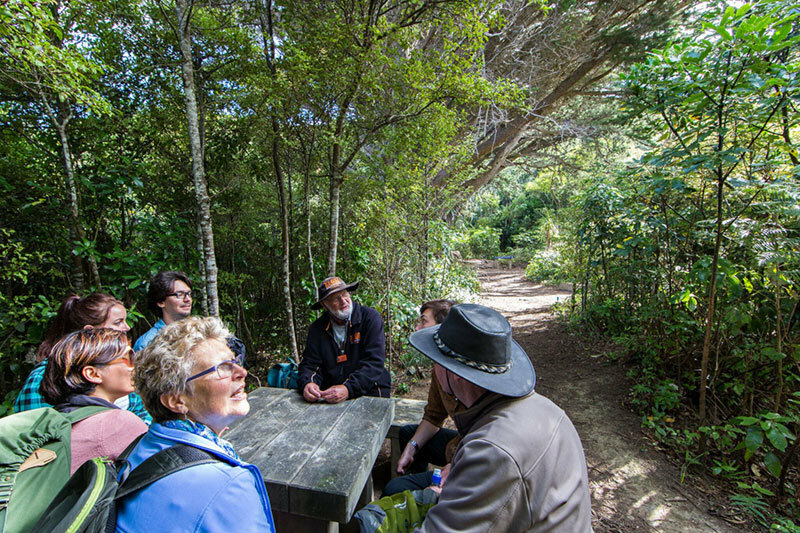 An authentic and inclusive marae (Maori communal meeting place) is found on level 4. 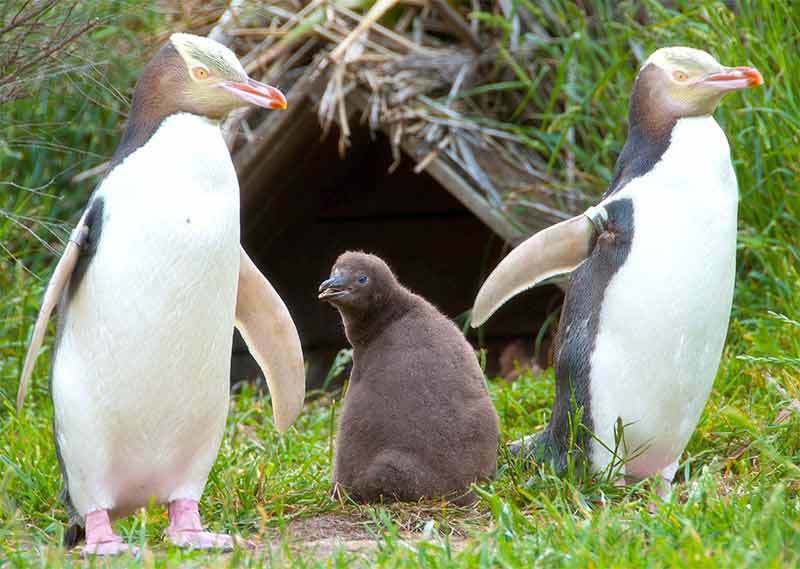 The Zealandia Wildlife Sanctuary is an outstanding example of efforts to save New Zealand most endangered native birds and animals. 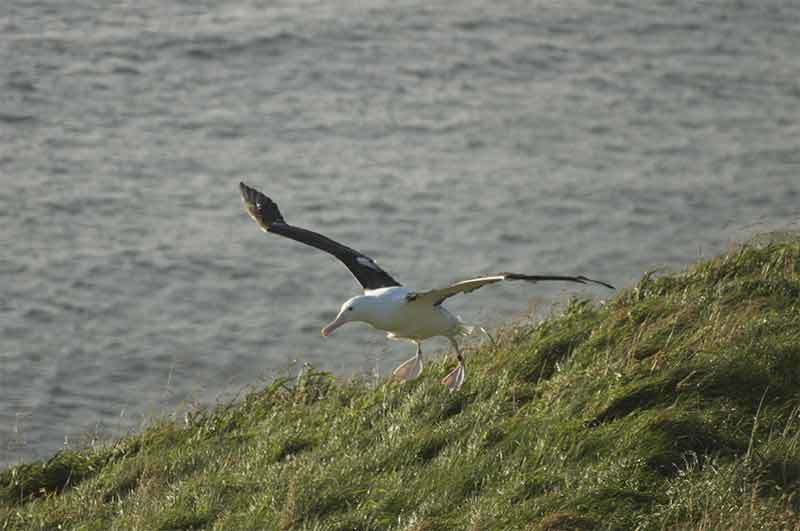 We suggest a visit in the late afternoon to hear the dusk chorus of the birds or consider a night tour for a special experience. 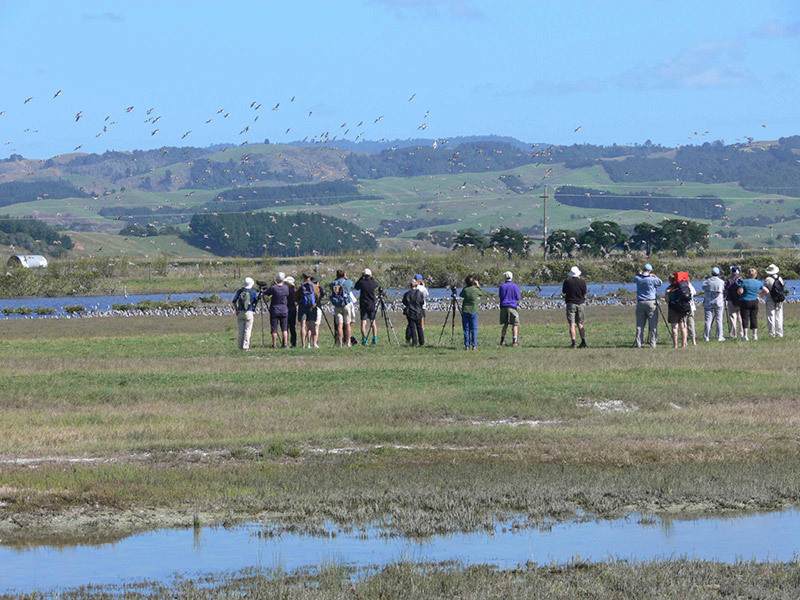 This will be the best opportunity on your itinerary to see such a wide variety of beautiful native birds and other native wildlife. 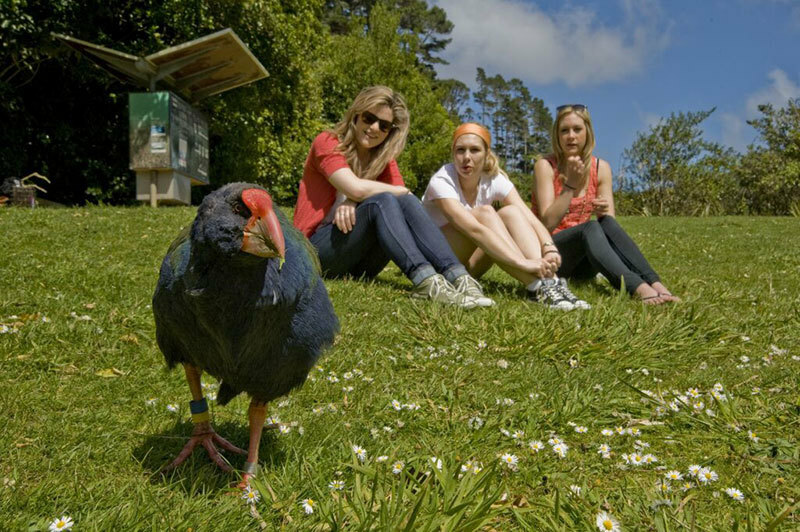 Pukeko, one of NZ's most interesting looking native birds, can be found roaming freely around the reserve. 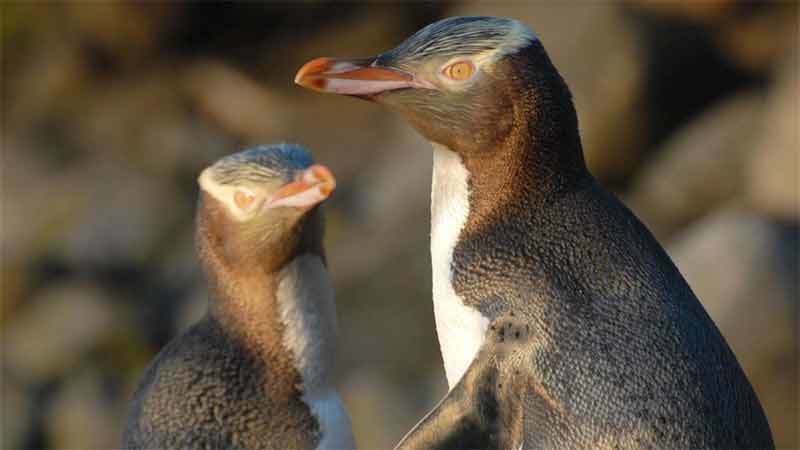 Explore the sanctuary by torchlight experiencing rare and endangered species that only appear at night. 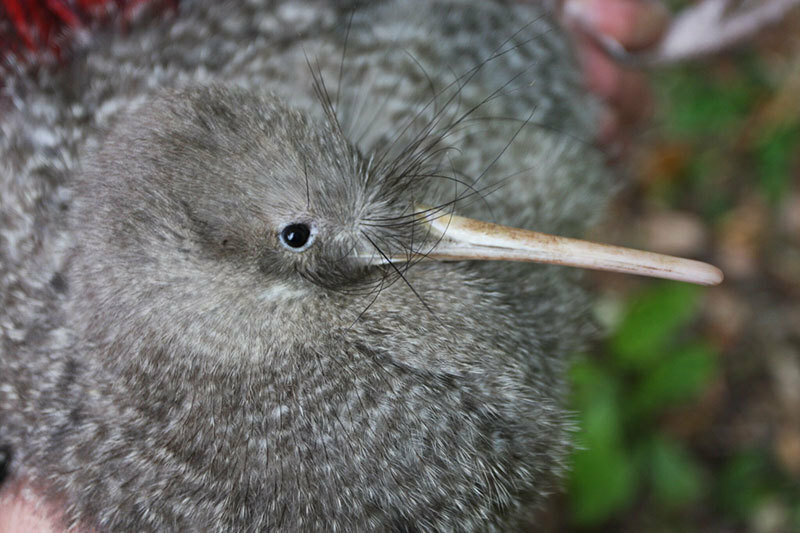 On a night tour your group might see some of the 130 little spotted kiwi who call Zealandia their home. 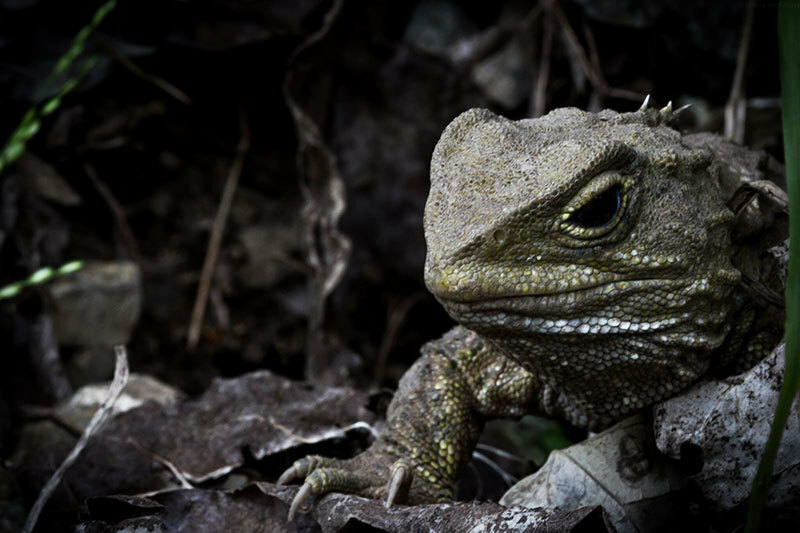 Tuatara, the rare and unique NZ native, is one of Zealandia's most popular inhabitants. 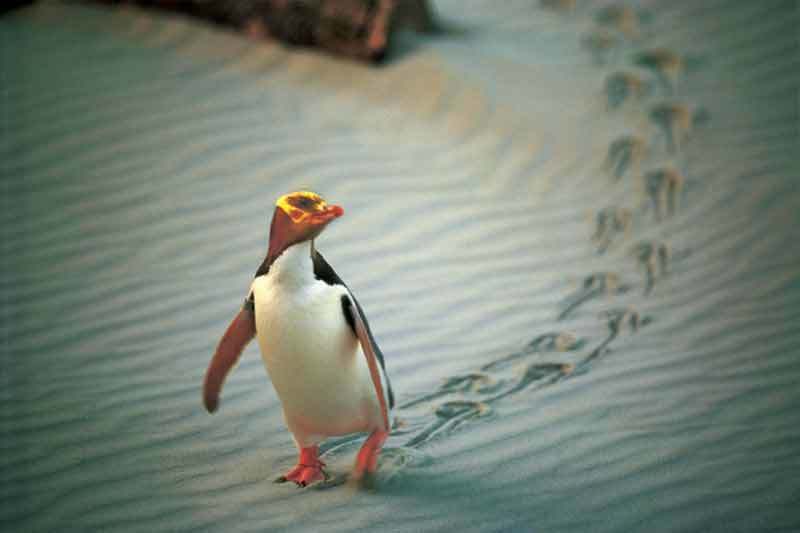 Your guides use their knowledge of birdsong, habitats and flora to find track down the unique birds & animals. 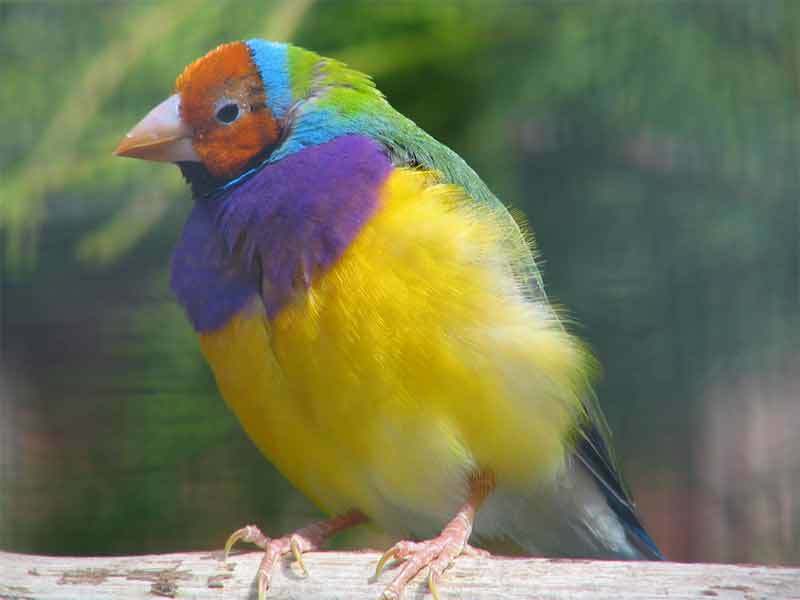 Kakariki or New Zealand parakeets are easily found due to their vibrant colors. 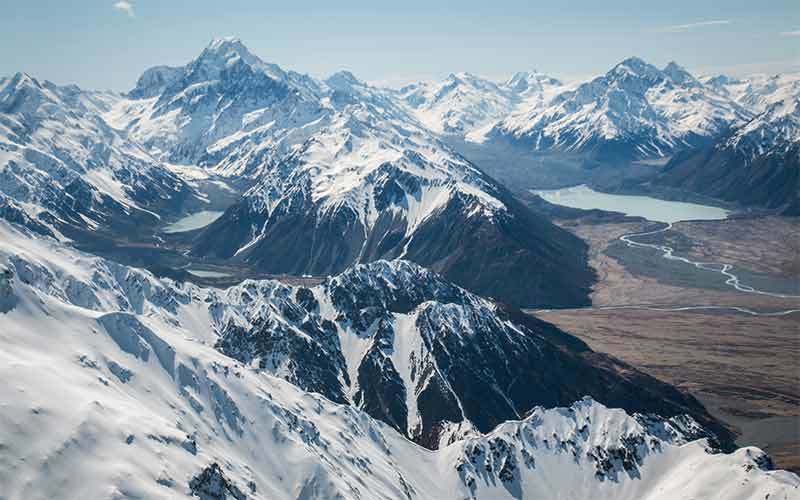 Although famous for their award winning work on movies like Lord of the Rings and The Hobbit trilogy, the Weta Workshop has a creative portfolio that spans a large number of other blockbuster movies and gaming properties. These include The Amazing Spider-Man 2, Godzilla and DOTA2. 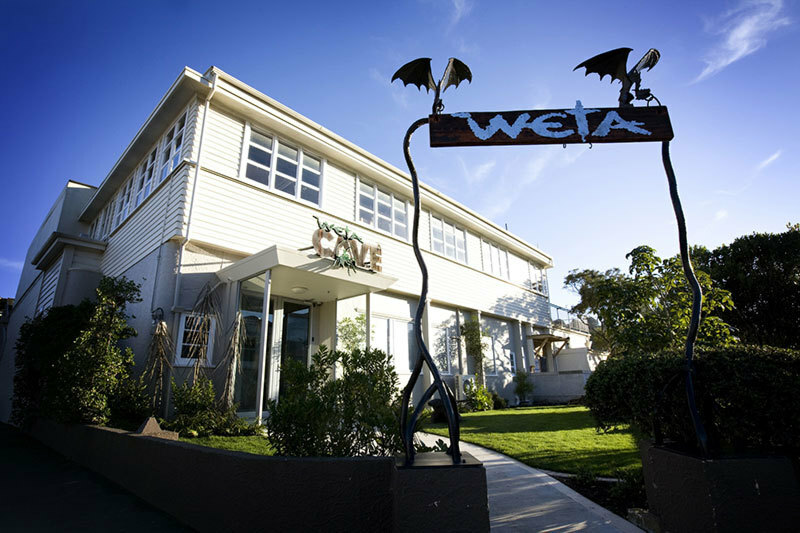 Anyone with even the slightest interest in movies and gaming should visit this fantastic 65,000 square foot multi–disciplinary facility..
Weta Workshop is a mini museum and small shop celebrating some very big movies. Taking photos is prohibited within the workshop but the foyer has plenty of incredible sculptures on display. 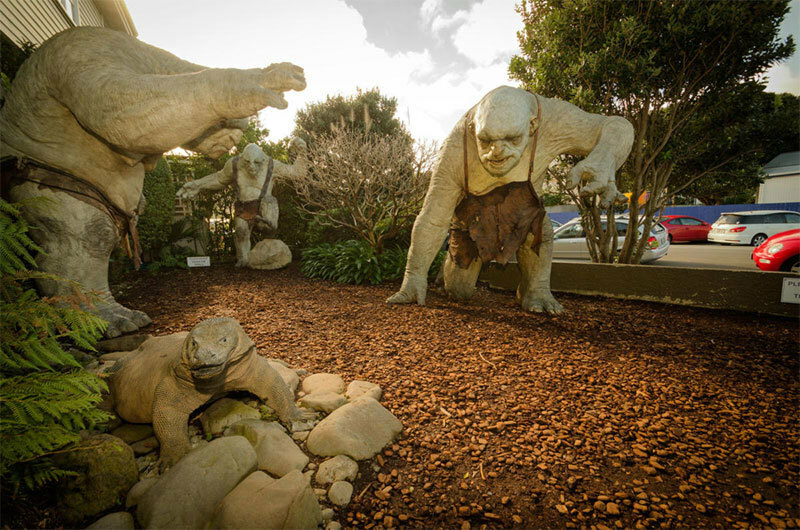 Waiting to greet you outside, the amazing stone trolls will make the perfect selfie for any Hobbit fan. 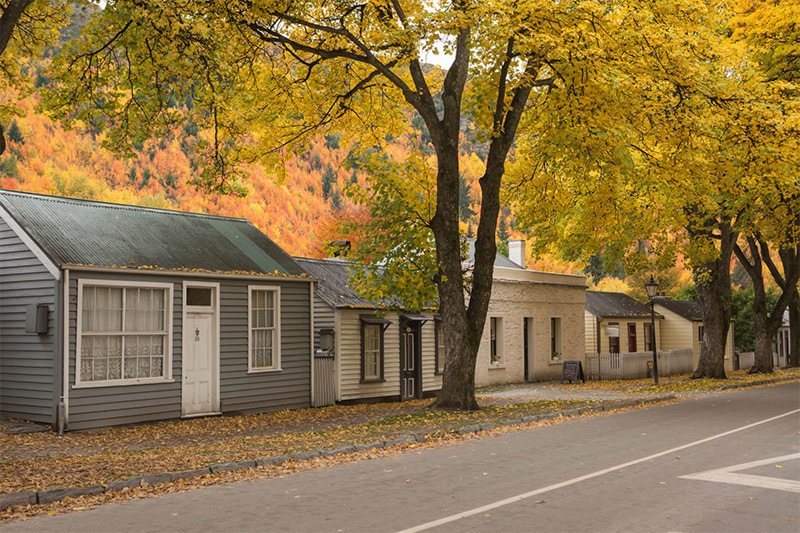 The town of Cromwell is a favorite stopping off point for visitors before they cross the Lindis Pass. 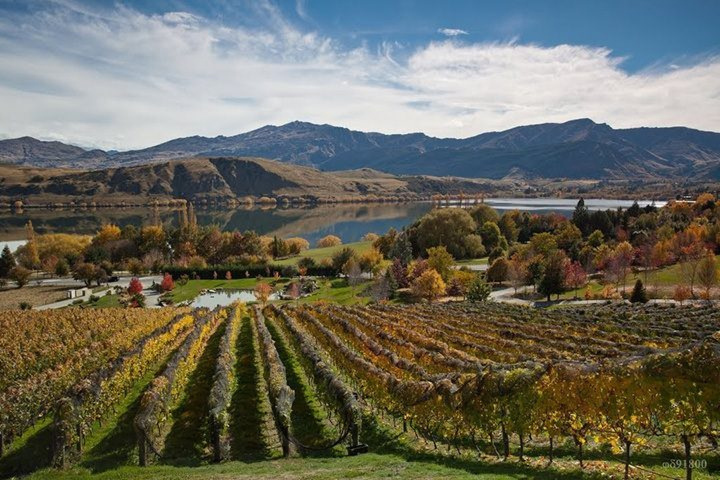 The construction of the Clyde Dam in the early 1990s saw the old town centre drowned and today there's a replica of the old town while the adjacent 'new' Cromwell has become a thriving centre for the local wine and fruit industries. 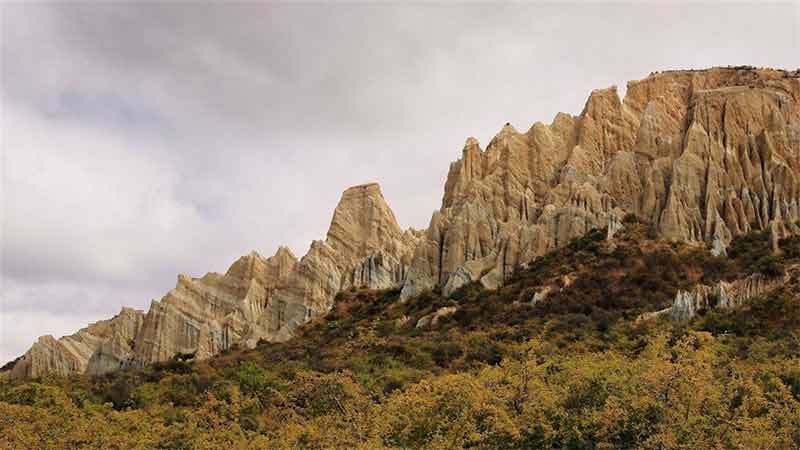 The scenic drive through Lindis Pass is approximately 45 miles in length and takes less than an hour to traverse. The road is hilly and winding, reaching a height of over 3,000 feet. 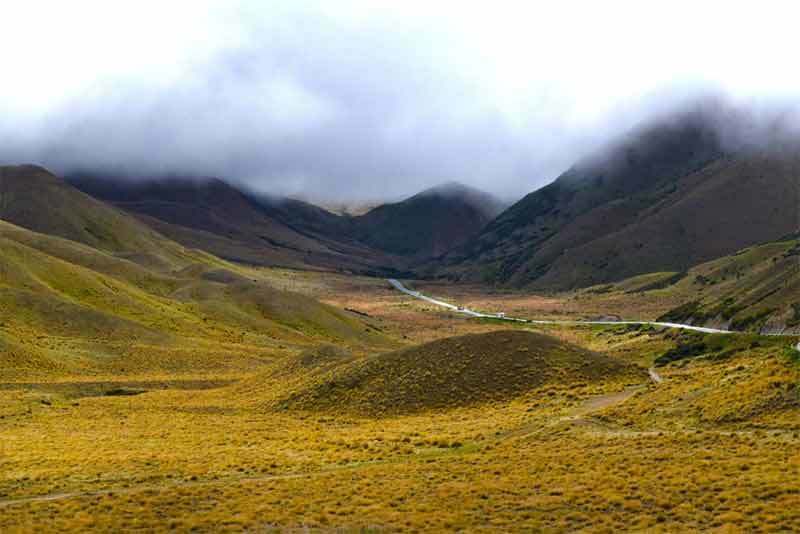 The landscape is empty, just tussock grasslands as far as the eye can see and this gives it a unique and rugged beauty all of its own. Best time: Road gets closed at times during winter. 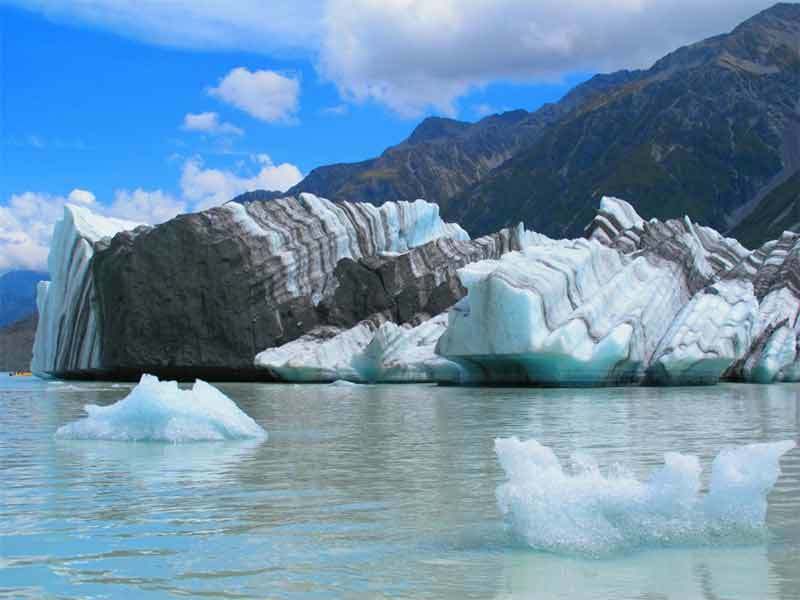 Visit New Zealand's Tasman Glacier terminal lake for a fascinating glacial encounter. 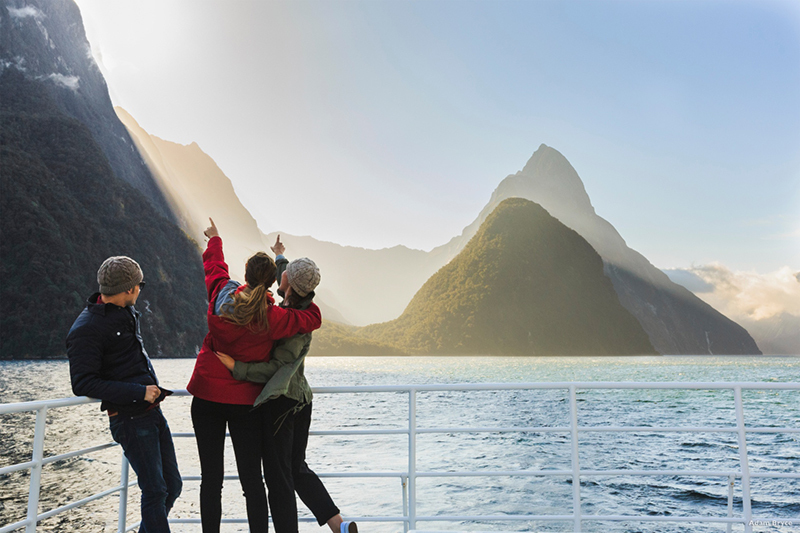 Cruise the rapidly growing terminal lake taking in spectacular mountain views and scenery. 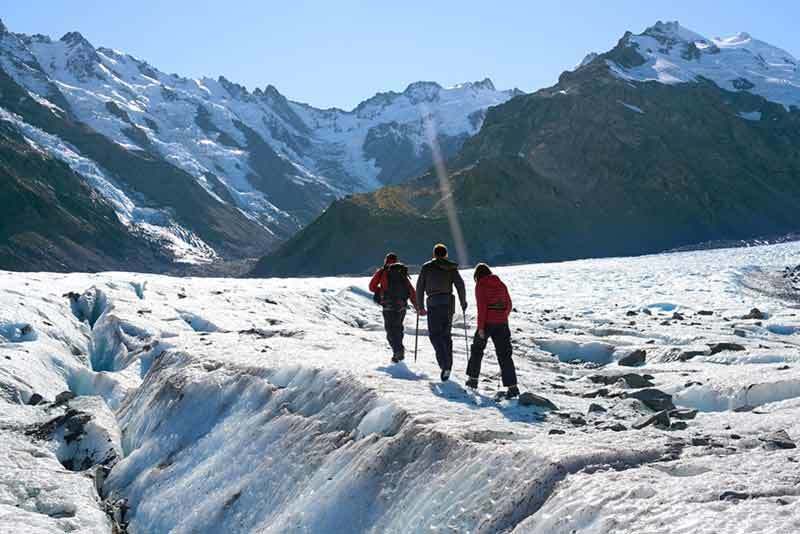 Icebergs of every shape and size periodically tear away from the glacier allowing you to touch and taste the 300-500 year old glacial crystals. 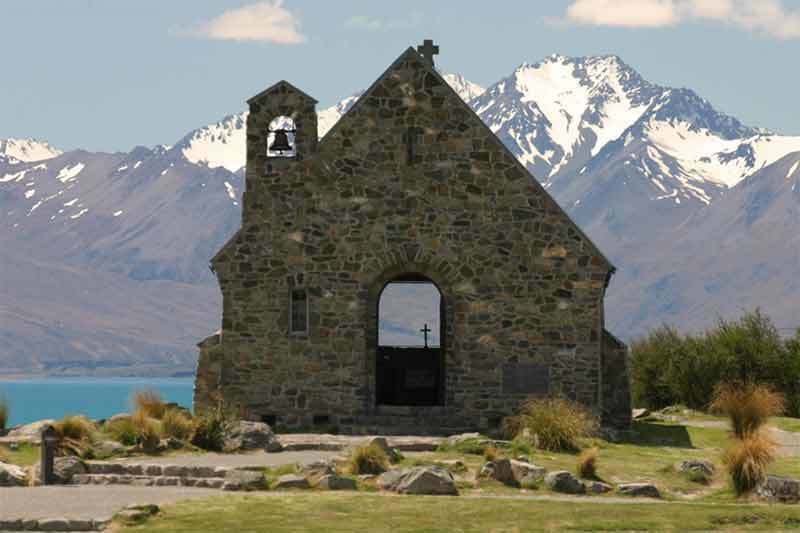 The Church of The Good Shepherd is located on the shores of Lake Tekapo, a favorite stop-off point for those driving to Christchurch. 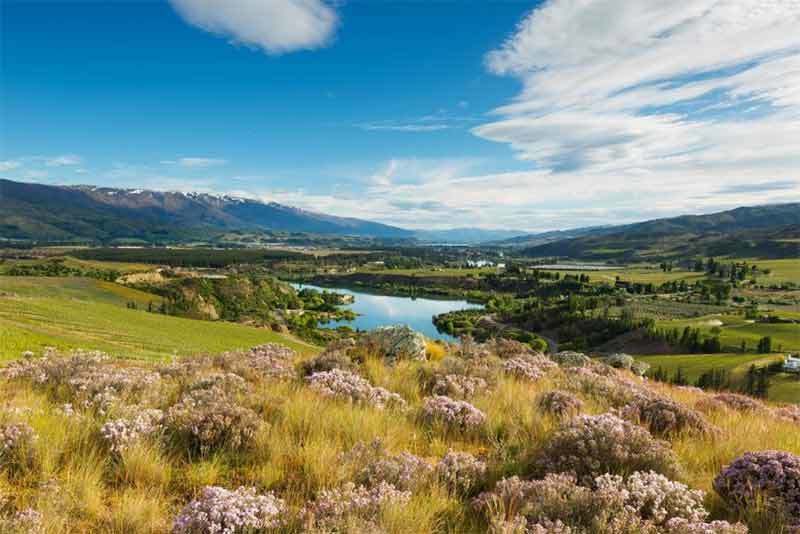 The golden brown hills and waving tussock grasses of the remote Mackenzie Country provide a superb backdrop to the miles of easy driving roads. 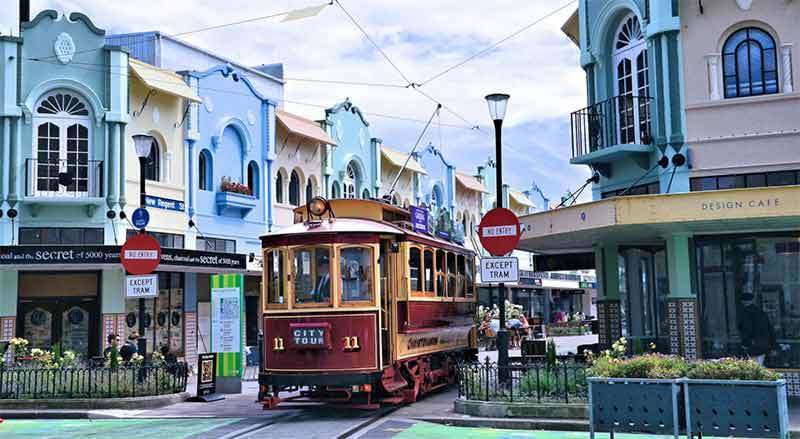 Geraldine is an attractive country town with an artistic streak, a great place for a lunch break or to shop for arts and crafts. 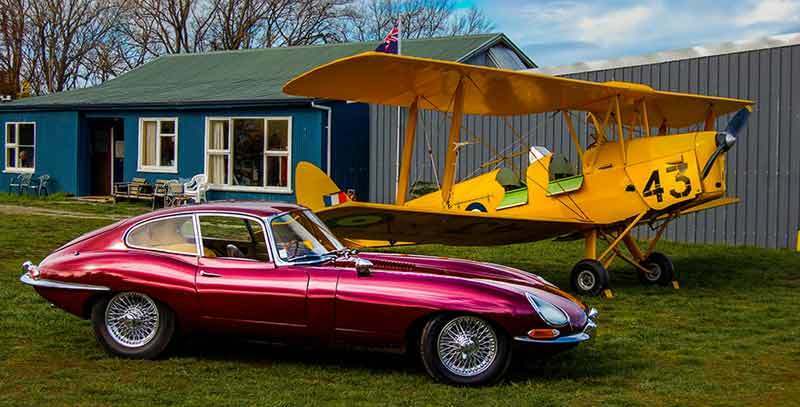 The town also has a highly regarded vintage car and machinery museum. 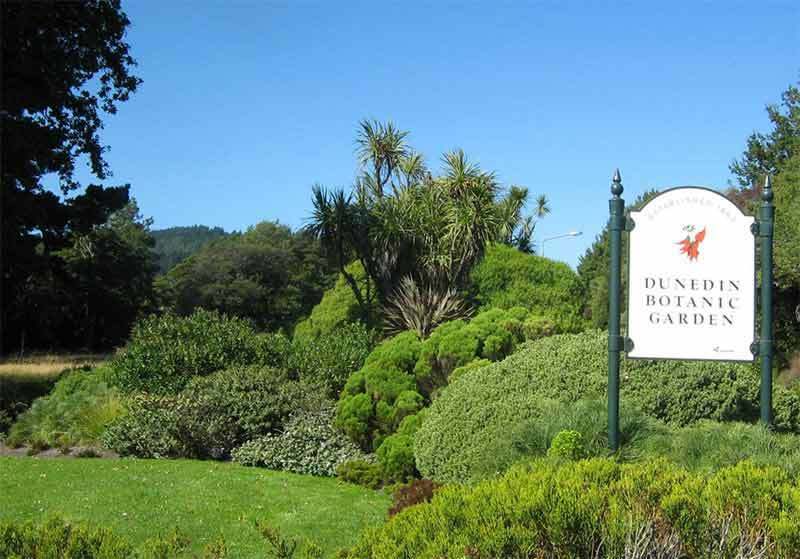 Just beyond the town, you can visit gardens and artists’ studios. 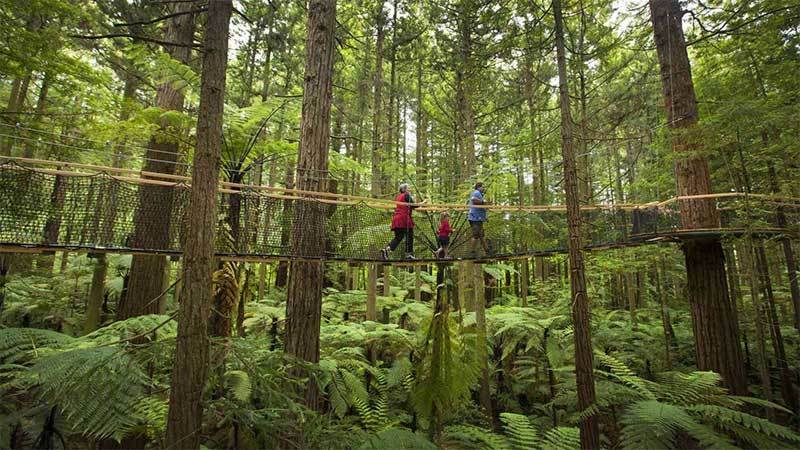 A short diversion, 15 minutes after leaving Geraldine, takes you to Peel Forest, over 1200 acres of pristine forest and over 20 walking trails.The suitably named Big Tree Walk of 30 minutes, begins at the Te Wanahu picnic shelter and leads into Mills Bush where fine specimens of huge 1000 years old native totara trees, one almost three metres across, are found.